BSA (Birmingham Small Arms) began the manufacture of machine-made guns in 1861. The company grew and expanded but a reduction in orders in the late 1870s caused problems and the factory was temporarily closed for a time in 1879 due to a lack of work. 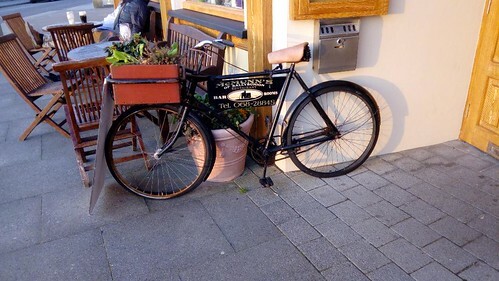 The decision was made to diversify and the company was to begin it’s early experiments in bicycle manufacture in 1880. The machinery used to make fire arms proved to be very adaptable into the production of cycles as both required high volume production of accurately made small parts. The production of bicycles ceased in 1887 due to a new contract for the War Office and the supply of new rifles to the army. 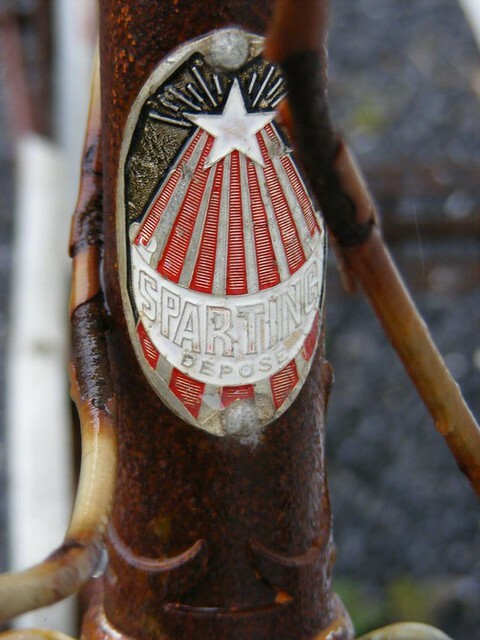 The company did begin manufacture of cycle components for supply to the trade in 1893 and also bought the Eadie Manufacturing Company and took over production of the Eadie Coaster Brake hub as well the two-speed Eadie hub. It also signed an agreement to commence building the Three Speed Gear Syndicate’s three speed hub under licence. BSA began the manufacture of bicycles again in 1908 and were to gain a good reputation for the quality of the products and engineering excellence. 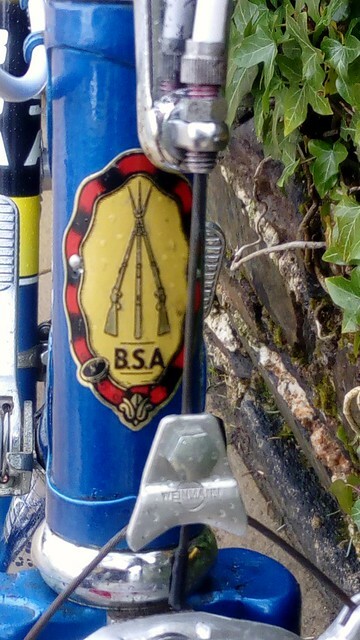 BSA’s hub gear was always said to be superior to the near-universal Sturmey Archer and the company was also to create an early form of cassette hub and derailleur gear system although it was not a success. The company’s firearms heritage can be seen on the headbadge emblem of three rifles. The company had also began manufacturing motorcycles with increasing success. The cycle and motorcycle divisions were split into two separate entities in 1953 and the 1957, BSA cycles was sold to Raleigh who spent most of the twentieth century buying up their competitors (Humber, Triumph, Rudge, etc). This was the beginnings of tough times for the British cycle industry as falling demands, greater competition from abroad and declining quality and some odd managerial decisions all had a detrimental effect. 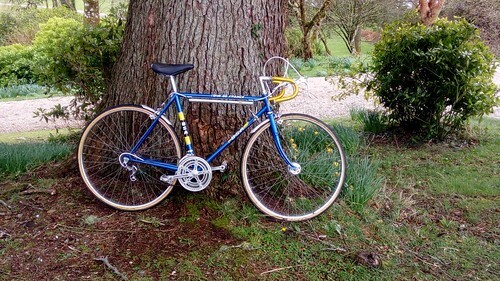 In 1976, the now Raleigh-owned BSA cycles was to introduce a new entry level racing bicycle called the Tour de France. The bike was nothing special in itself but seems to have been remembered fondly. Yet I’ve seen other online commentators call it little more than a BSO. The ones I’ve seen have all been in the same shade of blue and are definitely an attractive bicycle. A Tour de France has recently come into my possession so I would be able to answer the questions of what it was really like when I got it back on the road. It is a blue machine. It was actually in good enough condition when I got it. Everything pointed to a bike that had covered very few miles. The chromework and in some places the paintwork had unfortunately developed quite a bit of surface rust. The tyres had also suffered from old age and were perished beyond redemption. It was to prove one of the most straight-forward restoration projects I have ever undertook. Starting with the wheels, the chrome rims polished up to an acceptable standard. They are not like new as there is still slight pitting and one or two spots were a large blister of rust had removed the chrome plating. There is no doubt that the quality of the chrome plating on rims of 30s – 50s was much better than this. I then stripped, cleaned and rebuilt the large flange Normany hubs. No wear was in evidence and cup and cones cleaned up well and assembled with fresh grease. The rear hub had clearly taken a little moisture at some point however as there was some rust on the ball bearings themselves so I replaced the loose 1/4“ ball bearings with new ones. Once adjusted, the hubs now spin freely without any free play and pendulum using the valve stem, as described in old cycle service manuals. Cup and cone bearings are very simple things but it’s worth taking the time to adjust the pre-load on the bearings properly. All too often I see incorrectly adjusted bearing cones, even on brand new hubs direct from the manufacturer. If not adjusted properly, they will not wear as well and will also add to drag when riding. Two new Panaracer tyres in 27 x 1 1/4“ tyres and new tubes completed the wheel refurbishment. I would probably not have bought such posh tyres for this bike but I had these hanging up in my garage at home for a few years now as I bought them for my Carlton and then found that the tight clearances on that frame demanded 27 x 1 1/8“ tyres (the narrower size is more difficult to find and I’d hoped I get away with it but it was just too tight) and I decided I may as well use them. Unfortunately they proved to be the most troublesome aspect of the whole project as it proved to be incredibly difficult to seat the tyres on the rim properly. I’ve never found this problem with old non-hook edged rims before. I got the front one right eventually but need to have another attempt at the back one. I removed the square taper chainset (which thankfully came off very easily) and I gave the bottom bracket and head bearings similar treatment to the wheel bearings. Again, there was no wear in evidence and everything adjusted as if they were new parts. I stripped and cleaned the 42/52 chainset. I think the square taper suggests this is a late model Tour de France as they seemed to be originally fitted with cottered chainsets. 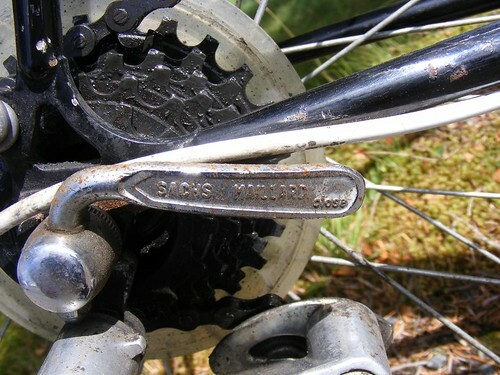 The cranks are Raleigh branded and the 42 ring is removable. Interestingly the cranks are 165mm. I would have expected the more normal 170mm. The unfortunate thing with this bike (and many other entry level road bikes, past and present) is the use of racing gearing. 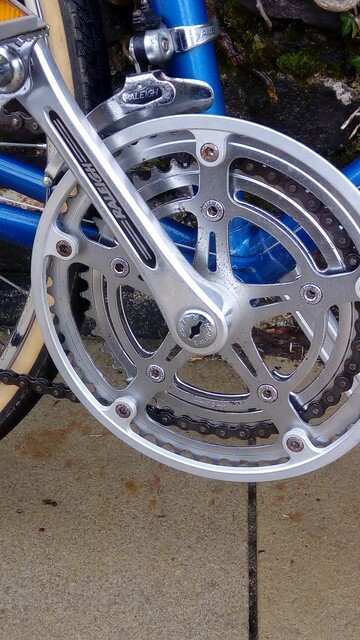 The inner 42 tooth ring when combined with the 24 tooth large sprocket on the five-speed Maillard block gives a low gear that isn’t low enough for most normal riders. It probably helps explain why this bike and so many similar bikes are often found in almost unused condition. I usually tweak the gearing on these bikes to give something lower but I decided to leave all as standard to see how I get on with it as I am now three stone lighter and much fitter than I used to be. I think I can manage… Besides having access to so many bikes, I can just use something else if I want to tour or do a really hilly ride so it is difficult to justify the expense of buying another chainset. The Weinmann centre pull brakes were stripped and cleaned as thet were tarnished and the opportunity was taken to clean and grease the moving parts. A tip I picked up from somewhere (can’t remember where now) is to put a small blob of grease on the points where the springs slide along the arms on Weinmann brakes (probably all calliper brakes) as the spring slides easier and the brake will be easier pulled and in the case of sidepull callipers, they will centre easier. I do believe there is an element of truth in this. Many “online experts” are really critical of centrepull brakes but they are actually really powerful if set up properly. They do require a determined pull on the levers I agree but if you put a bit of effort into it, they will work at least as well as any other calliper brake. I cleaned the frame and the handlebars/stem and it all cleaned up to an acceptable standard apart from some rust which had broken out around the bottom bracket. I sandpapered these localised rusty bits back to clean steel and dabbed in a little blue enamel paint with a small brush into the affected areas. It isn’t an exact match but will keep rust from developing into something worse and won’t really be noticeable to the majority of people who look at it. The bike has Benotto bar tape in a yellow shade which compliments the blue frame very well in my opinion. The bar tape shows some minor tears and scuffing which were probably acquired in storage over the years rather than by usage. I didn’t feel any need to replace it though. It is perfectly serviceable and I always prefer not to over-restore things or create unnecessary waste. Also you can’t buy Benotto bar tape any more (unless it’s new old stock). I like this type of bar tape, I find it more comfortable than some of the really heavily padded stuff on the market now (necessary I guess because modern road bikes are much harsher). 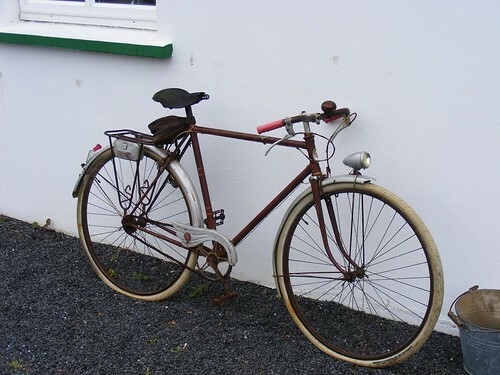 This bike was fitted with the little “shorty” mudguards which are totally useless (I guess they do keep dirt and water from getting washed into the lower head bearing) but were the ultimate fashion accessory back in the day. They were also the most corroded part of the whole bike. I did my best but they will never be perfect. It is tempting to replace them with proper mudguards but as they came on it, I will leave them alone. I have plenty of bikes with mudguards for wet weather riding. 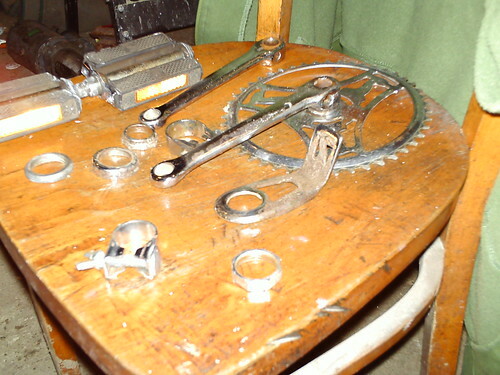 The bike was then re-assembled, using liberal coatings of grease on all fixtures and fittings. Greasing you seatpost and handlebar stem is especially important as it will seal water out of the frame and prevent seizure. It is worthwhile on any bike to remove the seatpost and stem every year or so and re-apply grease (and doubly so if the seatpost or stem are alloy as there will be a risk of galvanic corrosion between the aluminium part and the steel frame. In extreme cases, the seatpost or stem will be destroyed trying to remove it. With steel on steel, the chances are a bit better). 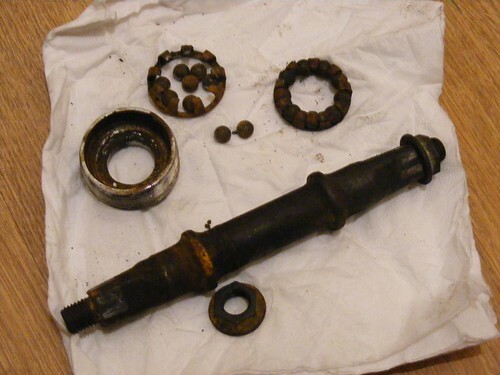 When I am re-assembling a bike after working on it (or on my car, tractor or anything else) I will usually apply a little grease to the threads of the nuts and bolts. When I was much younger and teaching myself mechanical skills on such diverse machinery from Raleigh Twenties to Ford Cortinas to Massey Ferguson 65s, this was normal practice as taught to me by my Dad and others but few seem to do it now. It is worthwhile for several reasons in my opinion and experience. It will make the nut easier to tighten. The grease will prevent corrosion so it will be easier to unscrew at some point in the future if there is a need to do so. Also, it might be counter-intuitive but greasing a thread will make it less likely to come loose in service due to vibration as the lubrication will allow the threads to take greater torque without stripping so the nut will be tighter and threaded fasteners rely on the tension between the parts to stay tight (this is why we have spring washers in certain applications; the spring helps maintain the tension required to keep the nut from unscrewing). My biggest concern in the whole project before I started was the rear derailleur as I got the impression the spring was broken in it when I removed the wheels to fit the bike in the back of my car to bring it home. It didm’t seem to take up the slack in the chain as it should do.The mechs seem to be Huret with Raleigh badging. I stripped it down and cleaned it and it turned out that it was simply so gunged up with a thick grease which was old and had gone hard. I cleaned it and re-assembled it with fresh grease and it seemed to be working as it should. There was some rusting on the chromed part of the derailleur body but not much I could do about that other than clean and polish it the best I could. With all the moving parts freed and re-lubricated, nice new tyres fitted and the bike fully re-assmbled, the next logical step was to venture for a quick test ride. I was only planning on doing a few miles but actually done around thirty. I all worked perfectly, just two issues presented themselves but I knew they would anyway – the seatpost is a bit on the short side for someone of my height and I will need to get a longer one so I can put the saddle where I need it for fully efficient pedalling. As mentioned the rear tyre needs another attempt to fit it properly as it’s not centred on the rim and it gives an unmistakable bump at higher speeds. When rotating the wheel before fitting the tyre, it wasn’t 100% true but well within tolerances and no obvious flat spots so I know this is coming from the tyre fitting. It is annoying though but tyres that seem to be too tight on rims seems to becoming more of a problem these days. If I simply can’t get it right, I will try a different type of tyre. Apart from those two things, I am really happy with the bike and how it rides. Perhaps it’s just because I have got used to plodding around on a mountain bike but it feels really responsive and handles well. The Huret gears with friction shifters may not change as silently or as quickly as the modern Shimano system with cut-away and contoured teeth (which come at the expense of durability) but with a little practice and mechanical sympathy, Huret gears change quickly, reliably and snap home with the with precision. I prefer friction shifters to indexed anyway. They need less time to set them up and will keep working reliably for years. A state of the art modern road bike road bike would have more gears on the rear cassette than I have in total. I don’t see this as a problem really. The most important thing with cycle gearing is having a decent range. This is where this bike falls short – it’s not that it doesn’t have enough gears, it doesn’t have a low enough gear for easy climbing for the average cyclist. A different chainset or freewheel block can correct this easily enough. 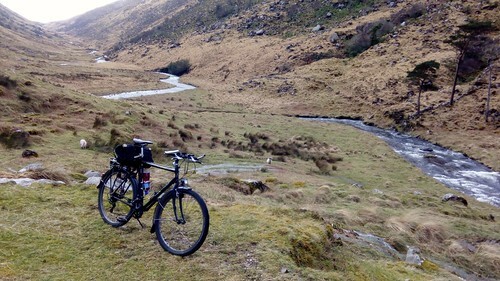 Having said that, the route I did around Churchill and Gartan takes in a fair amount of climbing and I had no trouble whatsoever despite the low saddle but I really attacked the hills and climbed out of the saddle. You don’t have the option of an easy ride with this. You really need to attack big hills or walk (good for average speed and fitness of course, perhaps BSA were on to something with these gear ratios!). Of course the option of spinning the low gears on climbs is less tiring so you could keep riding from dawn to dusk if you have touring gears. To achieve that on a bike with this gearing would need a much higher level of personal fitness (or a flat route). I can ride a bike without low gearing but it is definitely preferable to have it. None of that really matters though. The bike was able to put a smile on my face. It’s not particularly light by any standards but you would never notice when riding it. It responds well and feels confidence inspiring on fast descents. The Weinmann brakes are powerful and work better than could ever be expected on chrome plated rims (with original Raleigh Raincheater pads). 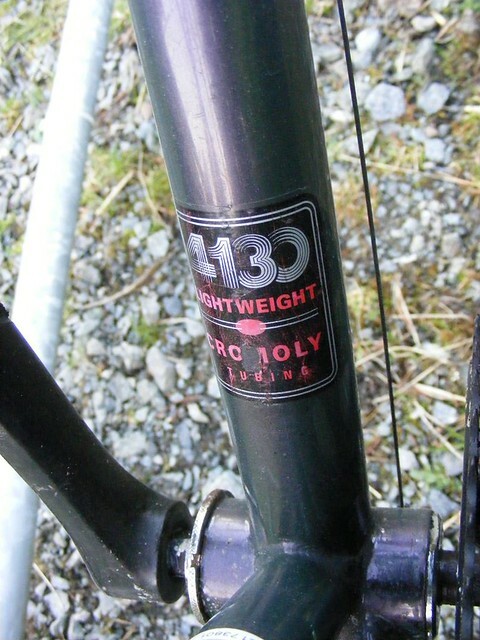 Just as I was musing on the step-through Raleigh Pioneer I rescued last year and also when playing with my Twenty before Christmas, Raleigh (and this is one, no matter what the BSA headbadge says) made great frames. Even their basic bikes ride brilliantly. I was also meticulous when assembling this bike. It shows in the ride. The other thing (which may be entirely a figment of my imagination) is that I honestly believe 27 x 1 1/4“ are the best all-round size for riding on tarmac. 700 x 32c may be the same width and only slightly smaller in diameter but they never seem to roll along effortlessly in the same way. This ride is the other side of cycling for me. The previous day I had made sedate progress on a hefty old mountain bike over almost fifty miles distance on a wide variety of road surfaces, stopping regularly to take photos or just admire the views. Today, I was riding a sportier, more responsive, more nimble bike and attacked the ride, completed at a much higher average speed and enjoyable too but tickling different pleasure centres. Neither approach is wrong, I’m just fortunate enough to be able to choose my bike and my type of route to suit the mood. The most important thing in cycling is to just enjoy it, no matter which bike you have! 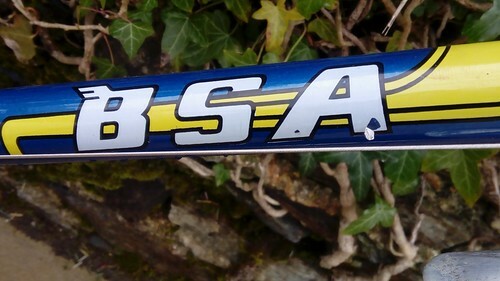 In answer to my own question about how good a BSA Tour de France actually is – this is an excellent bike which rides great even in standard trim. Don’t let the cycle snobs tell you otherwise. If you didn’t mind sacrificing the originality and could justify the expense, it would be interesting to see what this would ride like with a set of better, lighter wheels on it. Replacing the original chainset with something like 36/48 and maybe a 14-28 block would also transform the bike into something much more usable in hilly terrain. 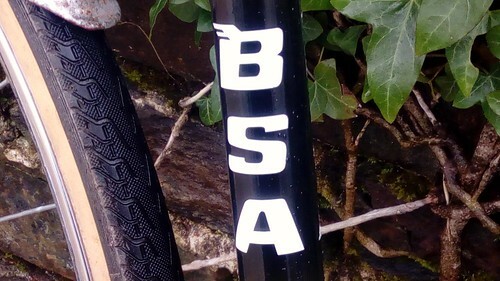 I like my BSA and although it won’t be my main bike, once I get a longer seatpost for it I certainly intend to clock up a decent few miles on it this summer. As before, I cycled to Churchill along minor roads and turned on to the bridal path over the mountain. I’ve come to really enjoy this route. It’s so nice to get away from motorised traffic. I can’t emphasise how nice it is to ride on routes like these, something I’m only now starting to appreciate as my various road bikes sit at home gathering dust. It was beautiful dry and sunny day although with a real nip in the air. The previous day’s snow could still be seen on some of the higher mountains. I was pleased I had worn plenty of layers. It might be the beginnings of spring but winter is not leaving without a fight. It would be warm in direct sunlight and cold everywhere else but I’m not complaining. Weather like this is infinitely preferable to endless grey clouds and drizzle. 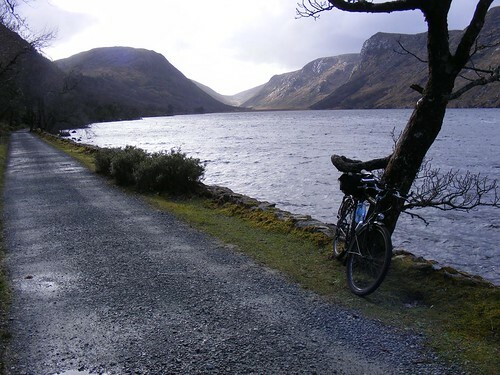 Eventually Lough Beagh comes into view and you make a left turn at a T-junction to follow the road along the lough shore to reach Glenveagh Castle. I took advantage of the covered in picnic tables behind the castle to eat my lunch in shelter. As this was St. Patrick’s day I was expecting a lot of people to be out and about but there was basically no-one at all. I guess the cold weather must have put people off. From the castle I continued on my way alongside the lough following the signs for Astelleen Waterfall (you can’t really go wrong anyway so long as you follow the lake). Eventually, the lake becomes a small burn (River Owenacoo) which feeds into the Lough. The water level was high today with all the snow-melt from the mountains. 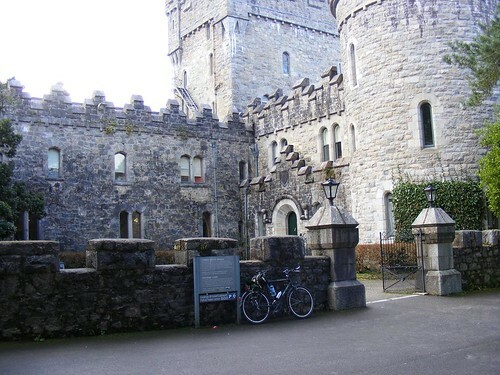 The road surface deteriorates after you leave the castle and is more loose and rougher but it’s not a problem on any bike with reasonable width tyres. There are a number of small waterfalls from the mountains (more were probably visible today than usual due to the melting snow) but the big one is known as Astelleen. I did cycle out here on other occasions and walked out tot he waterfall on many more occasions but this was to be my first time to venture beyond that. If I had read my map properly, I’d eventually be joining the R254. So it proved, although the distance was a little longer that I had expected and quite a bit of climbing was involved which were steep enough to call my 28 tooth inner ring into service. It is well worth it though. The scenery is nothing short of amazing and freed from the constraints of the traffic on a normal road, you can quite literally stop where you feel like and go as fast or as slow as you want without any other road-users to consider. I think I met just one group of hikers this far away from the castle. As you go along, the road does indeed deteriorate although the surface remains easily ridable. It just gets narrower. It may only be about three feet in width in places although this isn’t a problem when there is no-one else there! I guess in peak tourist season, this path would experience more hikers and probably a few mountain bikers as well. When you reach the R254, it is worthwhile to take the time and to look back. You are quite high up at this point and you can see the river and path snake through the deep-sided glen and see the lough in the distance and I think that this may actually be one of the best places from which to view the “Glen of the birch trees.” I was actually very tempted to return and trace my steps but I had been determined to make this a circular route so would continue along the R254 back towards Churchill. I will do this loop in the opposite direction at some point. I think it would be worthwhile as you often see everything in a different perspective. The ride back to Letterkenny was relatively uneventful on little trafficked road. The R254 must surely be one of the best cycling roads in the country although I wasn’t on the most interesting parts of it (I would have needed to go in the opposite direction towards Doochery for that). 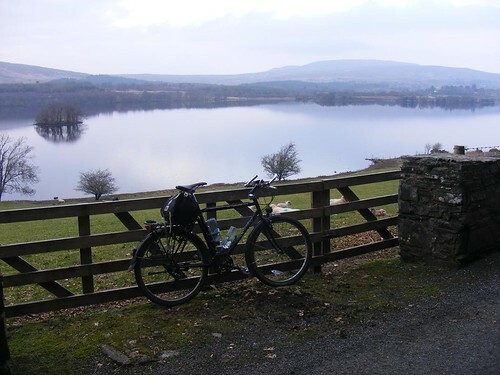 I didn’t take the direct route but explored a little around Lough Gartan and I actually did one of my regular training loops in the opposite direction from normal which gave me a whole different perspective on it. I managed to make it all into a ride of just little short of fifty miles in length. No personal bests were achieved during the course of this ride. It is entirely possible I achieved a few personal worsts as my average speed was very low at times. I don’t actually care, speed isn’t the point of a ride like this. If I had just wanted to go quickly I would not have been riding this hefty, upright and un-aerodynamic bike and I would not have selected this route with large parts of it surfaced in gravel. There is a time and place for enjoying a fast ride on lightweight road bike but I think too many of today’s cyclists are missing out on the simple pleasures of a relaxing ride with no stress or rush, the freedom to stop when you feel like or make an improvised detour should the mood take us. Life is simply too short to waste rushing around like an idiot! As traffic levels get ever higher and speeds and lack of care towards cyclists in this county (from a minority of drivers it must be said but there are enough of them around to at best take the fun out of it and worst, make it downright dangerous and token law enforcement and no political will whatsoever from our elected lords and masters to improve matters. 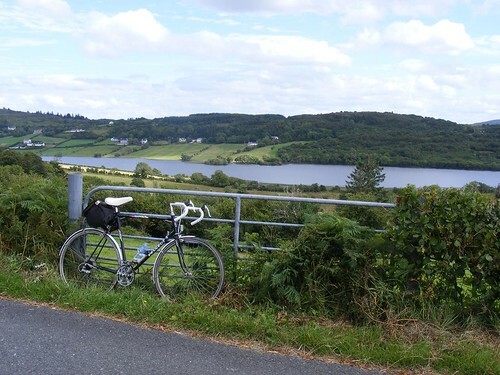 I am still waiting on a response from my local TD to an email I sent him on my concerns on the issues of road safety facing cyclists and pedestrians in the Letterkenny area several months ago. Sadly I am not surprised by this silence. The car is king and the driver can do no wrong in this county.) so it was my intention last year to explore options for cycling away from the traffic. With this in mind I had dredged my old 1990s mountain bike from storage and gave it a bit of a re-work and put it back into service. 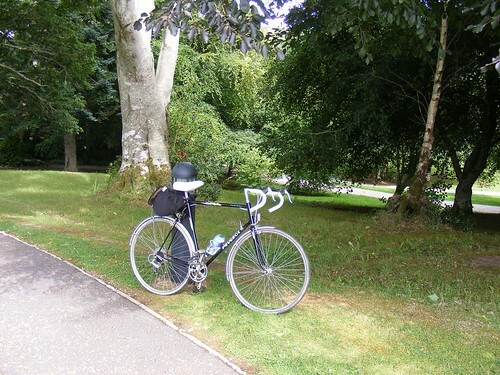 I did ride it a lot actually, several thousand miles and several tours and I found it made an excellent touring bicycle. I even completed a century ride on it last summer. I did though, ride it mostly on the road and hadn’t really done much of what I had planned to do with it. I did get some respectable miles in over Christmas and New Year and had actually started riding fixed wheel again with the intention of improving my fitness over the winter but I was then put out of action by a horrible cold which seemed to take forever to get completely better. There is always the risk of making it much worse or developing a chest infection so apart from some short utility rides around town, I hadn’t really done any cycling at all from the beginning of January until now. I wanted to get back out again on the bike. I had done a twenty mile ride and had felt okay so today I decided to push it a little more and to also explore an off-road ride I been meaning to try for a while. 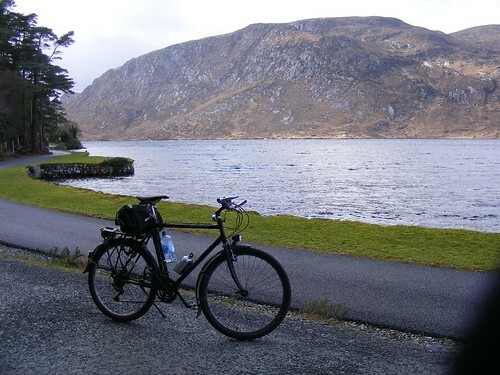 I would ride the twelve miles or so to the Glebe Gallery on the road and then use the shared use path to ride to the Glenveagh National Park through the mountains and past Lough Inshagh. The ride to the Glebe was completed along minor roads which were blissfully traffic free when I left at around 10AM. I really enjoyed the ride despite tha cold wind and was happy to have some sort of fitness once my legs warmed up after the first few miles. 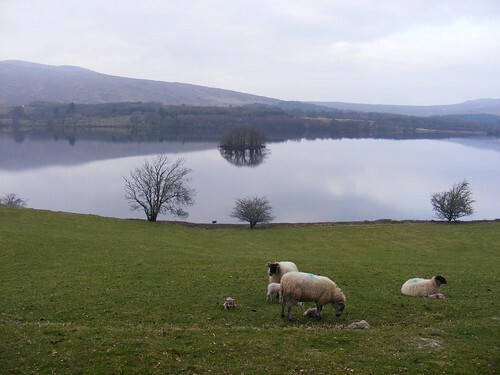 The Lough Inshagh walking trail is supposed to be from Glebe House to Glenveagh Castle but in reality it starts a mile or two past it from where the birthplace of St Columbkille is. There would usually be a gate to negotiate but it was conveniently open today. So I met a Mitsubishi Colt despite the no motor vehicles sign! There really is no getting away from cars! It was being responsbily driven to be fair. The Lough Inshagh is more like a farm lane really, surfaces vary a little from hard-pack stone to loose gravel. It presents no problems to any bike with practical tyres. You could easily ride this on a tradional touring bike on 32mm tyres (at least when it is dry like it was today) but I wouldn’t venture along here on high pressure racing slicks. This is not a route for the carbon fibre brigade. My 26“ X 1.9“ semi-slick Continental tyres were in their element here. 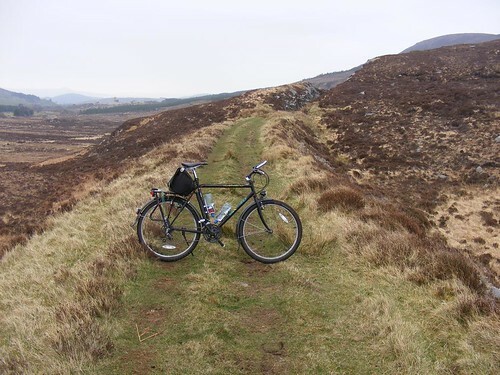 It is for routes like these that I put this bike back into action and opted for semi-click tyres rather than full road tyres which are usually recommended for old MTBs. Even on a normal road, I cannot tell any noticeable different in rolling resistance between these tyres and the Schwalbe City Jets which I had on it before anyway so there is no real reason not to choose the semi-slick option and it gives you better off-road capability should you feel like doing so. I found it an easy route really. Obviously you would go faster on a metalled road and as you might expect considering you are in the Derryveagh mountains there is a fair amount of gradient although in this direction the climb is gradual and I had no need for anything lower than 38/24 although I did get out of the saddle to climb on a few occasions. It was a nice day if sometimes a bit overcast. There were occasional threats of rain which never materialised. The views across Lough Inshagh and towards Muckish mountain are good here despite the mist which sometimes descended. 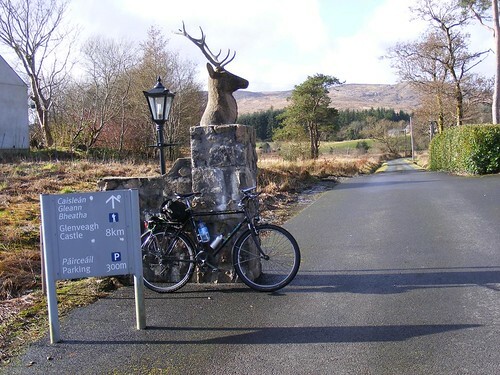 The distance to Glenveagh Castle isn’t huge (about six miles) but it took longer than I expected (I guess I am used riding on surfaced roads and my fitness isn’t where I’d like it to be at the moment). On routes like this you also have to be respectful of any hikers you come across and a bell is worthwhile in my opinion if you are sharing routes with people on foot. There were some walkers but not that many on this cold February day. Do this in summer and I’d expect there would be many more. 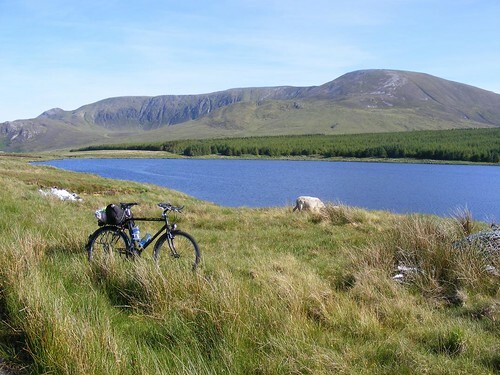 Even if the average speed is low (and why would anyone rush a ride through such stunning scenery anyway?) it is much more pleasant to mix with the hikers and exchange pleasantries and occasionally stop for a chat than it is to mix it with high speed cars on the main roads. This must have been what cycling was like before the Great War I guess. 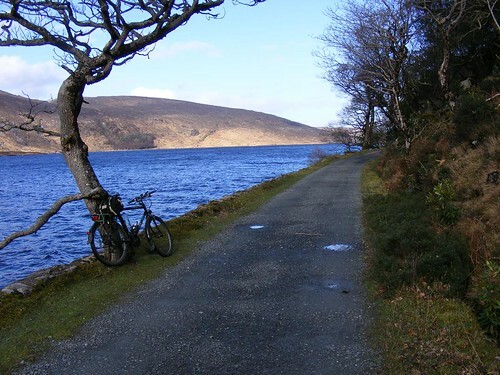 Eventually the Lough Inshagh route joins the path which leads from the Glenveagh National Park visitors centre and car park to the castle. There were more pedestians here and I also came across a few cyclists. Someone on a modern road bike was brave enough to ride the surfaced road road used by the shuttle buses. I remember from riding this on my Raleigh Twenty many years ago before the cycle/foot path was laid that the people who drive the shuttle buses here are impatient lunatics. I stayed on the shared path! I wanted a relaxing day with no hassle. I even respectively obeyed the “no cycling” sign for the final few hundred yards through the garden and wheeled my bicycle. It was obvious that recent storms had done some damage to some of the trees in the garden. I ate my lunch at the covered picnic area behind the castle. It was cold and I had considered buying some nice warm soup in the cafe but it seemed very busy and I couldn’t be bothered waiting for a table. What to do next was the question on my mind. I could have ridden on past the castle toward the waterfall (I have done this previously on a three-speed roadster but I had arrived at the castle by road on that occasion. 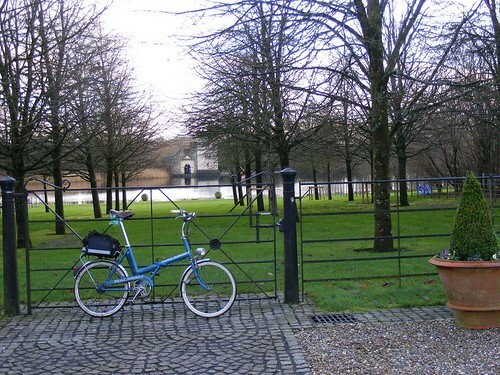 I documented this ride on this blog a few years ago where I also told the history of the Glenveagh Estate. I could have ridden today’s route on a roadster too and it would have worked well enough but I think I would have been over-geared and ended up walking large parts of it). I have also walked this route to the waterfall quite recently with a friend.. 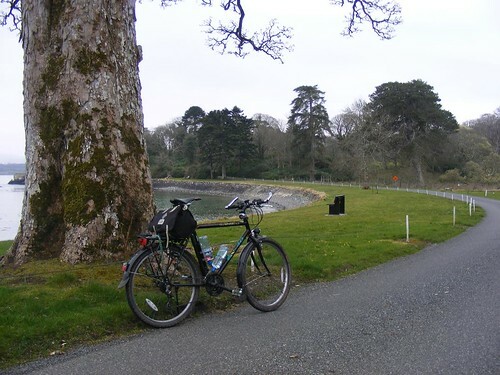 I have never went beyond that but I understand that it eventually joins a minor road where I could have cycled around the other side of Lough Gartan and back to Glebe House. This is something I want to do at some point in the future really but the days are still short (I do have good dynamo lamps on this bike but it would be a bit pointless in the dark as I wouldn’t have seen the scenery) and it would also have added up to big miles in lumpy terrain and I need to be used to doing long rides again I think before doing this. Returning to Letterkenny by the road was also an option but it wasn’t what I was trying to achieve today. I would go back the way I came. It is always tempting to look for other options to return from somewhere but there is also merit in re-tracing your steps as the same thing can look different when viewed from a different direction and so it proved today on the Lough Inshagh route. The most obvious thing to start with is that the climbing is much tougher from this side. After leaving the Lough Beagh shoreline, I must have spent two miles in my inner 28 tooth ring. This is the other advantage of riding an old mountain bike for touring purposes – they came with really low gearing as standard. Also the large 2“ wide tyres remove the harshness of unsurfaced roads if you run them at the correct pressures. I have seen online articles suggesting to pump them up to 80 or more PSI. Don’t do this. It defeats the purpose of having wide tyres in the first place and will actually increase rolling resistance on most surfaces. Eventually I reached the top and from there it was easy again. I took the time to visit the gardens at the Glebe House again (I wrote about Glebe House previously) for a stroll and to enjoy the extra daylight we are now getting before returing home again. I like Glebe House. The gardens are stunning and a nice place to spend time. Many snowdrops were in evidence at the moment. I always like to see the snowdrops. It means spring is coming soon and new growing season commences. From there, the ride home was uneventful. I covered a total of forty-two miles. Not a huge amount but enough and thoroughly enjoyable. I am happy with my fitness. I thought I would have struggled to complete this but it wasn’t too bad at all. This is the advantage of having low gears I guess. I look forward to doing the longer version of this ride at some point later in the spring. I have also some better wheels I have acquired for this bike so I look forward to fitting them an some other changes as the new wheels will necessitate a change from thread-on five speed freewheel block to seven speed cassette hub so I will gain a few extra gears and I have also a new crankset as my current (non-replaceable) middle 38 tooth ring is very worn and on it’s last legs. I expect having better quality (though old second hand) hubs with lighter wheels will make some difference from the current bottom of the range hubs (they’ve never given any trouble to be fair). 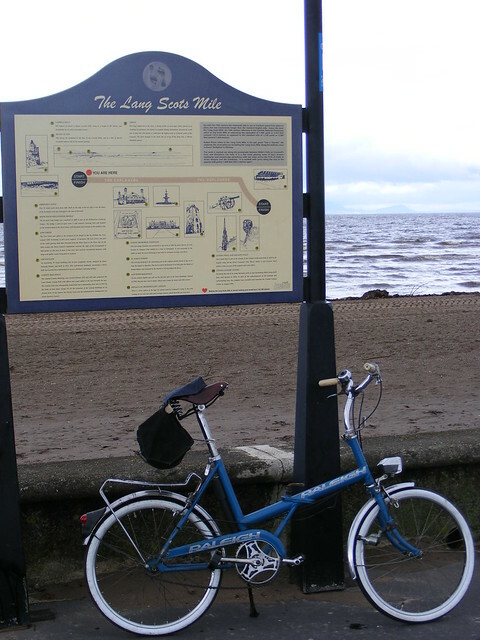 Thanks to the influence of Alex Moulton, small wheel bicycles were very popular in the 1960. In some ways a small wheeled cycle makes more sense than a large wheeled one, especially for utility riding. A small wheeled cycle can be easily adapted to suit virtually any rider, short or tall, young or old so they don’t need to be produced in a range of frame sizes (also, many small-framed large wheeled bikes have been compromised in their geometry to fit in the large wheels). All other things being equal, a small wheel will be stronger, better for carrying loads. A small wheel is also lighter and has less inertia so it is easier to accelerate such a bicycle up to speed. Small wheels also lower the centre of gravity and leave more space for mounting a box or a basket for carrying groceries or other heavy items. I’ve noted this recently with the T-Bag I bought for my Brompton as it has huge storage space and does not make the bike feel in any way top-heavy as it would do if I were to use a large bag or basket above the front wheel of 26″ or 700C sized bike. In fact, I feel the Brompton handles better with a weight on the front end of it. People will mention rolling resistance but for a utility bike, this is largely irrelevant for the distances most people are riding around town as they go about their business. 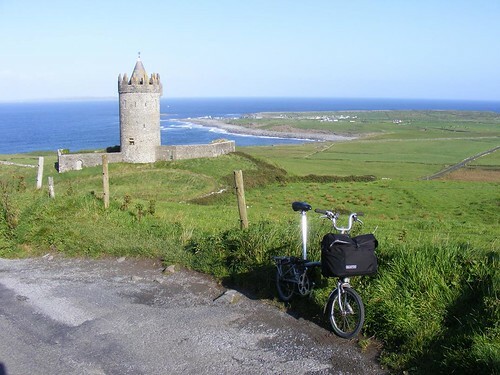 Besides I’ve done half-century plus rides (the longest was 85 miles around the coast of County Galway last summer on the Brompton) on small wheels and I don’t believe the difference was truely noticeable. I doubt you could win the Tour de France on a small wheeler (although it should be remembered that the more sporty versions of the Moulton were used to set some very impressive times in the 1960s) but for most of us, we are not riding (or capable of riding in most cases) at that level and cycling can often be more enjoyable if we slow it down and take in the scenery. Back in the swinging sixties, Raleigh’s take on the Moulton was originally a 16″ balloon-wheeled bike called the RSW16. It undercut the Moulton on price but it was inferior, the wide low pressure tyres had high rolling resistance (they went down the low pressure tyre route I guess as the Moulton had suspension and the RSW16 didn’t). They tried again, and in 1968, the ubiquitous Raleigh Twenty was born. It was similar to the RSW but had 20 X 1 3/8″ wheels (usually, I believe export models were fitted with the slightly smaller but wider BMX 20″ sized wheels) and it worked much better. After a slow start as Raleigh didn’t promote it much to begin with, it began to sell well and the RSW16 was killed off due to the success of the Twenty. 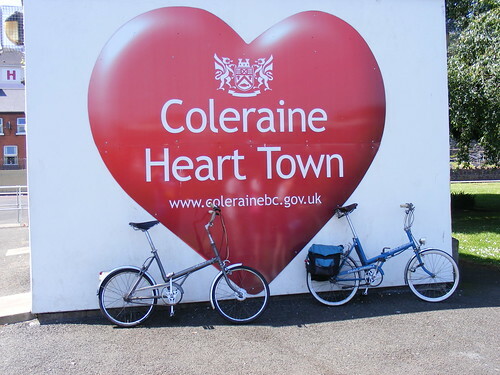 It was to be produced in Nottingham and also several other countries including the Dublin Raleigh factory that existed until 1976 and also in New Zealand. The New Zealand version differed in not having the small bracing struts at the bottom bracket. It was produced as a single speed, a three-speed and for some markets with kickback hubs or coaster brakes and was marketed under a myriad of the different brand names that Raleigh had acquired over the years (Sun, Triumph, Hercules, BSA, etc). 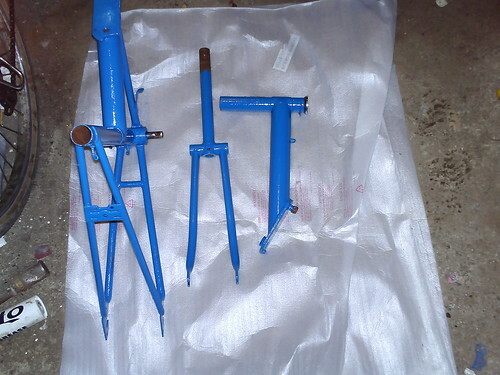 A folding version was introduced in about 1970. Today, collectors like to fawn over the high end Raleigh and Carlton lightweights that they produced in in that era, but for much of the 1970s, the humble Twenty was Raleigh’s best selling bike with 140,000 being produced in Nottingham alone in 1975 although sales did start to tail off in the late ’70s and production ceased in 1984. As a child, I remember that were to be found on every street corner and yet today, they are a rare sight and increasingly valuable. If I see one now, I stop for a look at it if I can. I do know of one that seems to be in regular use. I will admit a special interest in the humble Twenty as I was given a tatty and abused family hand-me-down version as a child. To the best of my knowledge it has been in the family from new and dates from 1971 (assuming the back wheel was original). 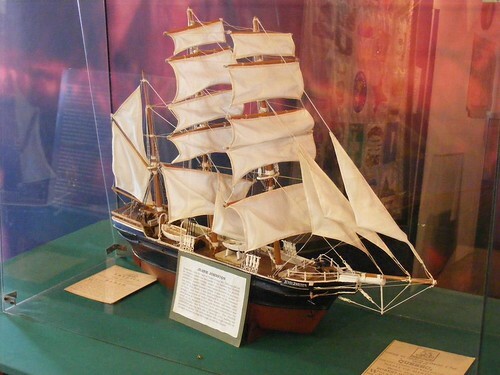 It is also a Dublin-built model. I rode everywhere on that bike in my formative years and it kept going despite a complete lack of maintenance or any kind of care. I did re-paint it at one point in bright red, I guess I probably didn’t cover huge mileage on it but it certainly got regular use. More interesting bikes came along and the Twenty languished in the back of the coal shed for many years until I decided to restore it about 12 years ago. It was rather the worst for the wear and neglect and considering how cheaply they could have been bought back then, it would have been prudent to have just bought a better one. However, my enjoyment in these things comes from nursing things back to life rather than the actual finished product. Fortunately I did it back then rather than now as the price of bits and pieces on Ebay has gone mad. I paid the princely sum of 99p plus carriage for a set of replacement wheels as the originals were very rusty and not very round any more. Replacement mudguards (posh chrome plated ones no less!) and a replacement 26TPI bottom bracket were also sourced form Ebay. 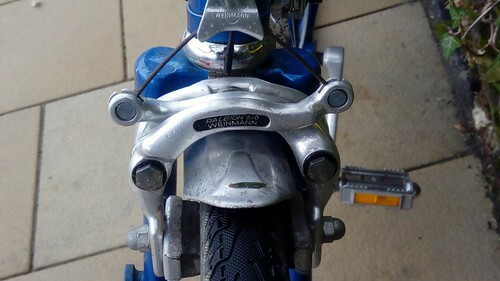 The headset was also very worn and attempts to shim the nylon bush which was used on these bikes rather than a conventional bearing race on the top were unsuccessful. The steerer is threaded however, albeit in Raleigh 26TPI standard but I bought a 26TPI headset and found a way to work it in despite the pinch bolt for the adjustable stem being in the way. I would hate to think what it would cost today to have bought these parts but back then, such things only cost a few pounds. Fitting a proper headset was to transform how the bike rode although I’m sure the nylon bush arrangement worked fine before it wore out! The frame was stripped back and given a coat of Ford tractor blue (mainly because I had spare paint from the Ford tractor I had restored a few years earlier but I have always liked that shade of blue) and generic Raleigh decals were also bought online. New tubes and whitewall tyres replaced the booted and patched originals. I did the best I could to polish the bars, seatpost and rack. The end result looked pretty good I felt. 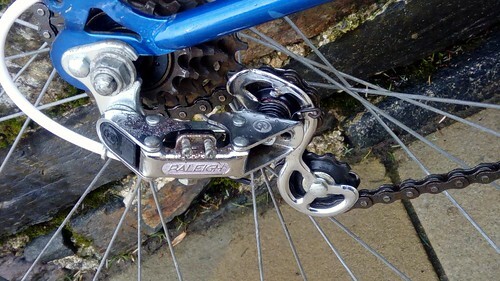 I made one further modification, the biggest fault (in my opinion) that the standard Twenty had was that it continued Raleigh’s long tradition of building commuter bikes with gear ratios best suited to time trialling. 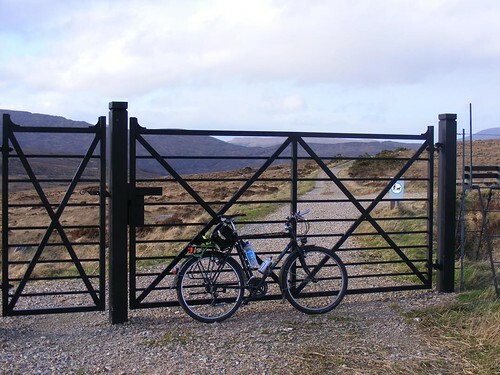 Certainly it made riding them in the hills of Donegal more difficult than it should have been. I changed the rear sprocket to an 18 tooth to give three sensible gear ratios. Over the intervening years I haven’t rode it very much in reality. I rode it a good bit just after I restore but most of my cycling in those days was carried out after work and as winter arrived, I did fit some period correct lighting but I had other bikes with better modern lights so it was put away. 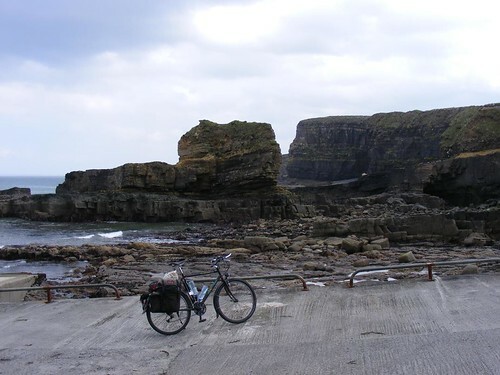 I rode it mostly on NI VCC rides and also I used to occasionally fold it and put in the car when on trips to Portush to visit family and some of my most enjoyable rides on this bike have been leisurely all day rides along the coast from Portush to the Causeway, Ballintoy or sometimes Ballycastle in the winter time when traffic is light and the skies clear blue. Given the terrain, this mightn’t seem like an ideal bike for these routes but I found it coped fine. I may actually repeat this some time early in the new year for the nostalgia factor. 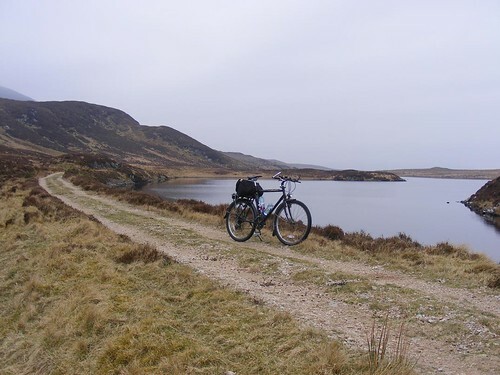 I also once took it to Scotland in the car and rode a good few miles along the Ayre/Galloway area. It occurred to me recently that I hadn’t rode it in about two years! There are several reasons for this and also acquiring a Brompton which works much better as a folding bike was a big factor. I decided it was time to put that to right so I unearthed it from it’s storage and gave it some lubrication and pumped the tyres up and it was good to go. I should perhaps have cleaned the cobwebs and dust from it first! Also the chrome needs a good clean and polish to prevent rust getting a hold of it (my own negligence I know) and bell seems to have lost it’s cover for unknown reasons. I had done several short rides on it over the past month when visiting home where it is stored in my parents garage but today I decided to venture further for an afternoon ride. I had only a few hours to spare, the bike is called a Raleigh Twenty so a Twenty mile ride seemed a good idea! The route was nothing special – just a twenty mile loop from my homeplace around Raphoe and Convoy that was one of my regular training rides when I lived there so one I know well and one I’ve done on everything from 28″ wheeled roadsters to my 531 framed fixed wheel Carlton and everything in between so I would be able to accurately access the Twenty in comparison to other bicycles. 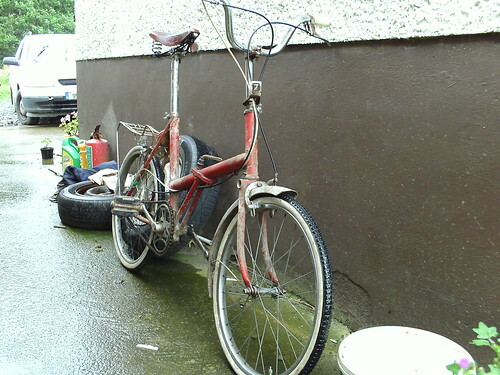 If this was Raleigh’s best selling bike of the 1970s, is it still relevant today? Well yes, I think so. I had forgotten how much fun one of these is to ride. It’s not a racing bike but it rides just as well as a full sized 26″ wheeled three speed (possibly a little harsher on bumpy roads than a full sized roadster but never bone jarring, certainly more comfortable than any modern alloy or carbon bike) and you can’t help but smile when you ride one. This is proof yet again that enjoyable cycling need not be expensive. Considering no effort was made to rush and I did stop for photos, I feel I covered the rote in a decent time too. Cottered cranks, cup and cone bottom bracket, steel wheels, hefty steel frame, hub gears – all things that today’s weight and image obsessed cyclists would shun, and yet if it’s put together properly it all works perfectly and will continue to work for decades. The Twenty is a hefty lump, even compared to other similar bikes like the Dawes Kingpin but it was a quality machine dating from before the time of the throwaway society. Time brings progress and it’s modern day equivalent would be lighter with better brakes (brakes on steel wheels today get a lot of bad press online and there is no doubt riding fast in wet conditions on an old racing bike needs anticipation but for whatever reason, the brakes on my Twenty have never given any cause for alarm, they work great in the dry and acceptably well in the rain. Must be to do with pad compounds) but the Twenty will probably outlast them and fifty years after it’s launch it will still put a smile on the face of the rider. I’d say that Raleigh got it spot on (apart from the idiotic gearing in standard trim). 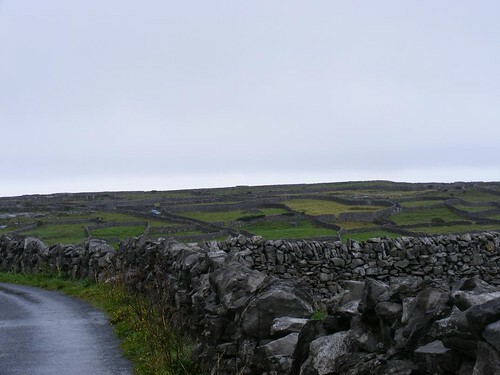 One of the (many) places I passed through on my Wild Atlantic Way tour which I had decided I would like to return to for further exploration was Doolin in County Clare. 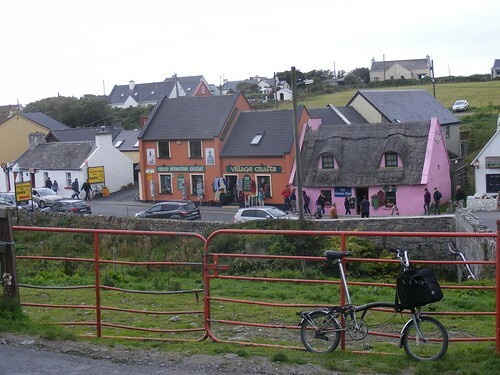 Doolin (or Dúlainn) is coastal town on the edge of the Burren area of county Clare and is built on the Aille River. The town itself is small but quite scattered over a relatively large area. The reasons to visit it are many. 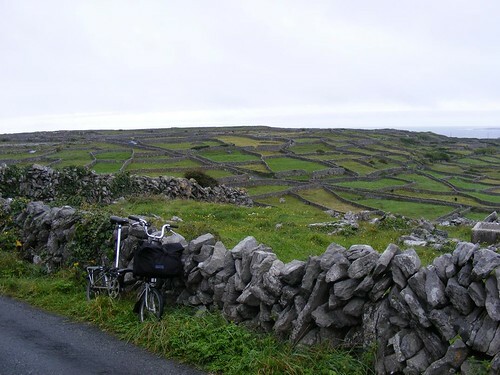 It is a good base for exploring some of the most beautiful landscape in the country including the fabled Cliffs of Moher and The Burren, it is a relatively flat area for cycling, you can catch ferries to the Aran Islands and the live traditional music scene in the town is legendary. It is also one of the hubs of the National Cycle Network which promises some nice cycle routes on lightly trafficked roads. When I was here before earlier in the year I was only spending one night and passing through on my coastal journey. 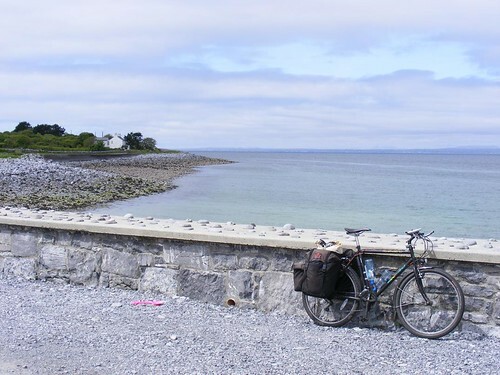 This time I would go directly there and spend four nights with plans to visit one of the Aran Islands and also the Cliffs of Moher as well as explore some of the signposted cycle routes. I would base myself at the Rainbow Hostel where I stayed last time and highly recommend. On Satruday evening I arrived after a tedious five hour car journey complete with Brompton and checked in to my accommodation. 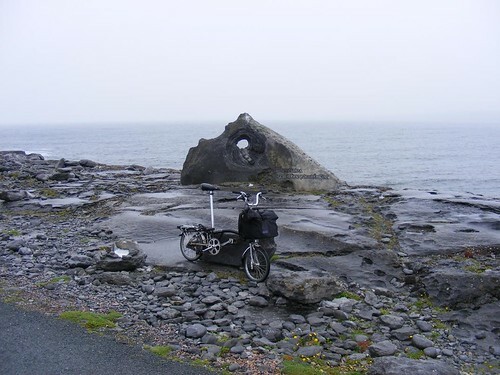 I decided to take the Brompton as it rides well, packs easier and would be easier to take on the ferry to the islands and in this area, three gears are perfectly sufficient. I just relaxed really on Saturday evening, walked around the village and harbour areas and sampled some of the live music sessions in progress. 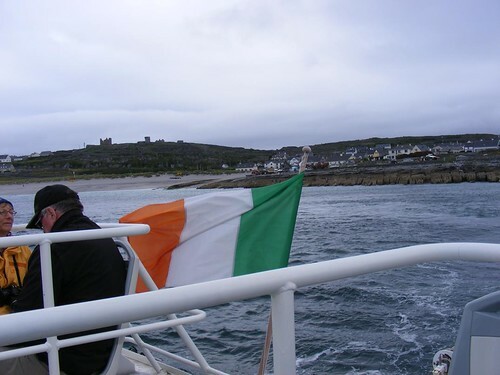 Tomorrow I would start with the early morning ferry to Inis Oírr, the smallest and closest of the three Aran Islands. It was a difficult choice really but locals told me that Inis Oírr was the most scenic and as it was also the smallest at roughly three square miles, I would have a whole day to explore it properly. It was my first time to use my recently aquired Brompton T-bag which I instantly decided is an excellent piece of kit, worth the expense as it’s practical and well made and very spacious. 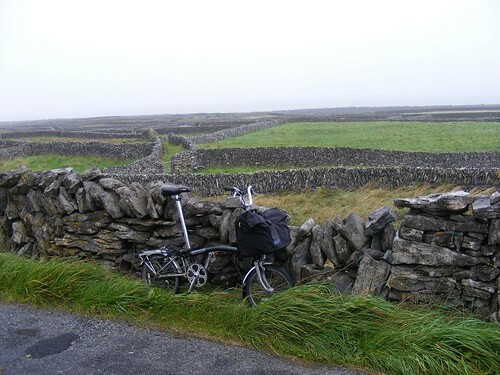 With it, my Brompton now becomes a valid touring bicycle, on other occasions I had tried to use it for touring, strapping a rucksack to the carrier was less than ideal. I wouldn’t need all that space on this occasion but was able to take my lunch and camera, some waterproofs and spare clothes as the weather would be very mixed and have plenty of room to spare. The rear facing bottle holder is also very practical. The whole bag can be easily unclipped and used as a large shoulder bag too which is good if you were doing mixed mode travelling with buses or trains. I am very impressed with it. I got the ten o’ clock ferry, the earliest available and the crossing takes twenty minutes. 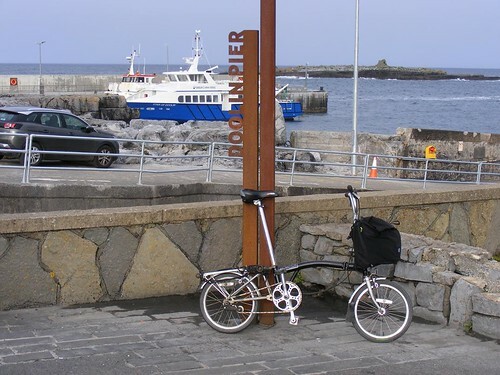 The fact that a Brompton effectively bends in the middle at the rear hinge if you pick up like you would a normal bicycle confused the ferry staff when they lifted it on board and I would get jokes about my “wonky wheel!” The ferry crossing was quite rough but I enjoyed it. I always enjoy being on board a boat. 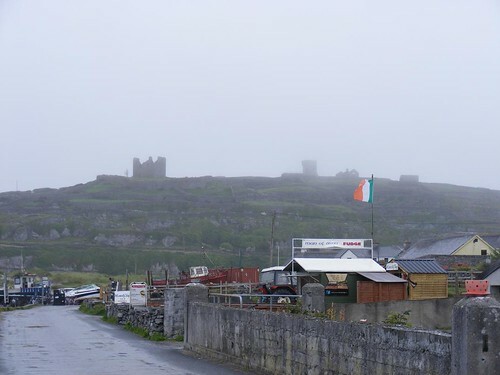 The early morning brightness I had experienced in Doolin had gradually disappeared and when we docked at the island pier the day was quite over cast and misty with a slight hint of rain in the air. After leaving the boat I stood on the pier and looked around me. The mist clung to everything and the air felt damp despite the strong wind. The island actually had the feel of a small remote fishing village ( I suppose that is what it is in many ways) with a beautiful beach near the harbour, a lot of houses (and also pubs, shops, etc) in the immediate vicinity of the harbour and the ruins of O’Brien fort overlooks the harbour from it’s prominent hilltop location, as it has done since the fourteenth century. 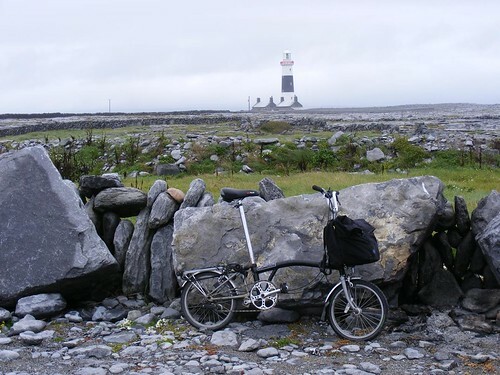 The Aran Islands have an unusually temperate climate and frost or snow are almost unheard of on the islands. As the soil temperature usually remains above the 6C required for growth these islands actually have the longest growing season of any part of the British Isles. 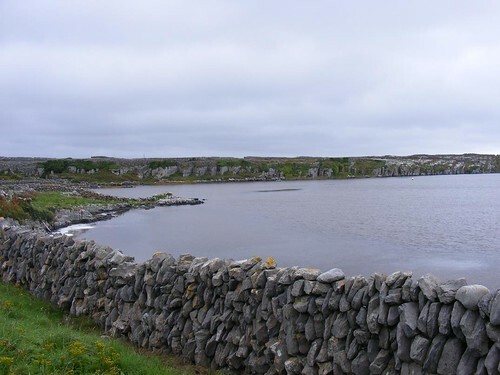 The islands are really an extension of the Burren and the small fields are the results of years of building soil by creating layers of sand and seaweed on top of the rocks. Stone walls abound on the island and I was to be grateful for the shelter they were to give me in the face of the Atlantic winds. The island currently has a population of around 250 people. I believe the Arans only really became heavily populated during the Cromwellian period when people were forced to flee their land by the English forces (to Hell or to Connaught). 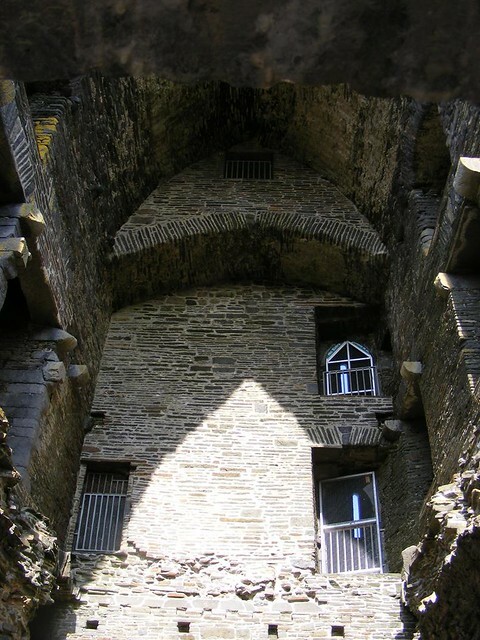 There is evidence of monastic settlements dating back much further than that. 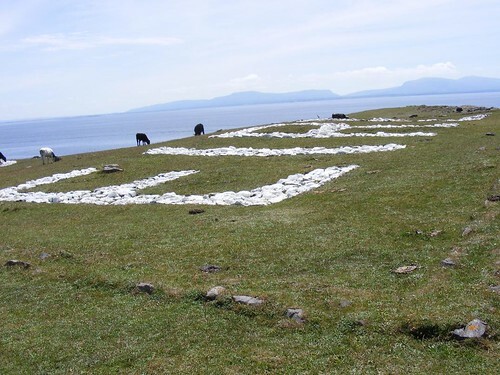 The earliest sign of settlement on the island is the Cnoc Raithní, discovered in 1895 which dates back to 1,500 BC. Up until relatively recently, the islanders were self-sufficient in most things. 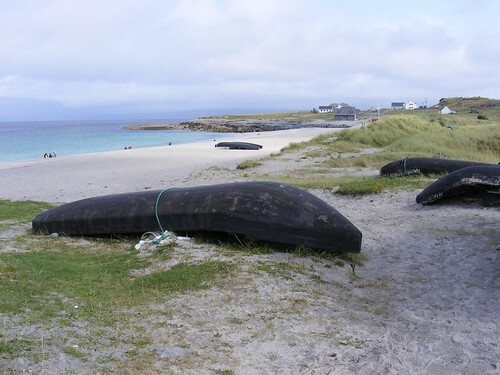 Cattle were led to the mainland by being tied behind Currachs – the traditional west of Ireland lightweight fishing boat which is noted for being surprisingly seaworthy even in heavy seas. Many of these small boats are still in evidence. 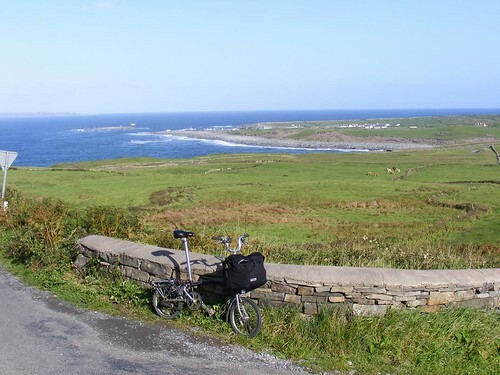 I enjoyed riding around the island, there are no hills to speak off and it is easy terrain despite the fierce Atlantic winds. 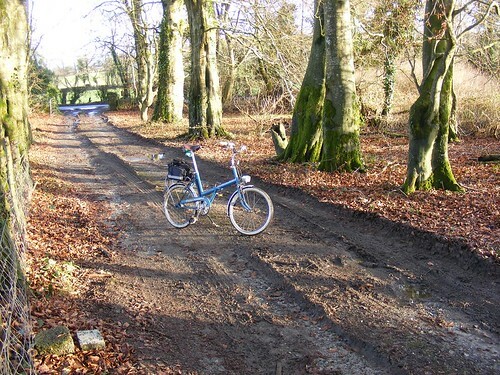 It may be small in size (3.1 square miles) but it contains a bewildering amount of roads and paths, the more important ones are surfaced, others are just grass or stone but I found no difficulty on the Brompton on any surface. 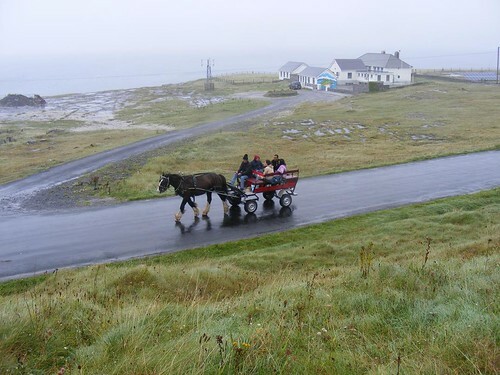 It is possible to take guided tours of the island by pony and trap and just about the only traffic I encountered anywhere was of the equine variety with a few of the small 3 cylinder Zetor tractors which seem to be the prefered power on the land on the island. I couldn’t help feeling the rust-resistance of these little tractors in the face of the salt-laden air is a tribute to the quality of Czech engineering as the few British tractors I did see had long since lost the battle against rust. Somewhat amazingly on such a small island I was able to find enough roads to keep me riding almost continuously apart from occasional photo or food stops for several hours. When the weather suddenly improved and cleared, giving the views for which the island is famous, I did most of it for a second time! It was an enjoyable and relaxing day, nice to get away from the huslte and bustle and traffic of the mainland for a time and there was much to see, including the endless and fascinating stone walls, the beautiful memorial to those lost at sea, the lighthouse, O’Brien’s castle and various other ruins, and also the wreck of the Plassey, made famous on the opening credits of the Father Ted TV series of the 1990s. The Plassey was originally a steam trawler launched in 1940 as the HMT Juliet. It was converted to a cargo ship in 1947 and was acquired by the Limerick Steamship Company in 1951 who renamed it as the Plassey. 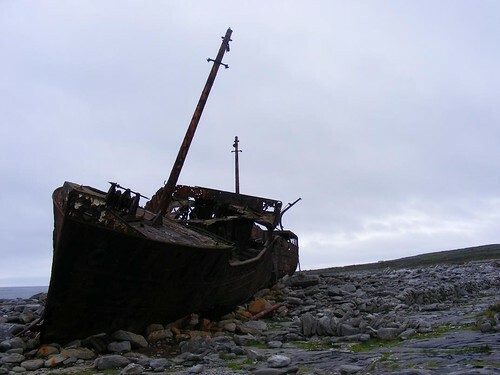 It ran aground and was wrecked during a severe storm in 1960 at Finnis Rock. Thankfully all crew members were rescued. A subsequent storm a few weeks later washed it above the water line where it has remained, now very much the worse for corrosion but I guess it’s almost 80 years old. I caught the late evening ferry back to Doolin, the crossing being much smoother and in nicer weather than the voyage out. Unfortunately I missed the photo opportunity of a lifetime when a dolphin jumped out of the water at the stern of the ferry but such is life! 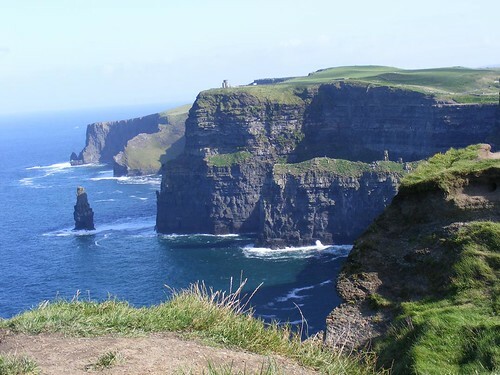 My plan for the following day involved a visit (my first) to the fabled Cliffs of Moher – one of Ireland’s most iconic scenic beauty spots. I did pass by earlier this year but it was extremely foggy at that time so wasn’t ideal for sight-seeing. There was to be no trouble with fog today, the weather was a clear, crisp, sunny Autumn day, not especially warm but it was dry and mist free with the promise of seeing the cliffs in all their glory. 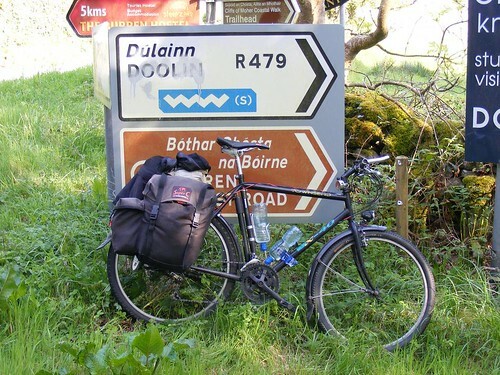 It is a short ride of about five miles from Doolin to the visitors centre. Some climbing is involved but I found it very easy on my Sturmey hub gear. I didn’t follow the main route completely but used the sign-posted cycle route 2 which took me on to some minor roads which were a delight to cycle on and past a tower of which I could find no information (I admit I didn’t try too hard!) but was clearly private property. 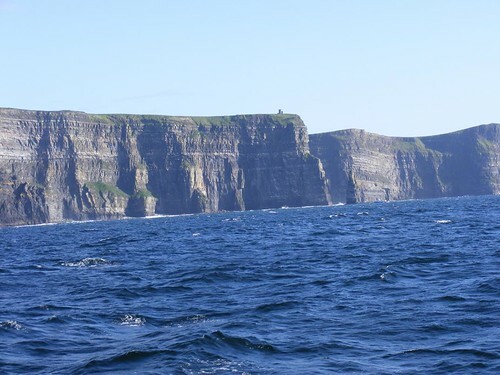 The cliffs extend for about eight miles and the high point is 702 feet above sea level ( much lower than Sliab Liag in southwest Donegal) at the point where O’Brien’s Tower is built. 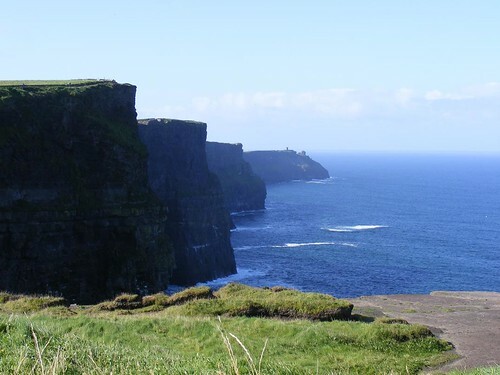 About 1.5 million people visit the cliffs every year. 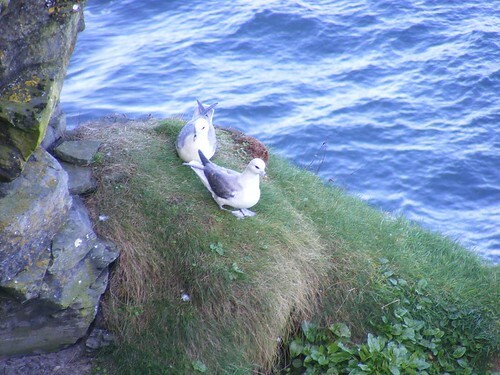 The cliffs are mostly shale and sandstone and home to an estimated 30,000 pairs of nesting birds of 20 different species. They take their name from the old promontory fort called Mothar which stood at Hag’s Head. 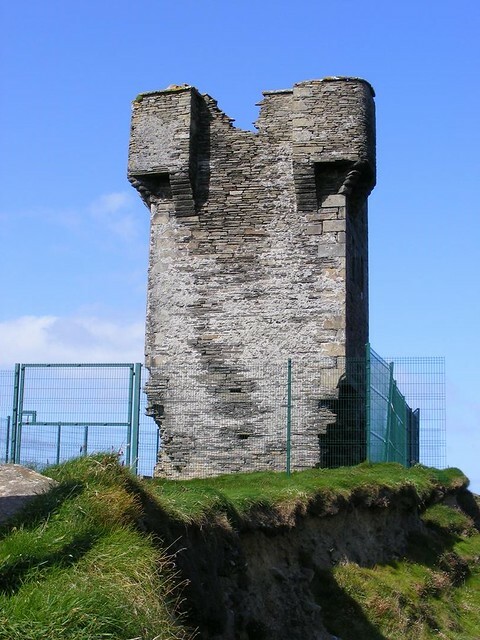 It was demolished in 1808 and the stones were used to build the lookout/signalling tower like so many of the others around the Irish coast in case of possible French invasion during the Napoloeonic Wars. 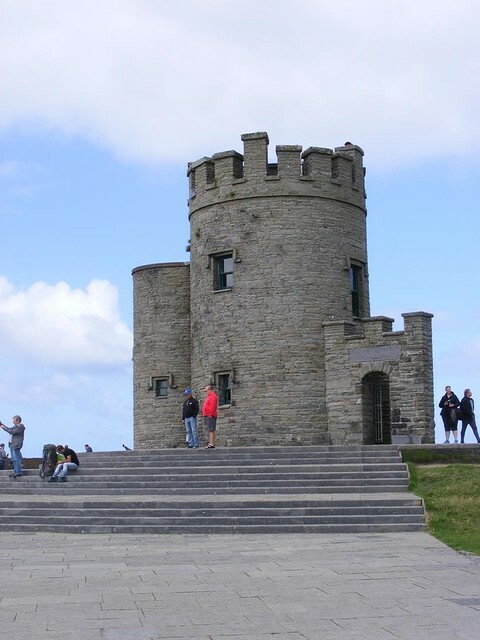 I locked my bike at the visitors centre and walked from O’Brien’s Tower to the Napoleonic Tower (where I sat and ate my lunch) and back again, probably about a two hour hike in total and it was indeed very enjoyable. I toyed with idea of completing the whole looped walking route which would have taken me back to Dooolin eventually and then driving back to collect the bike but elected to continue cycling. 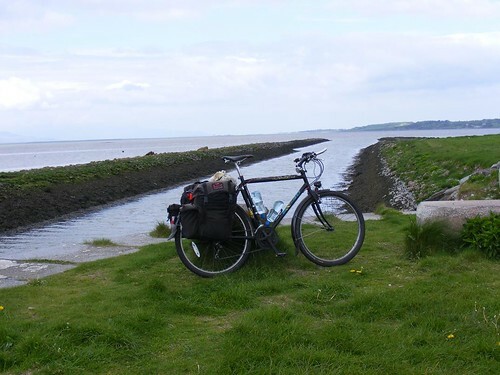 I completed the whole of the Route 2, 39KM according ot the tourist information and it is a very nice route, one I would recommend and it should be within the capabilities of most riders. 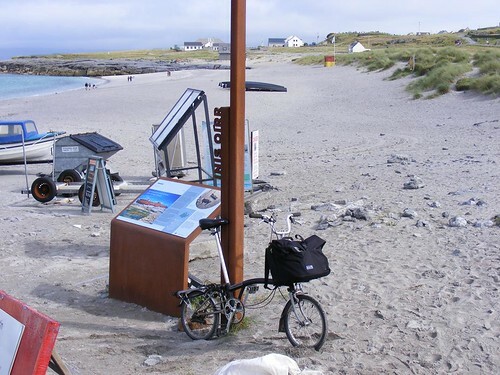 When I had arrived back at my bike at the bike rack, I found a Canondale Tandem chained up beside it and got talking to the owners who were a couple from Belfast who were cycling the Wild Atlantic Way on the tandem. I arrived back in Doolin earlier than I had expected and found I was in time to catch the final sailing of the Cliffs of Moher tour boat. Since it was such a nice evening, I decided to do that and it in itself is very worthwhile as you get a different perspective on the cliffs from sea level and are actually better able to appreciate their beauty. 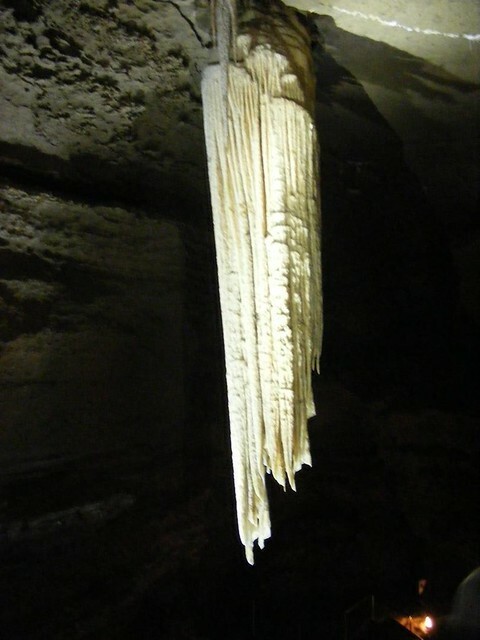 Day three, and my final full day in Doolin, my plan was to visit the Doolin Cave (Poll-an-Ionain) where one can see the largest Stalactite in the northern hemisphere. 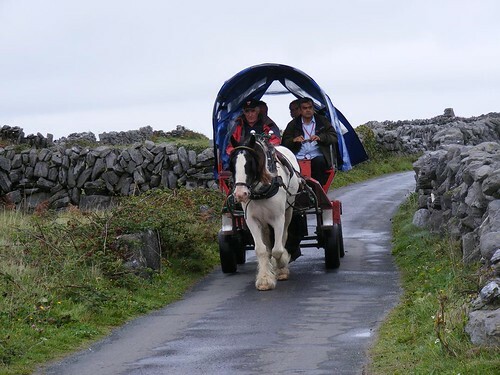 It is a short ride of a few miles from Doolin to the cave entrance and visitors centre. 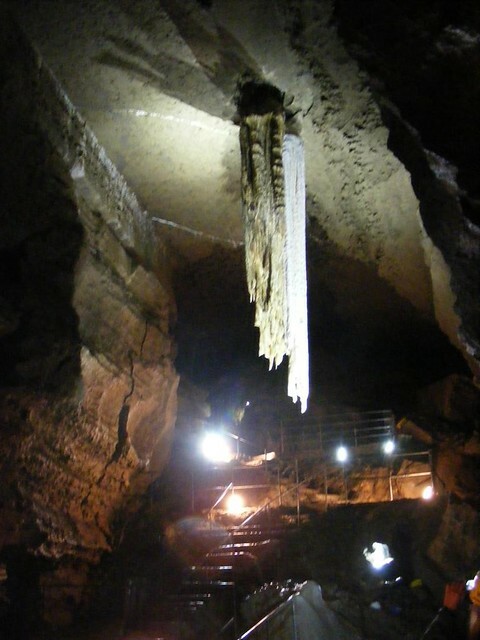 The Stalactite is just over 200 feet below the ground and a lot of stairs leads to it and there is the need to wear the supplied helmets underground as it’s very easy to hit your head on the low passages in the low light conditions. The tour is excellent and very informative but I found the cave very claustraphobic and was pleased to get outside again. The cave was discovered in 1952 by two English men – J. M. Dickenson and Brian Varley, After the underground tour, you can walk around a very nice park area with many varieties of goats and sheep on display. After the tour, which didn’t take very long, I had the rest of the day to contemplate cycling. 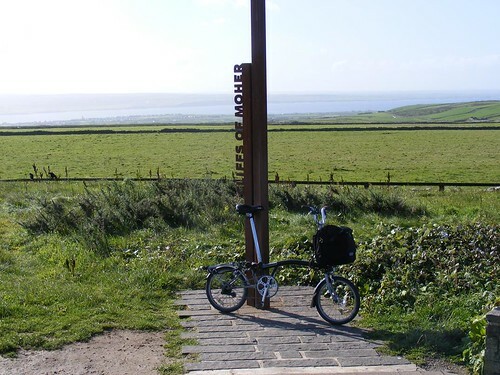 I decided to follow more of the signposted routes, starting with route number 3 which took me through Lisdoonvarna, but as it was still early and such a nice day, I also added route 4 to my ride taking me towards Lahinch where I was to stop for food and also called at the other highlight of the day – Poulnabrone Dolmen, which is the oldest dated megalithic monument in Ireland and the second most visited site in the Burren (after the cliffs of Moher). It is classified as a portal tomb and archaeologist Anne Lynch who carried out investigations in the 1980s found the remains of 21 bodies. The site was in use for a 600 year period with oldest dated remains dating from 5,800 years ago. The human remains show evidence of hard physical labour and one of the remains has an arrow-head embedded in it suggesting some sort of conflict. It is a fascinating site to visit and as always with these things, you are left with the question of how they got the stones into position. It is older than the Great Pyramids! This was in many ways the most enjoyable day of the trip as it was all very relaxed and I probably covered in excess of about fifty miles through some beautiful scenery on perfct cycling roads. Yet again (as in all my trips to the south-west of Ireland) the standard of driving and respect shown to cyclists and pedestrians by drivers show just how terrible and selfish the attitude of many drivers in the north of Ireland actually is. This was probably my last tour of 2018, and the only one completed from a fixed base as on the others I was always moving to a new destination each night. There are pros and cons to both methods of touring. Finding yourself in new surroundings each morning adds it’s own interest and you can cover greater effective mileage as you don’t have to return to base but on the other hand, once you settle in to your accommodation, it feels like home and is nice to go back each evening. Usually the bikes I write about on this blog are cosmetically challenged and could be described as rustbuckets. Today I am going to write about one which isn’t! I own many bikes. Too many really. One of my personal favourites is one I had actually almost forgotten I had. It was languishing in the back of a shed covered in dust. 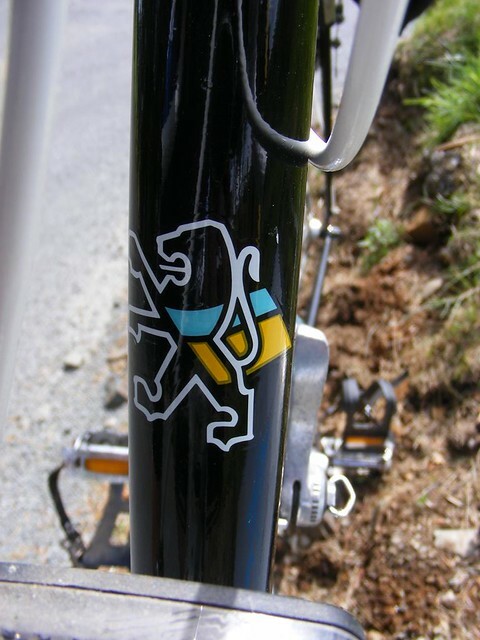 In the great scheme of things, it is nothing particularly special – a late 1980s Peugeot Pantera with HLE tubing. I bought it from Ebay on whim a good few years ago. To be more precise, I put in a low maximum bid never expecting to get it for so little but I was lucky for once. I hadn’t expected to win the auction and having done so, I had to make the long, tedious drive to Belfast to pick it up. It’s amazing how my view-point has changed along with my fitness – today I’d probably take the bus or train to Belfast and ride it home! The seller had been accurate in his discription. It is in almost timewarp condition but had definitely seen some use. Clearly the original owner had taken care of it. A few minor paint chips and ideally the back wheel should probably be rebuilt with a replacement rim as there is a slight ding in it but the wheel remains true and it doesn’t interfere with braking. I think it is a very attractive bike in it’s black and white colour scheme. The original Michelin whitewall 23mm tyres were very badly perished when I got and as I don’t like such skinny tyres as they don’t suit the roads I ride, I decided to replace them with 28s. I don’t normally bother with coloured tyres but wanted to keep the black and white theme so I decided to get whitewalls. 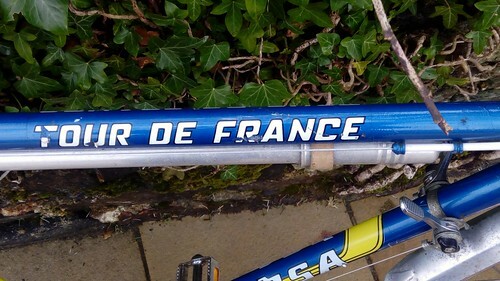 Given that this is a French made bike with mostly French components, I wanted Michelins and would accept no substitute! A set of Michelin Dynamics in 700 X 28c with whitewall tyres were purchased. I took the opportunity time to service and re-grease all the bearings, and I discovered the rear axle was slightly bent so sourced a suitable replacement. Everything else was in perfect condition. This was before Shimano almost monopolised the cycle component market so I have Maillard hubs, Stronglight cup and cone bottom bracket and a basic Stronglight 42/52 alloy chainset, Stronglight headset, Maillard 14-24 six speed freewheel block, Sachs-Huret mechs and shifters. I found the bike fantastic to ride but the gearing was higher than ideal for someone of my fitness in the my local terrain. I had a Stronglight 50/36 chainset I had purchased for another project on which I then used something different so I put that on the bike and it made a huge difference.I rode the bike quite a bit that summer, though only on longish Sunday day rides on sunny afternoons and I also took it on a few V-CC rides. It had no lights, I didn’t want to subject it to winter salt on the roads so I put it away for the winter. I mostly rode fixed wheel in the winter in those days anyway. I did ride it a little the following summer but not a great deal. I had started to get in to touring and had re-configured my Viscount Aerospace in touring trim and I mostly rode that. The Peugeot was put away for the winter again. Only this time it didn’t get resurected when the weather improved and Spring arrived. It sat in storage for several years and I had almost forgotten about. A lot had happened in my life in the meantime and my head was elsewhere rather than my bikes so it languished in the shed at my parents house along with most of my other bikes. I suddenly remembered about it and decided I’d like to ride it again. I also knew that I should fit replacement brake cables as the Weinmann brakes were not what they should be. I had already bought the white brake cable and replacement fake leather bar take I needed to do this a few years ago but hadn’t got around to it. Normal braking service was now restored although it would probably benefit from a set of better brake blocks as well. Unfortunately the brake hoods had suffered badly from old age and are falling apart. I’ll have to source replacements for the Weinmann levers. I’ve now put a good few miles on in the past week, mostly twenty or so miles after work most evenings as I continue to enjoy our unusuallt dry summer and can confirm it really does ride well, very responsive and very smooth. I decided to take it on a little local loop of perhaps fifty miles or so on Sunday. 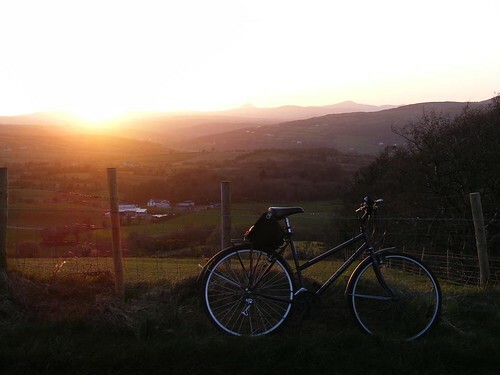 My ride would take me on the mostly untrafficked back roads from Letterkenny to Kilmecrennan. From there I would have several options. I elected to visit Doon Rock, a few miles North-West of Kilmecrennan, just off the main N56 on a road which would eventually take me back to Churchill. Doon Rock is noted for several reasons. 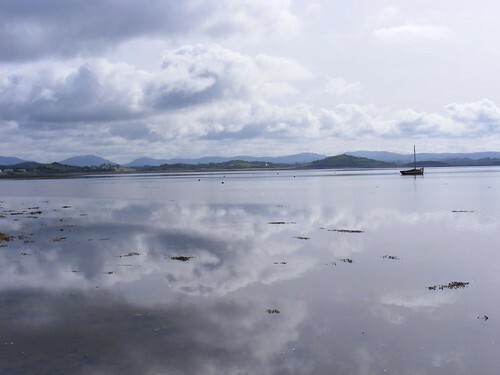 The Rock of Doon was where the coronation ceremonies of the O’Donnell chieftains took place, starting with Eighneachan in 1200AD to Niall Garbh in 1603 a few years previous to the “Flight of the Earls” at Rathmullan when the old Gaelic order fled Ireland and the advancing English for the last time. 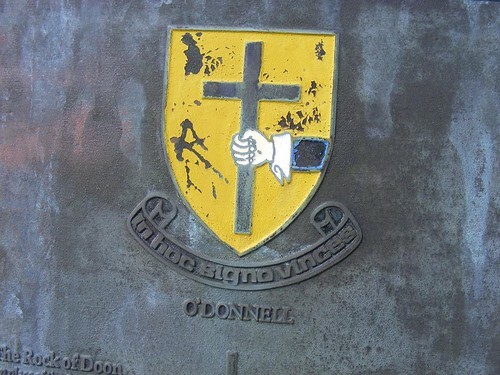 The O’Donnells or Ó Dónaill or Ó Domhnaill or Ó Doṁnaill which is derived from the Irish name Domhnall, which means “ruler of the world” – they were an ancient and powerful Irish family and lords of Tír Chonaill which was most of modern day County Donegal. From the top of The Rock of Doon you can get a commanding view of the surrounding area. Nearby at opposite side of the road from the Rock of Doon you find Doon Well which was said to be established by a Lector O’Friel who is supposed to have lived in the Fahans area and had remarkable curative powers. When the locals asked him what they would do once he was gone from them, his answer was the creation of Doon Well. According to tradition, he was supposed to have fasted for 18 days and on each of these days he walked from Fahans to Doon a distance of some four miles. On the 18th day he blessed the well promising that if the people believed in the holy water then they would receive the same cures and blessings that he had gave them. According to local tradition it was a Fr. Gallagher in the 1880’s who blessed the well and he is still prayed for as part of the turas. 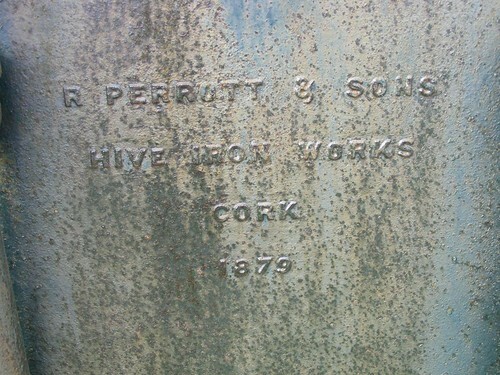 Many people still claim curative powers for this well. I did drink the water from the well and it was pleasant and cool in the mid-day sun but I can claim no miracles. Nearby, there is also a mass rock. 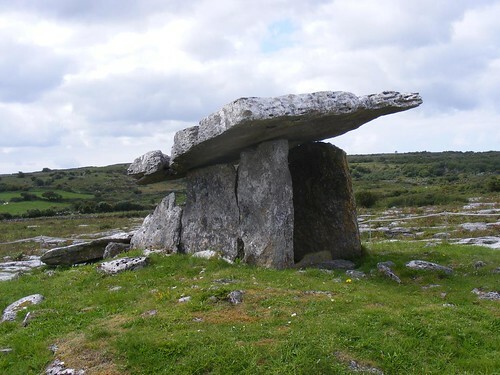 Many of these exist in Ireland and they are the hidden sites where Mass was celebrated during penal times when it was illegal to practice the Catholic religion. 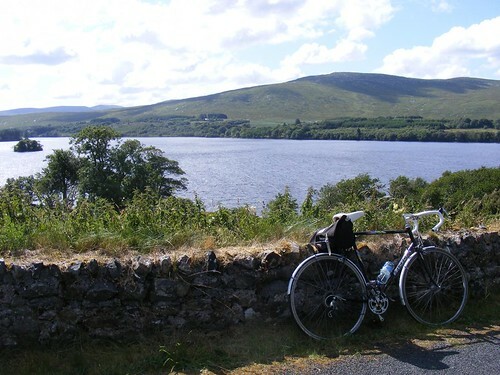 From there it was a pleasant if uneventful ride home via Churchill and the shores of Lough Gartan, the views of which I never grow tired. The bike performed faultlessly, I have never actually seen any other bike fitted with Sach-Huret indexed gears; Shimano had started to corner the market by then but they are a joy to use and slot home with precision and what amazes me is how little effort is required to change gear on this bike. It just needs the slightest touch with one finger. In the great scheme of things, this bike is nothing special at all. It’s just a mid-range Peugeot and probably ignored by collectors who want bikes with more prestige but they are missing out. Something like this can be bought much cheaper and still rides great by any standards. I would like to use it more but as it is so original I feel the need to keep it like that and I don’t want to put too many miles on it as I would probably struggle to find the correct freewheel block to replace mine and still retain the indexed gears if I were to wear it out. I am enjoying it for now but will probably put it away soon for the winter again. I’ll keep it as a special occasion bike, as an example of the fine bikes Europe could produce before manufacturing moved to the Far East. The smooth and responsive nature of the frame (even if it isn’t particularly light), the crisp accurate gear change without the need for silly skimpy chains and specially shaped sprockets which all seem to wear out at alarmingly low mileage and also the beautiful construction of the frame – internally lugged and brazed and finished with a beautiful paint finish. 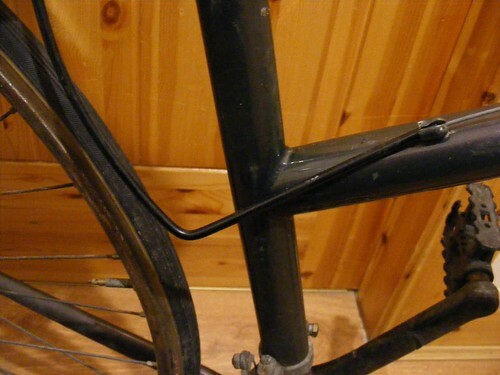 Modern bikes often have very rough welding on the joints. This is smooth and beautifully finished – much like the similarily constructed Raleigh Pioneer I recently refurbished – built by craftsmen. They really don’t make them this any more! 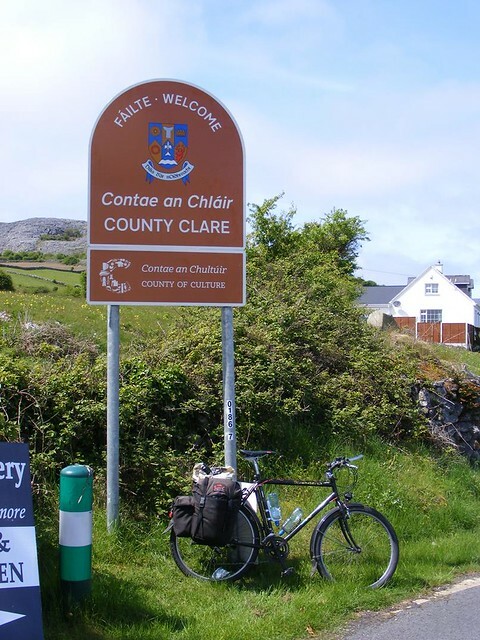 Last Month’s tour of the County Clare coastline almost brought my ambition to cycle the Wild Atlantic Way to a conclusion. It left just one little bit to complete in the extreme west of Donegal. As we seemed to be getting a summer for the first time in a few years, there seemed no time like the present to complete it. This time very little planning was required as I could ride to the starting point and ride home again when finished. It would only require three day’s riding. At a push it could probably have fitted into two but my aim in all of this has been to take my time and enjoy it. 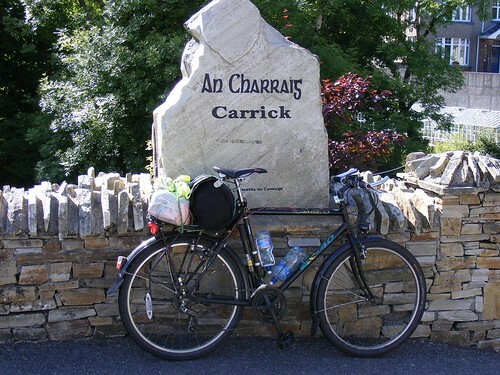 Panniers wouldn’t be required either as it was much shorter than the other trips – I could fit enough into my Carradice saddle bag. The weather forecast was good too, less need to carry excess clothes as I shouldn’t get rained on this time and no need to pack warm clothes either as it was shorts and t-shirt weather. I did play it safe however and took a lightweight jacket and trousers for “evening attire” and also my waterproof cycling jacket. I would be travelling and staying on exposed parts of the western coastline and inland weather conditions don’t always reflect what could happen along the coast. I’ve also got into the habit of always taking a spare pair of shoes as even when it’s dry, it is nice to have another pair to change into in the evenings and allow my cucling shoes (actually hiking shoes, I don’t use cycle-specific shoes and usually use flat pedals for touring) to air. I have a cheap pair of lightweight canvas shoes I keep for this as they can be packed flat. 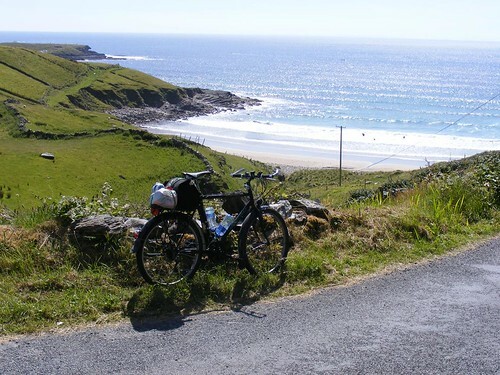 I would use my Townsend mountain bike for this – the low gears would be appreciated as this is one of the hilliest parts of the coast roads in the west of Ireland. It was an easy decision to make. 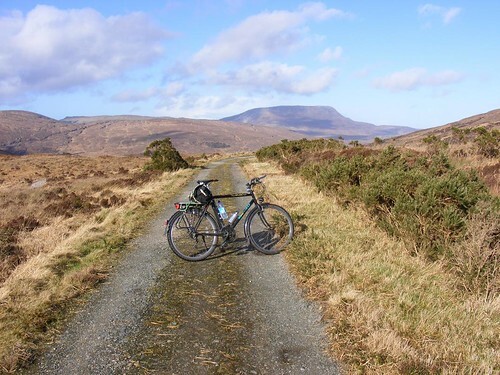 My plan was to ride to Donegal Town on the Friday, cycle to Glencolumbkille on the saturday along the coast and home again on the Sunday – this would fill in the gap and allow me to finish where I started. 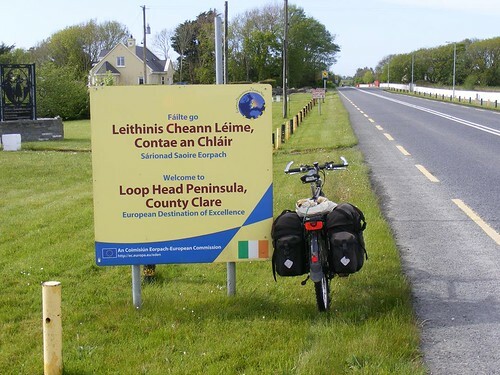 I began in Glencolumbkille in May 2016 and cycled north and later in 2016 I started in Donegal Town and worked my way south in Leitrim, Sligo and Mayo. 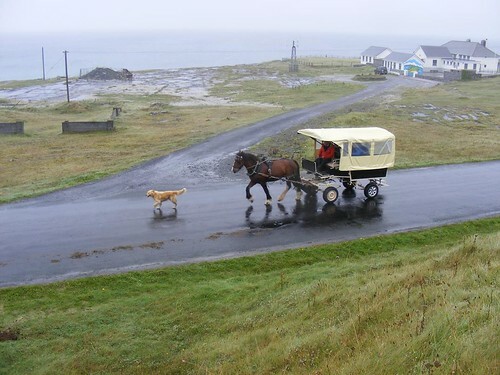 I had options for reaching Donegal Town. When I did it previously I was living in Raphoe and took a rote via Killeter and Lough Derg which allowed me to keep off the main roads. 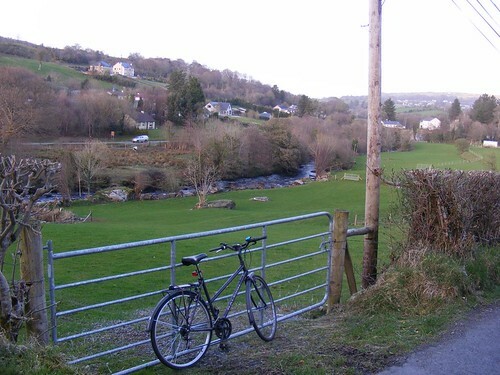 Probably the easiest and most direct route from Letterkenny where I live now is to go via fintown but I’ve done that ride many times since moving here. The idea of cycling through Bearnas Mór is not without appeal but the N15 is a ridiculously busy and high speed route and not something I really fancy on a bike. I decided to take the third option and go via Doochary. 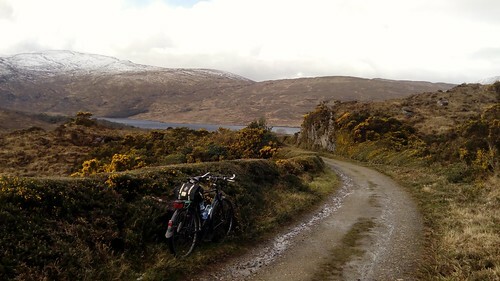 It would be longer, slower and with more climbing but it’s nice route touching on the edge of the Derryveagh Mountains. I set off initially on the R250 for Churchill, turning off on to the R254 for Doochary. This is a pleasant road to cycle on, the terrain is interesting with quite a bit of gradient and some beautiful scenery in the mountains. 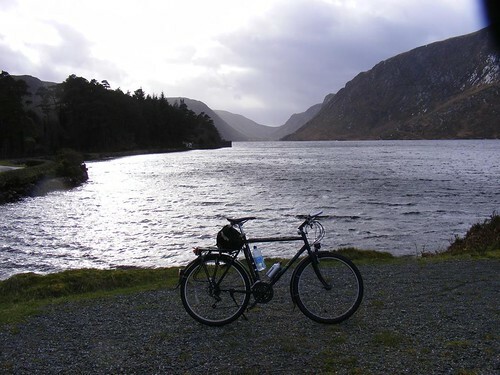 It really skirts the boundaries of Glenveagh National Park and there is an off-road path which can be taken to get to the castle, something I mean to do sometime. 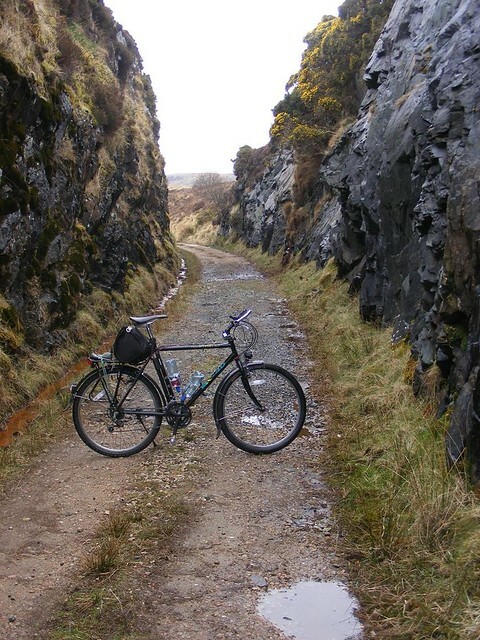 It is very remote area and very few cars use this road which is why it is such a nice route to cycle. 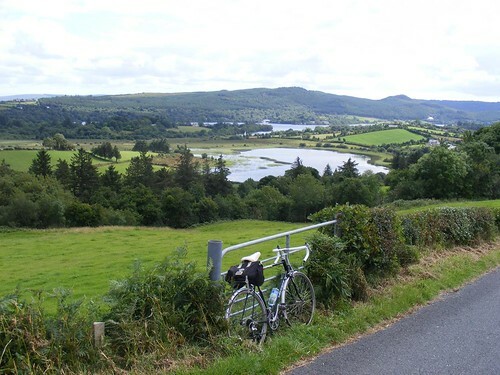 The views around the Lough Barra and surrounding bogland are very nice. 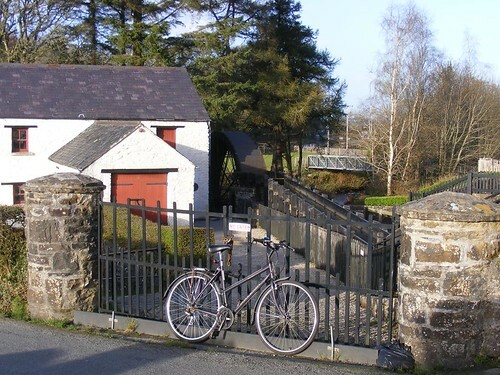 Doochary, properly called An Dúcharaidh (The black weir) is a small village in the Rosses area of Donegal and built on the Gweebara River. It is an Irish language speaking region and there is a lot to see around the area and some nice walkways along the river but today I was just passing through. A minor road links Doochary to Glenties but partly because I missed the turning and partly because it was a nice day and I was in no hurry I turned on the R252 and continued into Fintown. In weather like this, the views across Lough Finn are pretty amazing. Playwright Brian Friel remarked that it rivaled anything the Alps had to offer. I have written a lot about Fintown in the past on this blog. From Fintown, I continued on the main road to Glenties and my first proper stop of the trip as it was time for refreshments. In this heat, I didn’t feel very hungry but had drank huge quanties of water. 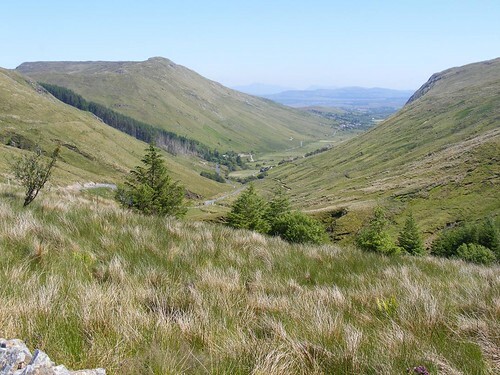 Glenties (Na Gleannta, meaning “the glens”) is located where two glens meet. Evidence of settlements here date back to the Bronze Age. From Glenties I briefly joined the N56 to Adara. It is a National Primary Route but not a very heavily trafficked one. After passing through Adara I made a turn on the R262 which would take me through Frosses and on to Donegal town. This was new to me as I’d never travelled this road before. It is a hilly but pleasant route, very lightly trafficked and very scenic surroundings. 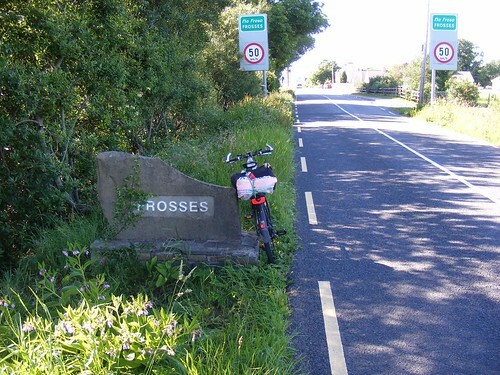 Frosses (or Na Frosa) is a very small village and from here it is only seven miles to Donegal Town where I would be stopping for the night. Unfortunately, it meant joining the N56 again for the final few miles. Here on the outskirts of Donegal, the N56 is heavily trafficked and I guess it was now rush hour. 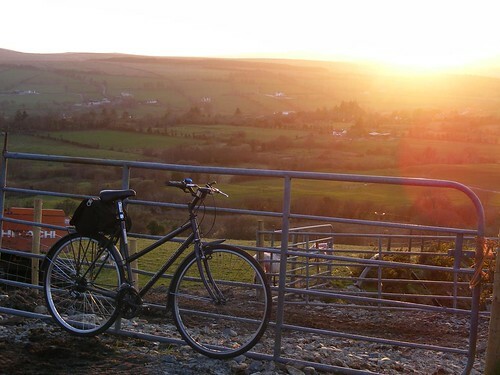 I made a detour along the Donegal Esturary which again was stunning in the evening sunlight before reaching and checking in to The Donegal Town Independent Hostel where I would be spending the night and I can highly recommend. I had completed sixty-three miles for today. 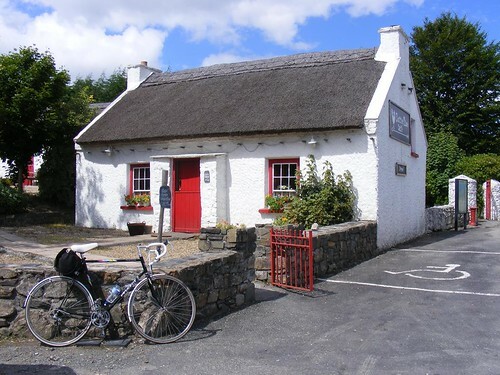 After a wash and change of clothes I walked the short distance into the centre of Donegal town in search of some food and later found a warm welcome and some excellent live traditional music in “The Reel Inn” before settling down for a night’s rest. I had enjoyed today’s ride but today wasn’t really about sight seeing as I was just aiming to get to my starting point. The main feature of this trip would start the following day. I was up and breakfasted and ready for the road quite early the next day. My first stop would be Mountcharles, somewhere I remember from family seaside trips in a Ford Cortina many years ago but today I would ignore the direct route on the N56 and follow the council signposted route on minor roads which is longer but more enojoyable. 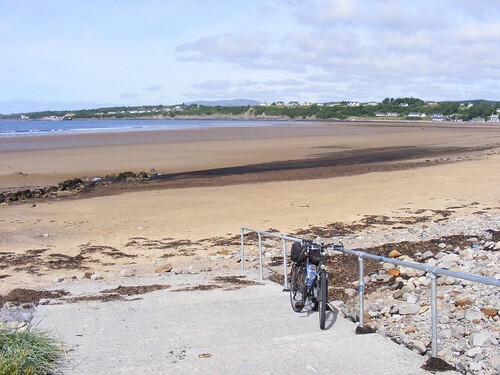 The ride to Mountcharles Pier from Donegal Town is only a few miles and when following this route you are on quiet single track roads. 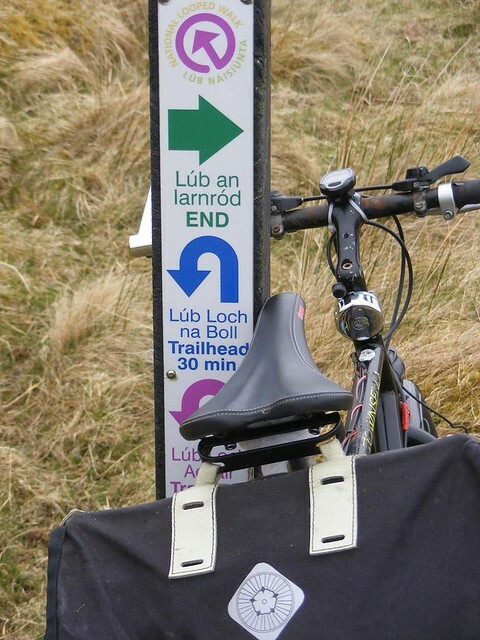 There are such signposted cycle routes all over the country really and most are very pleasant but the signs usually just say “Cycle Route” without any information about where you are going which is an unfortunate over-sight in my opinion. The scenery around the Mountcharles area is very nice. 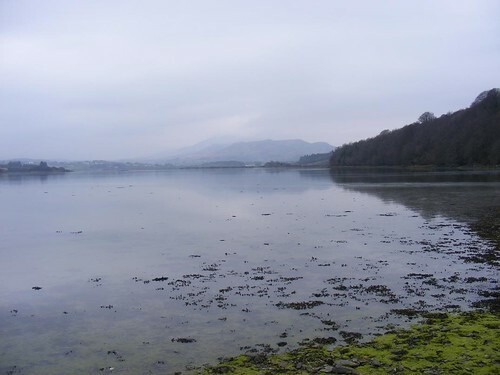 Mountcharles was traditionally called “Tamhnach an tSalainn” or “the field of salt” as the low-lying fields often flooded and salt remained after the receding tide. The salt was used to preserve locally caught herring. 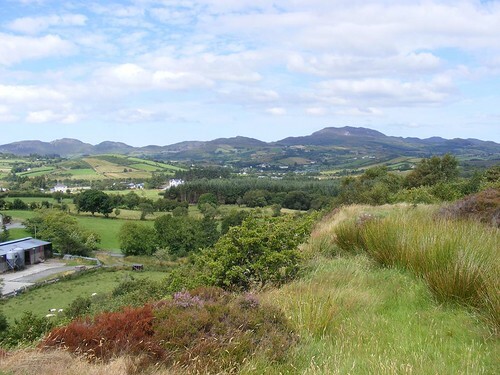 The name Mountcharles comes from the Scottish undertaker who took contorl of the area during the Ulster Plantations – Charles Conyngham who named the area as Mountcharles after himself. Charles Conyngham is the ancestor of The 8th Marquess Conyngham of Slane Castle in County Meath (sometimes incorrectly referred to as Lord Mountcharles). 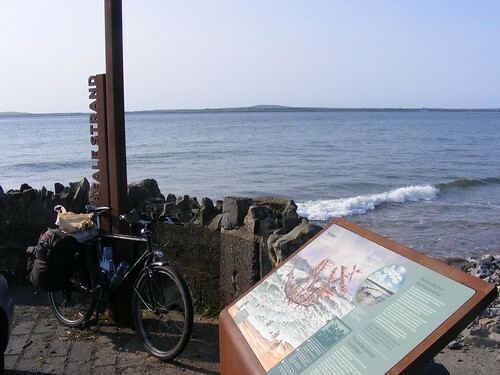 The modern pier was contruscted from blocks of sandstone during the great famine to provide work for the locals and unusually the stone was mined underground rather than quarried from above as is normal. 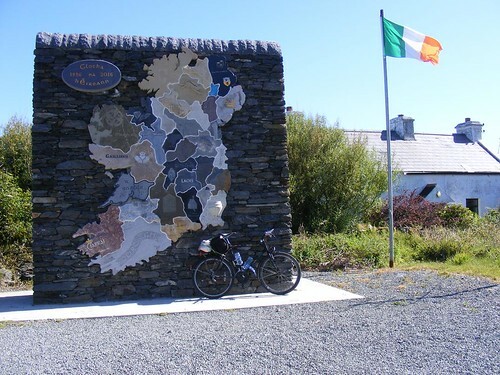 The area is also the birthplace of Seamus MacManus (1860-1968), author, playwright, poet and “Seanchai” or traditional storyteller in the Celtic tradition who re-worked old Irish folk tales for the modern audience and achieved great acclaim in America. He was famous in the area for sitting telling tales of a summer’s evening around the village water pump to a ready audience. From Mountcharles village I followed more minor roads around the coast before reaching the village of Inver (from Inbhear, meaning “estuary”) which has a very nice beach and a port nearby. 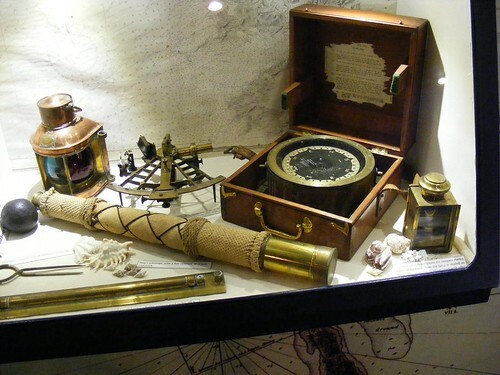 It was once an important whaling station under the command of Thomas Nesbitt who invented the harpoon gun. 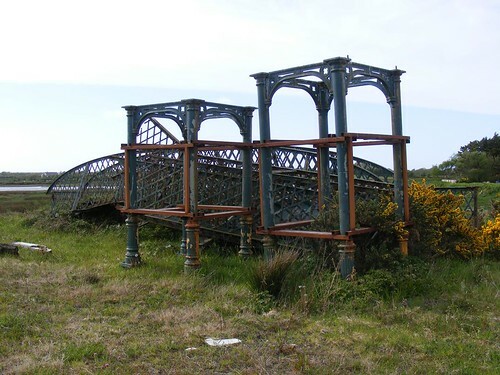 Inver was served by a railway line between 1893 and 1960 but like the rest of County Donegal’s railway network it is no more. From Inver, I had to re-join the N56 again for a few miles until I reached Dunkineely. 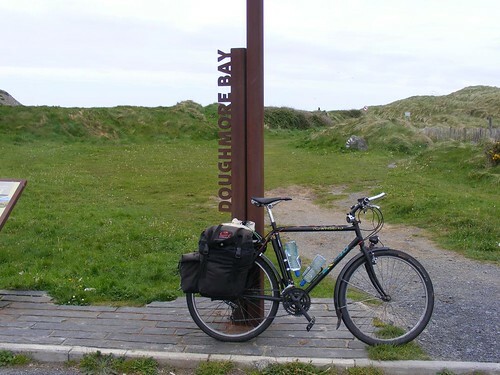 It was at Dunkineely I made the turn off the N56 for one of the things I was looking forward to on this trip – St. John’s Point, a narrow peninsula which seperated Bruckless Bay from Donegal Bay. This offers many scenic beauty spots and it was glorious in the summer sun and the air was scented with the smell of the hay-fields as farmers took advantage of excellent hay weather. 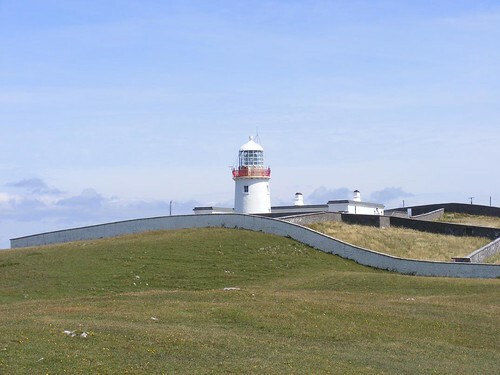 St John’s Point is one of the longest peninsulas in Ireland as you approach it’s tip, the magnificient lighthouse comes into view. 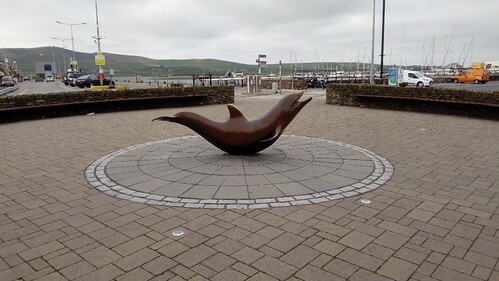 It was first requested by the fishermen and merchants of Killybegs in the 1820s and went into service in 1831 and was electrified in the 1960s. This is a dangerous stretch of water and the scene of many shipwrecks ove the years including a large part of the Spanish Armada fleet in 1588. 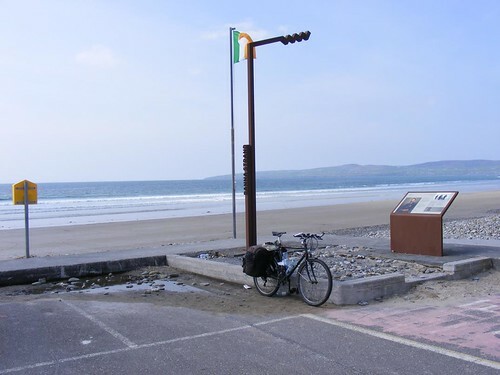 It is a very beautiful place with beaches and I was able to ride right to the edge across the grass on my bike where you can see “EIRE“ – one of many such stone signs put at prominent positions around the Irish coast during WWII as a warning to military pilots that they were entering the neutral air space of the Irish Free State. 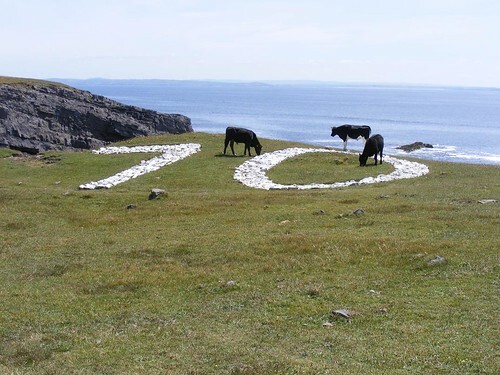 Each one had a number – this one is number 70. You can also see the remains of what must have been a Free State Army lookout tower dating from “The Emergency.” Eamonn De Valera’s government did take the threat of invasion very seriously in the early years of the war. Today, we thankfully live in peacetime and cattle nonchalantly graze the grass surrounding this piece of Irish military history. The return journey along the peninsula was just as nice as the outward one and I eventually ended up back on the N56 heading for Bruckless and Killybegs. 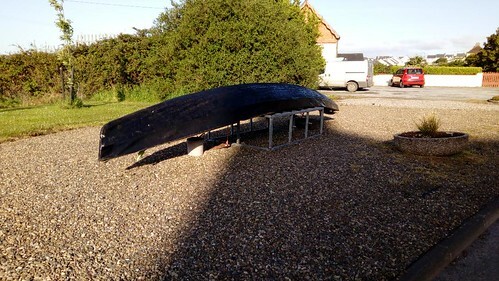 It was in Bruckless Bay that one of Ireland’s worst fishing disasters happened when a sudden storm cause around two hundred sailing boats to capsize with the loss of the many fishermen on board in 1813. Local people at the time never spoke about the disaster believing that a witch had brewed up the storm. 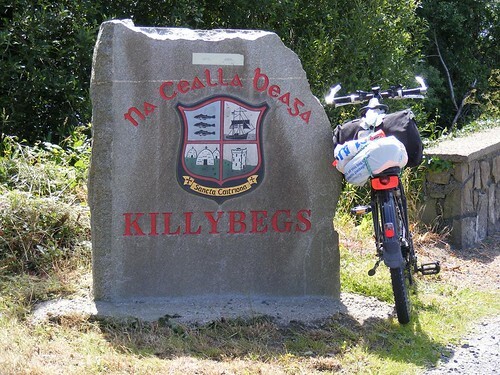 Killybegs was to be my next stop although I didn’t spend much time there. It is Ireland’s biggest fishing port and the size and scale of the fishing boats in the harbour and the industry which surrounds it is very impressive. It was westward from Killybegs where it starts to get really interesting again as you follow the coast road to Kilcar and beyond. It’s starting to get very remote now and the roads are much quieter apart from the campervans which can be a menace to cyclists on these small roads. 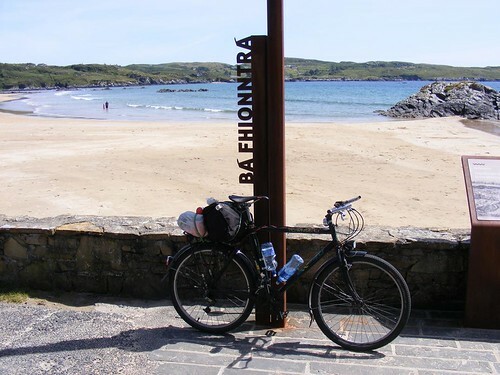 First though, I made a scenic detour from the R263 to Bá Fhionntrá – Fintra Bay, one of Donegal’s prestigious blue flag beaches. It isn’t far from the main road but the descent is scary and is probably the steepest descent I have ever rode down. As you might expect given the weather, the beach was quite busy and it’s easy to see why as it is a beautiful beach. 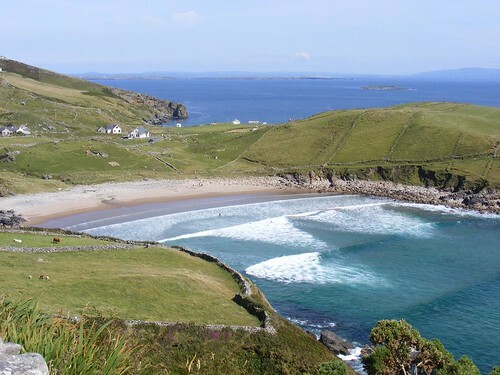 This is surely one of the single most beautiful spots on the entire Wild Atlantic Way route. In wartime it was the scene of several air crashes. An American B-17G Flying Fortress bomber successfully crash landed here in 1944 after suffering engine failure on a flight from Nebraska to Scotland. 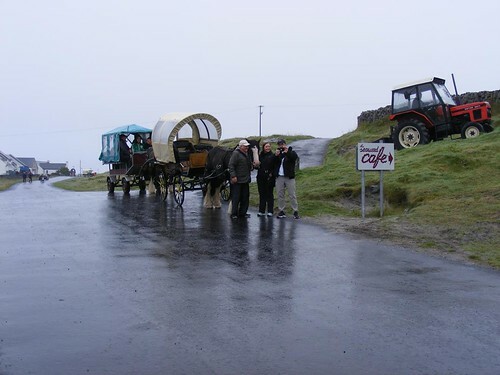 Years later, the crew and their families returned to Fintra to thank the locals personally for their help and hospitality following the accident. One of the final casualties of WWII also took place here when a British Sunderland plane crashed into the mountain with the loss of all twelve men on board. It was time to continue my way – I didn’t even attempt the climb back to the main road. I don’t think it would be possible even with my 26“ bottom gear so I just pushed the bike up the hill. 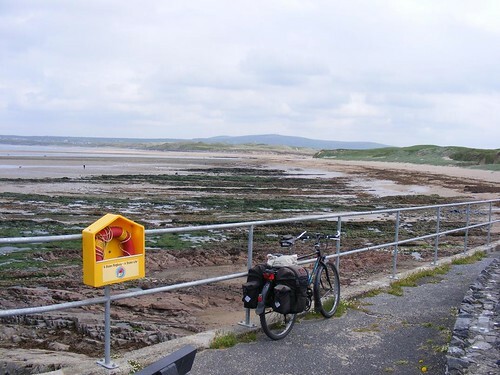 The next scenic stop would be at Largy, over-looking Donegal Bay. 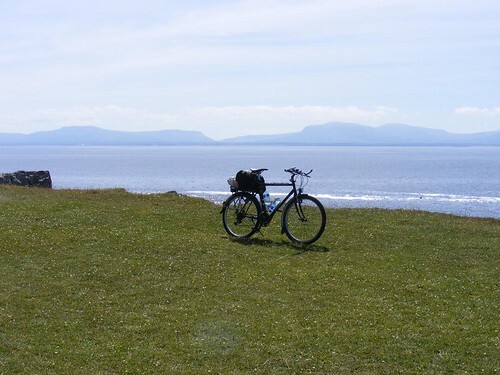 The views here very nice as you over-look Donegal Bay with Sligo’s iconic Ben Bulbin mountain on the horizon. 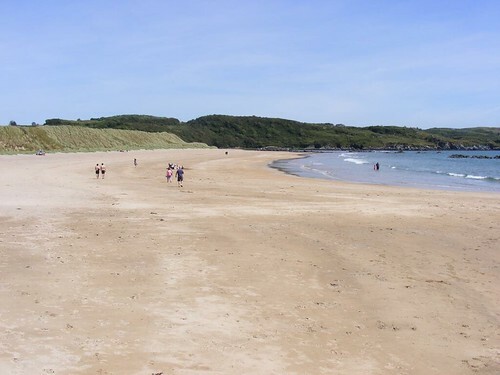 Donegal Bay is the largest Bay in the country touching on the shoreline of the three counties – Doengal, Leitrim and Sligo. 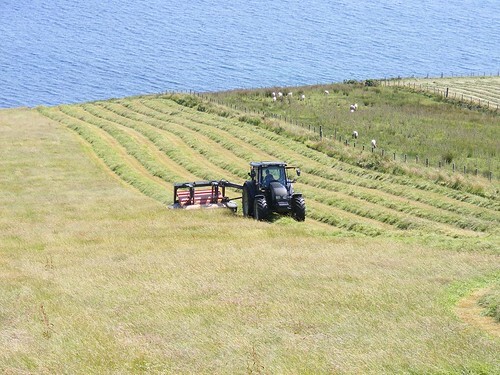 Despite the steepness of the fields, a farmer was at work cutting hay or silage and the sweet smell of freshly mown grass hung in the air. 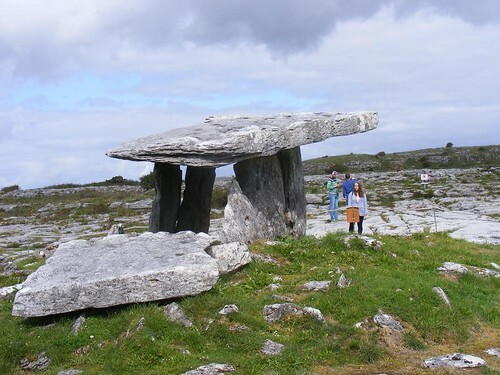 This is an area which needs further exploration and is rich in megalithic tombs. I wouldn’t have time to go looking for them today. 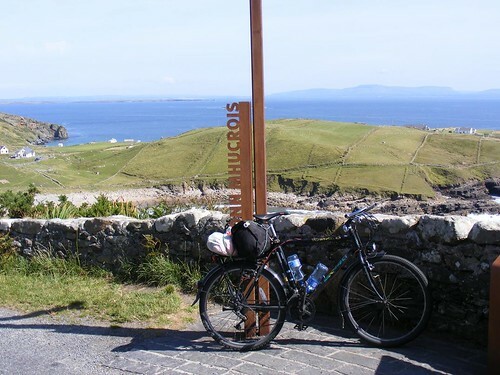 From Largy, a series of relentless climbs takes you to the top of Muckross Head – again offering an amzing view across the bay. Muckross Head is an area popular with hikers and rock climbers and it’s easy to see why. 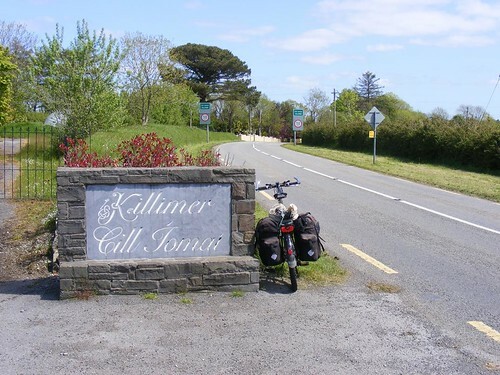 Continuing along the coast road I eventually reached civilisation again in the form of Kilcar. Cill Charthaigh or Kilcar is a small village famous for it’s tweed manufacture. It is also close to Sliabh Liag which are the highest sea cliffs in Europe rising up to 1,972 feet above sea level. To climb Sliabh Liag you would normally start in Teelin but I didn’t go to Teelin this time. I have explored Sliabh Liag on foot a few years ago and is worth doing but it’s not easy and I didn’t have time for it today. On this unbelievably hot June day, I instead took the time to enjoy a cooling ice cream. 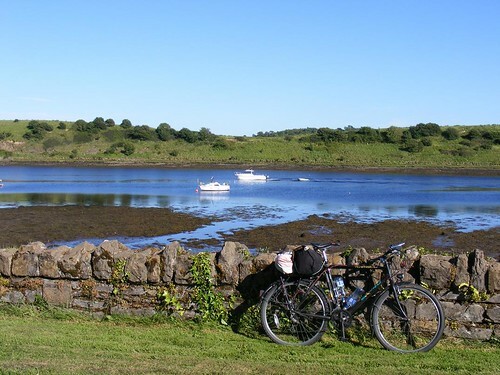 Passers-by asked me if it was hot riding a bike in this weather – I pointed out that my bike is fitted with air-conditioning – the sea breeze could be cooling on the 30 MPH descents despite the heat elsewhere. 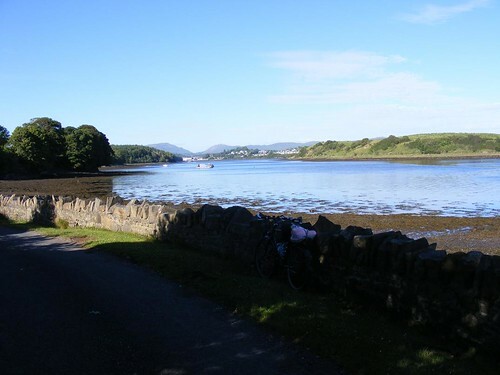 Staying on the coast road, the next town of any note was Carrick on the Glen River. This was as far south as I had come on the first part of my Wild Atlantic Way trip so I had now completed the Wild Atlantic Way. It was a nice feeling in a way but there were no welcoming parties on the streets of Carrick waiting for me! 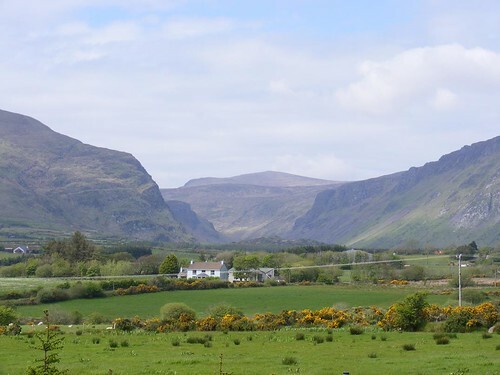 The main R263 road from Carrick leads directly to Glencolumbkille where I would be spending the night but I decided I had time to take the longer, probably hillier but definitely nicer, less busy and more pleasant route on a minor road past Lough Auva which leads to Málainn Mhóir. I remembered this road from the last time I cycled here. It was definitely less busy – I think the only vehicle I met was an old Massey-Ferguson 35 heavily laden with turf. Turf-cutting is still very much in evidence in these parts. 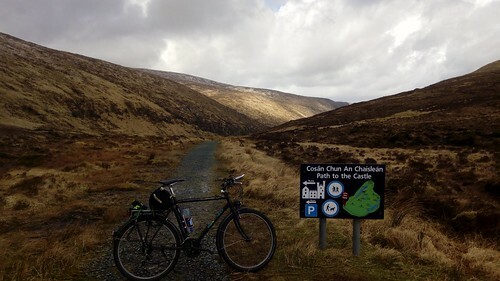 When I reached Málainn Mhóir, I did consider the option of riding the few miles back along the coast to the other magnificient beach at Málainn Bhig and the old Naploeonic lookout tower but it was now late in the evening and I was now hungry and tired so I turned towards Glencolumbkille. 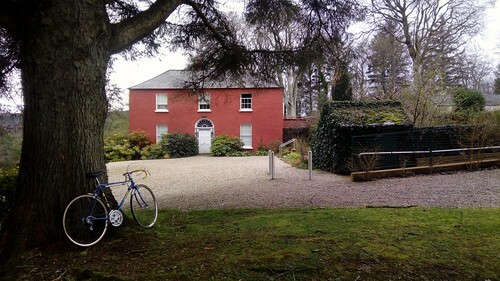 I checked in to the Doey Hostel where I stayed two years ago on the first part of my Wild Atlantic Way. My mileage for the day just exceeded seventy miles. My journey was now complete. I had a wash and change of clothes and some food. All that was left the following day was the return trip home – over the Glengesh Pass and into Ardara, Fintown and back to Letterkenny again. 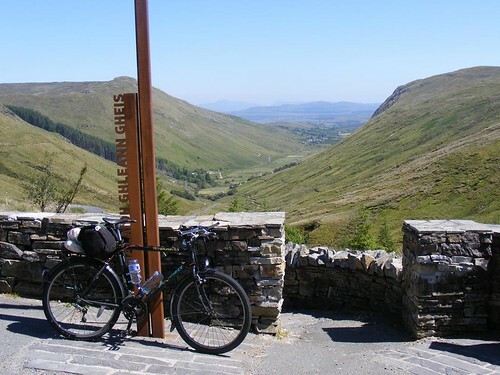 The Glengesh Pass is special in itself. I never tire of the view from the top of it. It is a very tough climb comig from Ardara but is reasonably straightforward from the Glencolumbkille side. It is a long drag though, but because it’s consistant climbing you can get into a rhythm if you have the right gear. Once at the top of the Glengesh Pass it is mostly pretty straightforward for the rest of the journey back to Letterkenny. I had completed over 180 miles in three days taking in some of the most difficult routes the west of Ireland has to offer. 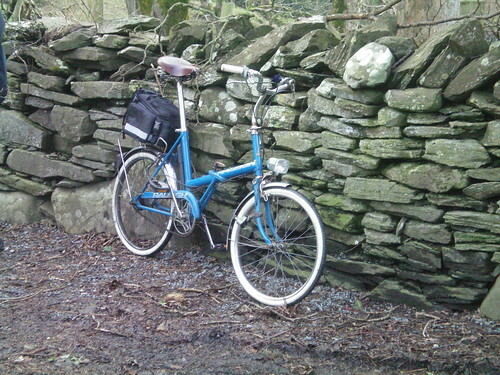 I was happy with that from a fitness point of view, and yet again, impressed with the touring potential of my Townsend. It is impossible to say which part of the Wild Atlantic Way I liked best but I came away with a sense that I had actually saved the best to last and in some ways I regret not breaking the journey between Donegal Town and Glencolumbkille in two with an overnight stay and much lower mileage each day as there was so much more I could have explored. Despite being a native of Donegal I have never been in this area much and this was my first visit to St. John’s Point and to Fintra Bay. 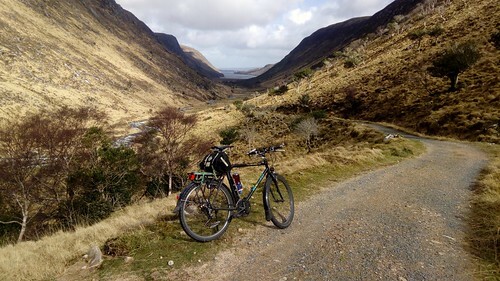 It appeals to me in the same way that north west Mayo around Ceann Iorrais, The Doolough Valley and Killary Fjord on the Mayo/Galway border and also Garinish Point and Sheep’s Head in county Cork appeal to me – the incredible remoteness, the spectacular scenery and the quiet roads. On the other hand, places like Sligo, Westport, Galway City, Doolin and Dingle offer an amazing live music scene in the evenings – I suppose it depends if you want to get away from it all or are in the mood to socialise. 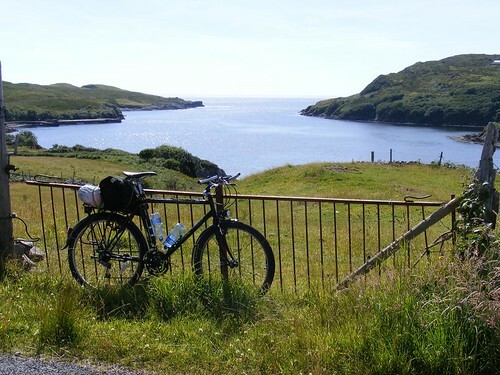 My ambition to cycle the Wild Atlantic Way seemed far-fetched and unlikely when I first decided it was something I would like to do a few years ago. 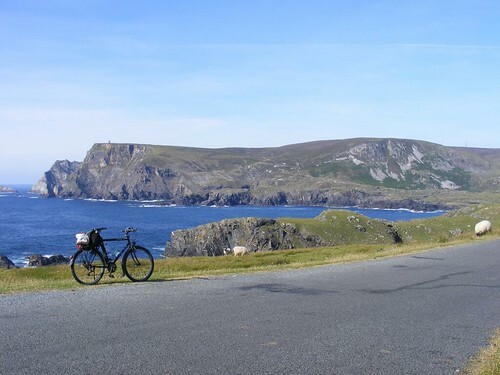 At just over 1,600 miles, it is one of the longest coastal drives in the world and from a cyclist’s point of view, it takes in some seriously tough terrain and strong Atlantic headwinds are often present. It would be nice to have had the time to do it in one attempt but I was never in a position to give up so much free time. I guess that with a support car to carry luggage, a lightweight road bike and high daily mileage targets it could be completed within in a reasonable timeframe. 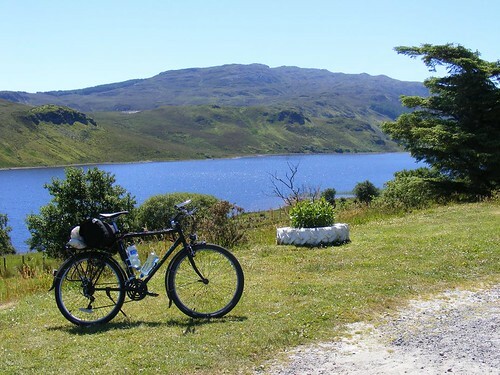 But I wanted to do it in traditional cycle-touring style, unsupported and only aiming for maybe 50 miles per day as I’ve found that sufficient for a day’s touring if you actually want to have time to explore your surroundings and enjoy it. 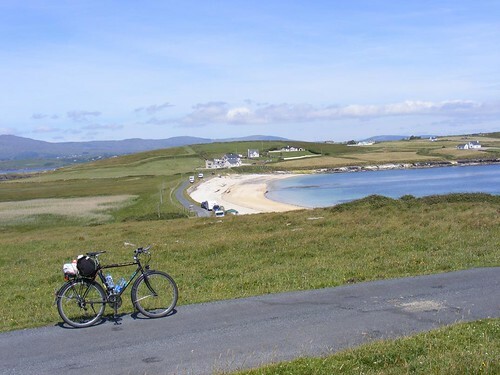 I started with most of the coastline of Donegal in May 2016 – Glencolumbkille to Letterkenny via Adara, Dungloe, Gortahork, Creeslough, Melmore head, Fanad Head, Rathullan into Letterkenny and added two additional stages in 2016 doing Donegal Town to Westport in county Mayo (including Achill Island) and also the Inishowen loop. 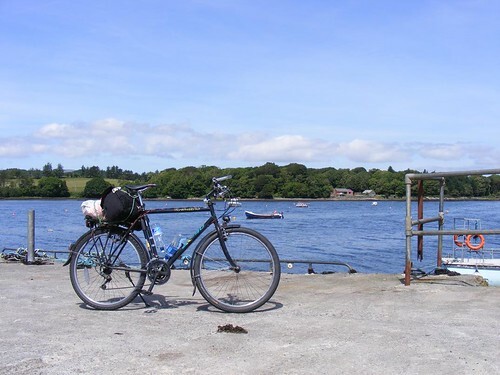 I took an opportunity to stay with a friend who was living near Clonakilty in January last year to use it as a base to Kinsale to Baltimore and Skibbereen. 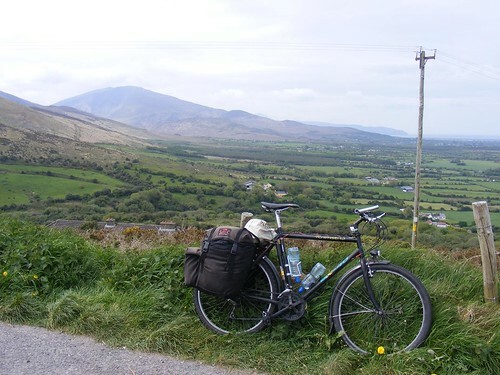 I then did the short and probably easiest part of the whole route from Westport to Galway city last summer and last September I did my longest stage from Tralee to Skibbereen around all the many peninsulas of Kerry and West Cork. 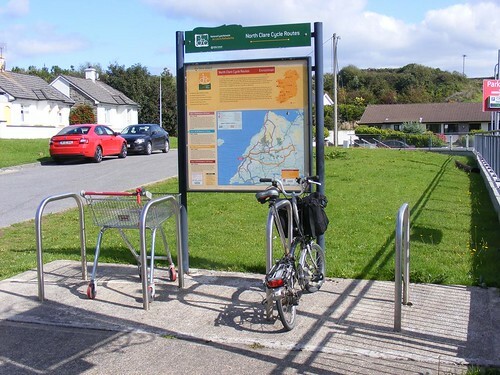 These far away places like Tralee required extra planning as I needed to transport a bicycle by public transport as driving was no benefit to me as I would end up in one place with a car many miles away. My decision to start in Tralee last autumn was purely because there is a train station there. I could get the bus to Dublin and train to Tralee. 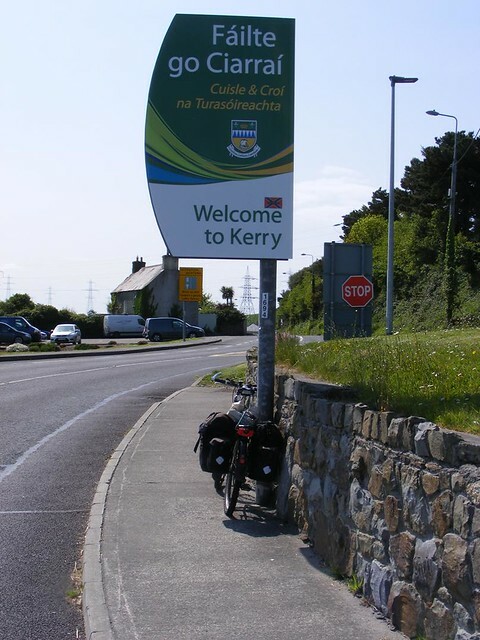 So, a little less that two years after my first leg of what seemed a mammoth journey at the time, it was almost a reality as I planned Galway to Tralee to fill in the missing part. 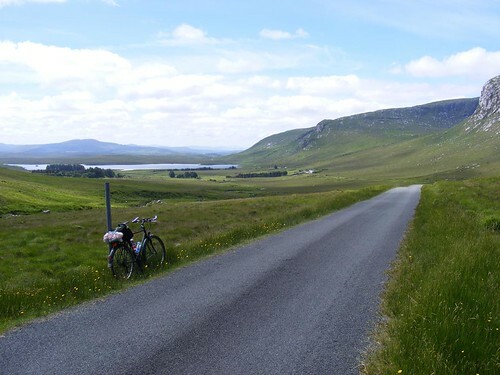 There is also a small bit to complete between Mountcharles and Teeling in the west of Donegal but that only really requires one day’s riding and I decided to leave that to last as I could finish where I started – in Glencolumbkille. 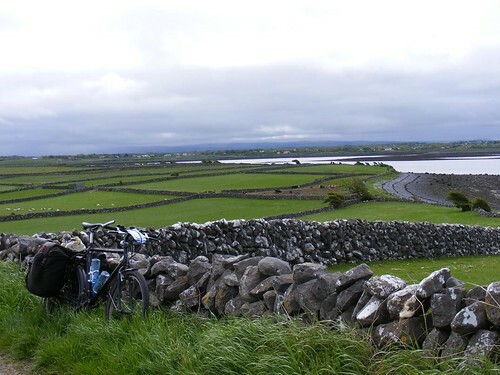 The plan for this trip was to take my bike on the bus to Galway city on a Sunday evening, spending the night, and then cycle south along the coast on the Monday, crossing the county border into Clare and spending the night in Doolin on the west coast of County Clare. 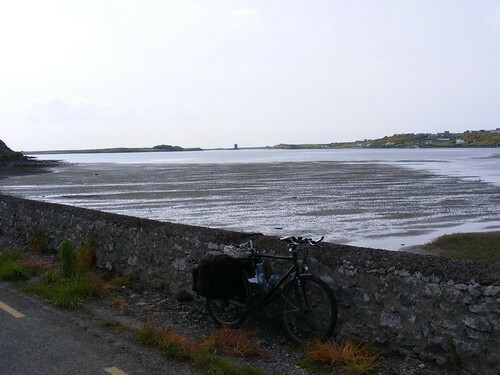 Tuesday would be from Doolin to Kilrush on the Shannon Estuary. I had hoped to stay somewhere towards Loop Head on Tuesday but I couldn’t find affordable accommodation so settled on Kilrush. 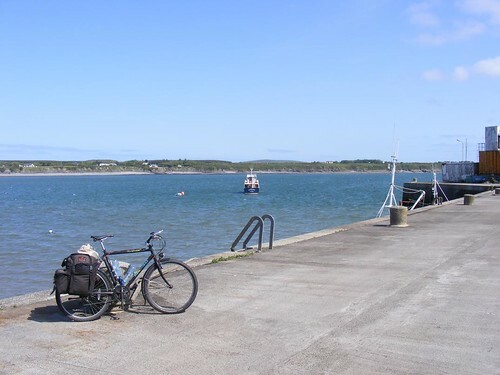 Wednesday would see me taking the only ferry journey of this trip across the River Shannon to Tarbert in County Kerry and spending the night in Ballybunion. On Thursday I would make my way to Tralee. 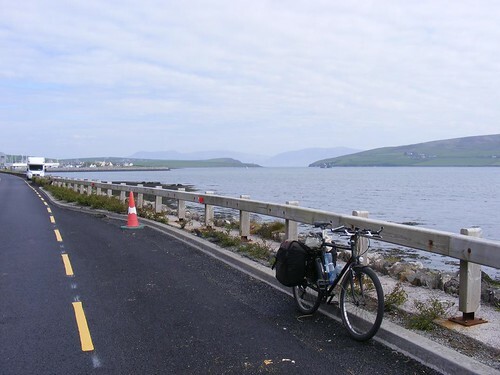 I could have stopped there as my route would be complete but on Friday, since I would have time, I would go to Dingle, purely bcause the Dingle peninsula was one of the highlights of my last visit to Kerry despite some horrible weather at that time. I would hope for better this time. 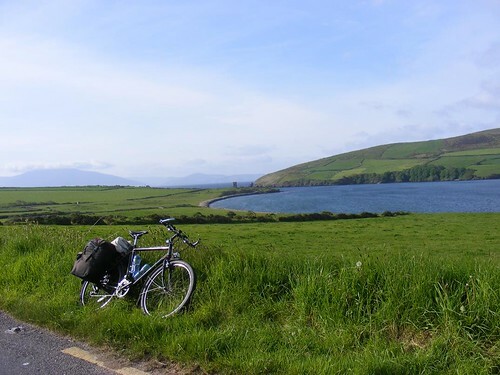 On Saturday, I would cycle back from Dingle to Tralee and get the train to Dublin and hopefully a bus back home again on Saturday night. I decided to use my Townsend mountain bike for this trip. So many of the other cycle tourists I’ve met are riding adopted early steel-framed mountain bikes. 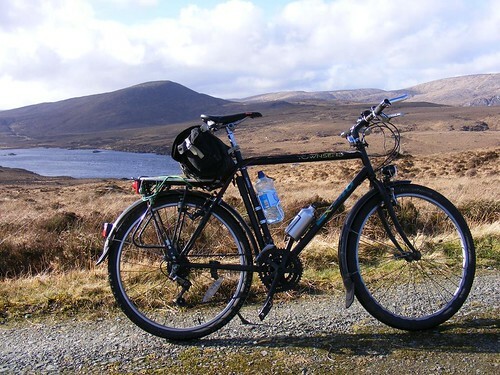 There is no doubt it is a cheap alternative to a proper touring bike and they are very sturdy and very adaptable. For this type of riding, speed is largely irrelevant in my opinion. I’d be interested to see how it compared to a traditional steel road frame for touring – most of this trip has been done on a 1975 Viscount Aerospace. It was actually very overcast and threatening rain the next morning although it never actually did rain. I left Galway at about 9:30, hoping that the mayhem of rush hour traffic would be over and headed for Oranmore. The road was very busy but the drivers were incredibly well mannered. Once clear of Oranmore, I was out in a more rural setting. The thing which has always fascinated me about Galway is the endless stone walls. I think Galway must have the best in country and the way they are built differs from those in the north too. 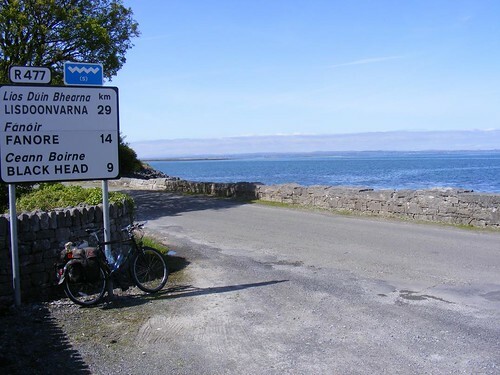 From Oranmore, I made my way along the coast to Rinville and Clarinbridge where I would be rejoining the N67. 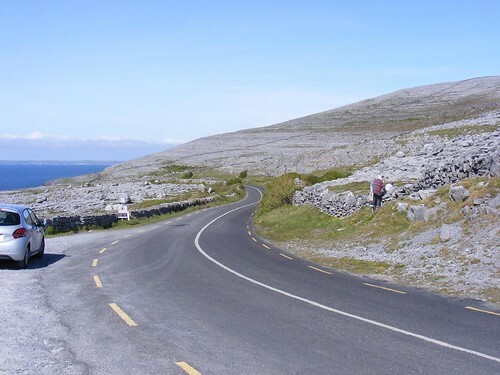 In some ways I wasn’t looking forward to this part of the Wild Atlantic Way as a lot of this part is on national primary routes, something I tend to avoid at home but I was genuinely pleasantly surprised at the standard of driving I encountered in Galway, Clare and Kerry. I never once experienced so much as close overtake or any kind of animosity from the local drivers in several hundred miles of riding. It is a shame that drivers in the north of Ireland cannot behave like this. It became normal to have people shouting encourage out of the window on long climbs or to stop and offer assistance if I stopped for a rest or to admire the view. I was to remain on the N67 until Ballyvaughan. 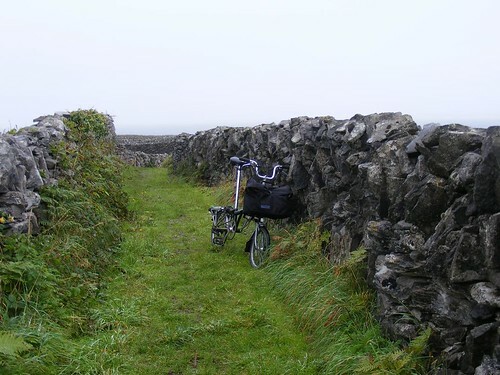 It is a nice route along the coast often lined with dry stone walls. The highlight for me being Dunguaire Castle near Kinvara, Co. Galway. It dates from the 16th century and features a defensive wall and 75 foot high tower, both of which have been restored. The name originates with the Dún (fort) of King Guaire – the legendery king of Connaught. 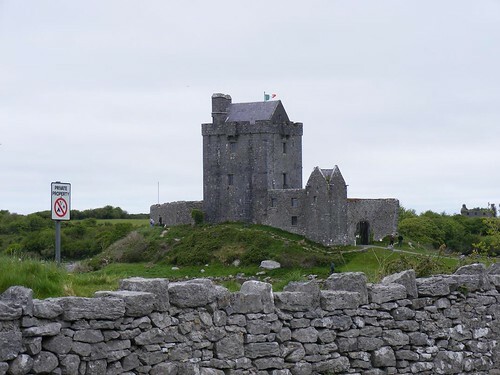 The castle was used in the 1969 Wallt Disney film “Guns in the Heather” and also used as a Scottish castle in the 1979 film “North Sea Hijack.” The castle is an impressive sight on the shores of Galway Bay and you can pay to see around the inside although I declined. 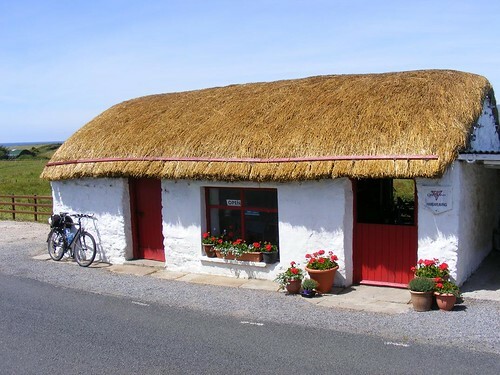 Kinvara also has a magnificent thatched hotel. Unfortunately a parked lorry made it impossible for me to take a photo of it as I would have liked. 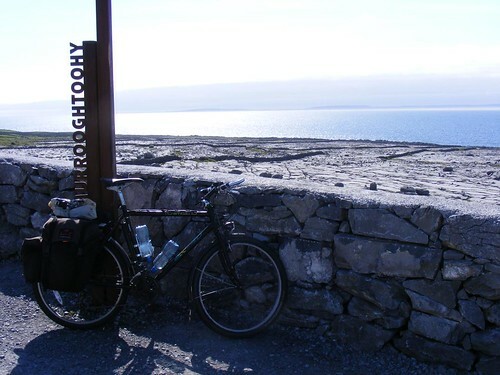 Shortly after Kinvara, you leave county Galway and the province of Connaught behind as you pass into Clare and Munster. 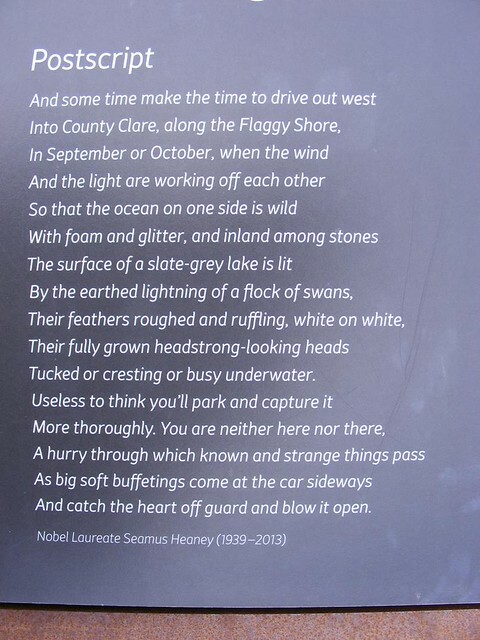 My next stop was to be at Flaggy Shore, a place where poet Seamus Heaney enjoyed visiting and which inspired one of his most highly regarded poems – now written on the tourist information board for posterity. I stopped and bought some food in Ballyvaughan, a very picturesque town on the north Clare coast. Ballyvaughan has a nice little harbour, the work of the Scottish engineer Alexander Nimmo; like so many of the harbours I have visited in this corner of Ireland. 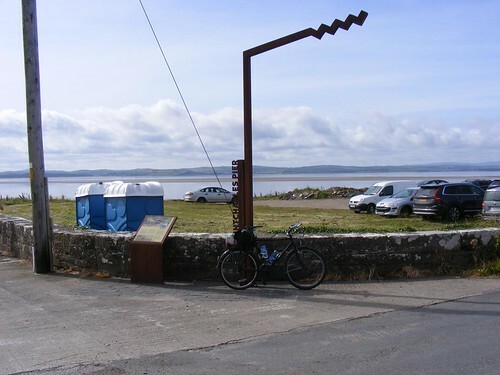 I spotted an interesting facility fitted along the harbour wall too – a “bicycle maintenance station” which consisted of a reasonable selection of cycle related tools including spoke wrenches attached to it by small guage wire ropes. Thankfully my bike was well serviced before I left and I had no use for them but I thought it a nice and potentially usefully facility. From Ballyvaughan I turned off the N67 onto the minor R477 which loops the Clare coastline and would take me most of the way to Doolin where I would be spending the night. 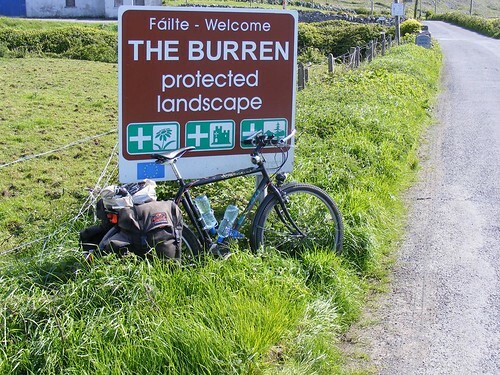 I had been looking forward to this piece of road as it takes me around The Burren, one of Ireland’s areas of special interest and conservation and one which I had never previously visited. 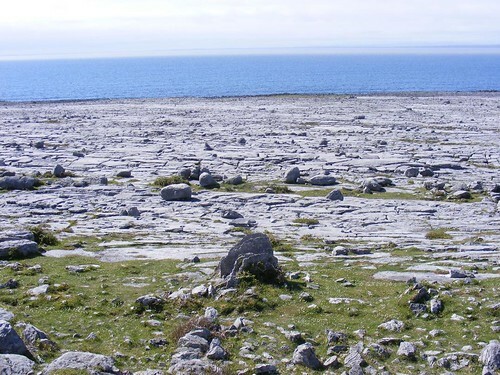 The Burren (from Boireann – the Irish for great rock) covers an area of 97 square miles and is one of the finest examples of glacio-karst landscapes in the world (I don’t fully understand the geology behind it either so won’t attempt to explain it! It’s mostly bare limestone pavement which has been eroded away into the shapes we see today after the glacial periods stripped the protective layers from the top. It is certainly different and really requires more time to expore than I could give it today. 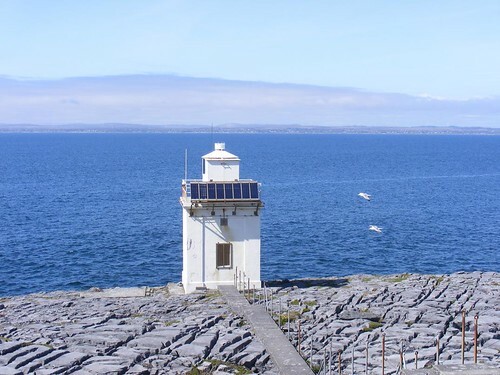 You also see Black Head lighthouse, which built in the 1930s at the request of the Transatlantic liners who often visited Galway or sheltered in Galway bay during storms. 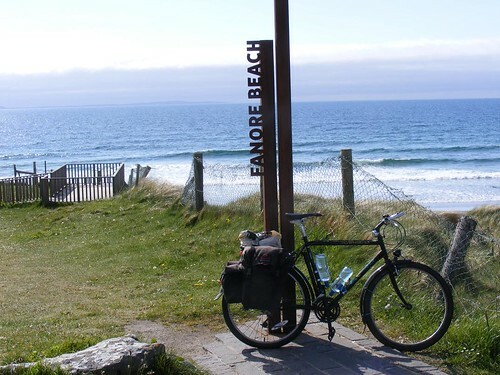 I also stopped at Fanore on the west coast of Clare, a beautiful beautiful beach popular with surfers. A few miles before reaching Lisdoonvarna, I made the turn-off for Doolin on to the R479 for Doolin and the last few miles of my day’s touring. 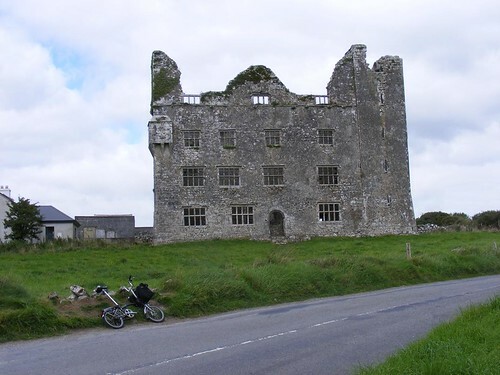 Just at the junction, you can see the ruins of Ballinalacken Castle which dates from the 15th century and takes it’s name from Baile na Leachan which translates as town of the flagstones. I arrived at the Rainbow Hostel in Doolin, my mileage total now at just over 66 miles so a definite increase on the previous day! I was welcomed warmly by the owners and made to feel very wlecome. 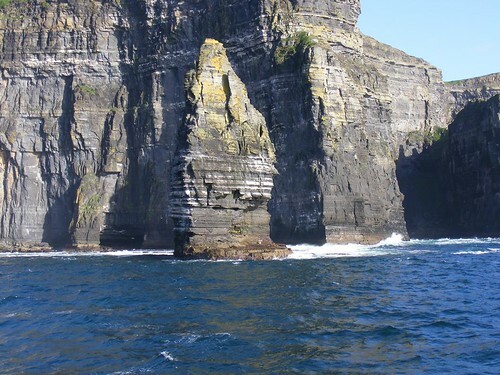 Dúlainn is a very scattered town but a beautiful location, home to the cave which claims to have the largest stalactite in the northern hemisphere at about 25 foot long, is close to the Cliffs of Moher and also has as ferry link the Aran Islands. It also has many fantastic live music pubs and is a good place to spend an evening. Sadly I was only to be passing through but I hope to return at some point as I would like to visit the cave and the islands. 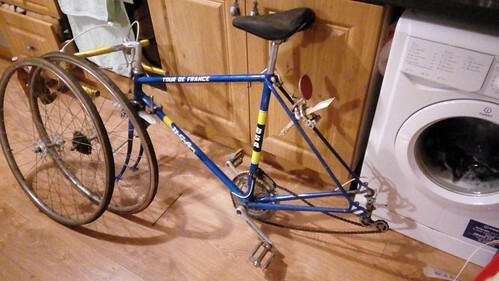 To my surprise I also found a French Randoneur bike which I’ve rather fallen in love with. It is in a neglected state, behind the hostel, having been left behind a previous guest and the sea air has not been kind to it. 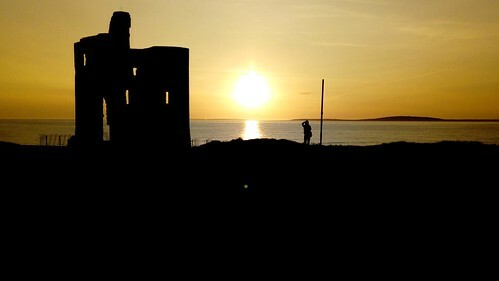 Doolin is definitely one of the places I’ve marked out for a future visit. I had planned to visit the Cliffs of Moher – one of Ireland’s most iconic landmarks (I’ve never been before) in the morning while I was passing them anyway on my road south but it turned out to be so foggy it would have been a waste of time. I could barely see the opposite side of the road. I called my dynamo powered LED lamps into action. Cycling in thick fog always makes me nervous. I’m not sure if my lights were bright enough to penetrate the fog or not but the few cars and coaches which overtook with lots of space. As I started to descend from the mountains towars Lehinch the fog lifted and the sea views returned although there was still a soft drizzle of rain. 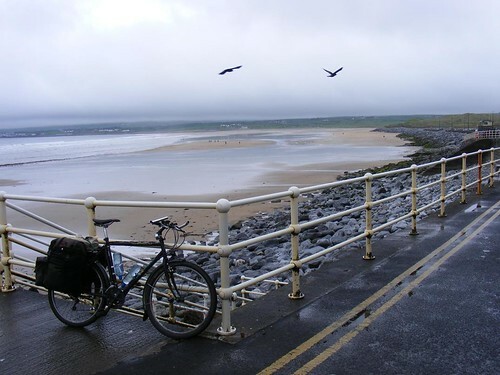 The town of Lehinch first became a popular seaside resort with coming of the west Clare railway in 1887 and an 1891 guidebook said the mile-long golden strand was not to be bettered in Ireland. It’s a nice beach but I dispute that it can’t be bettered in Ireland. Pioneering pilots Pond and Sabelli landed in a field here in 1934 after aborting their attempted New York to Rome flight. They were given a warm welcome in a Lehinch pub afterwards. 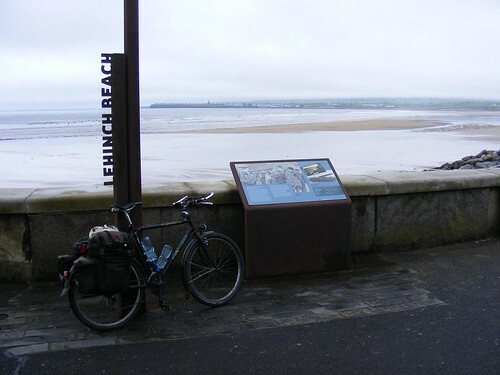 At Lehinch, I had to rejoin the N67 again as I made my way towards Spanish Point which gained it’s name after the defeat of the Spanish Armada in 1588 as many Spanish sailors drowned here and the survivers who came ashore were executed by the English. It is thought that the great Spanish galleon, the San Marcos with it’s 60 guns and 500 man crew went down off Spanish Point. The results of 2014 survey of the seabed are encouraging and investigations and searches for the wreckage continue. 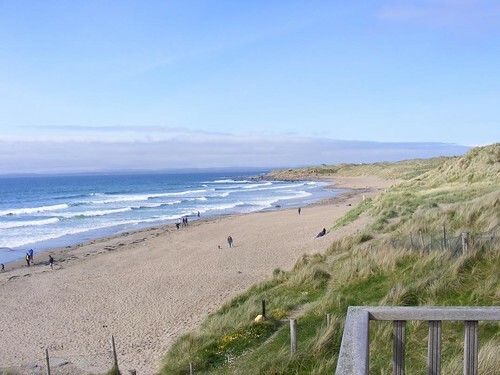 In Victorian times, Spanish Point became a fashionable holiday resort with golf courses and what was then the largest hotel in the British Isles. 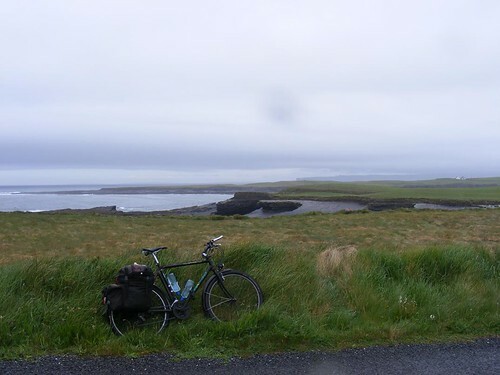 I continued to follow the N67 along the coast to the town of Kilkee. A minor detour from the N67 takes you to Doughmore Bay, where a Northern Ireland based Sunderland flying boat crashed while on Atlantic Convoy during WWII with the loss of 9 of the 11 people on board. Five of the bodies were buried locally (the others were never recovered) and the pilot who did survive was shot down and killed over Germany a few years later towards the end of the war. Up until the early parts of 19th century, Kilkee was a minor fishing port but in the 1820s, paddle steamers operating on the river Shannon made it a popular holiday destination for the people of Limerick and the town grew and flourished with the opening of many hotels and a building spree brought about by wealthy businessmen from Limerick who wanted holiday homes by the sea. 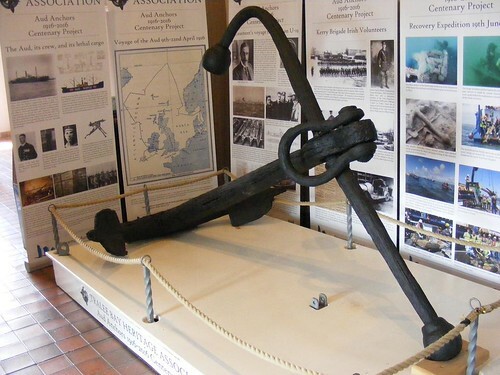 The large anchor which is on display on the seafront today belonged to the Liverpool based sailing ship “Intrinsic” which went down of Kilkee during a storm whilst on a voyage to New Orelans in 1836 with the loss of all men on board. The bay has become known as Intrinsic Bay. 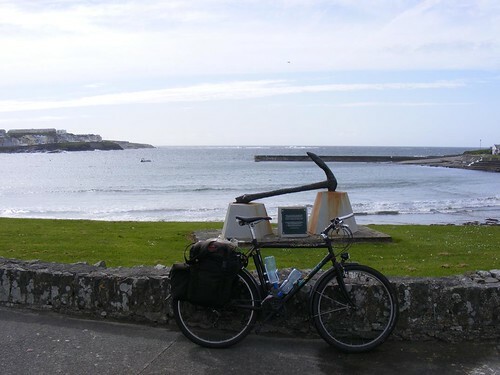 It was at Kilkee where my planning before this trip didn’t quite work out as I had wanted either as I would have preferred to have continued to Loop Head along the coast from Kilkee but the only place I could find cheap accommodation was in Kilrush. I had options now. 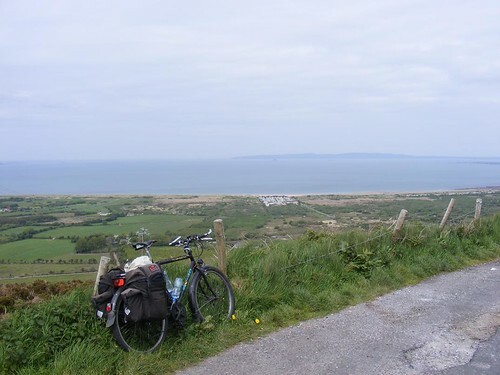 The fog and the rain of the morning were a distant memory now and weather was amazing (I actually ended up quite badly sunburned) but it was now about 5 o’ clock in the evening and the Loop Head Peninsula would add another 40+ miles on my journey to Kilrush. I had already covered just around 50 miles so far. 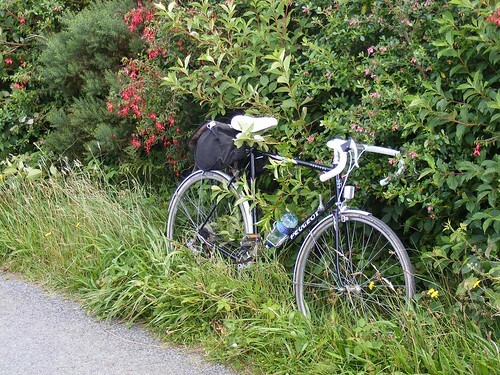 With a heavily laden bike, it would have been very late getting to Kilrush and probably very tired and hungry. 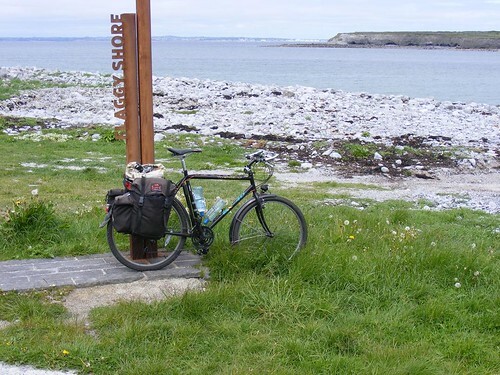 I decided to employ my Plan B. I had deliberately left the next day quite short in terms of distance to leave the option of visiting Loop Head in the morning before crossing the Shannon. I decided it made more sense to do that so stayed on the N67 and took the direct inland route to Kilrush. 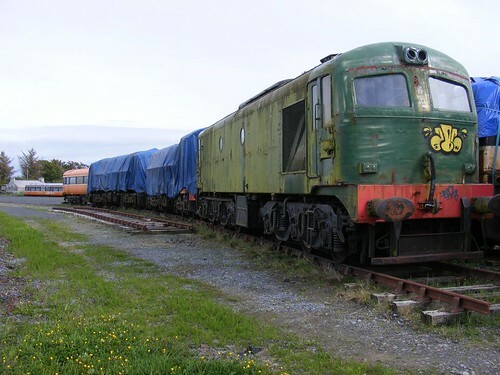 The N67 passes through a small village called Moyasta where there is a little heritage railway and what appears to be scrap yard for old trains and other railway bits and pieces. I stopped and had a look around as it was something I hadn’t expected to find. 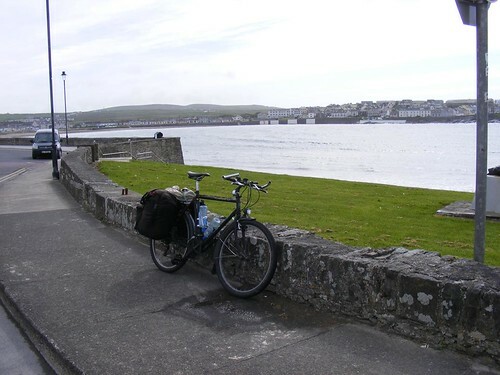 I reached Kilrush in glorious sunshine with my total mileage now at 131 miles. Although I had often heard of Kilrush, I knew nothing about it. Cill Rois, meaning “Church of the Woods” existed since the 16th century but underwent major expansion towards the end of the 18th century. The modern town is mostly due to the work of the prominent family in the area in that era – The Vandeleur family of Dutch origin. They originally came in the 1600s as tenant farmers but did very well for themselves, although not always by fair means. John Ormsby Vandeleur built most of the modern town in the early 1800s, including the hostel in Frances Street where I would spend the night. My hostess informed me that it was 215 years old, although completely refurbished in recent years. 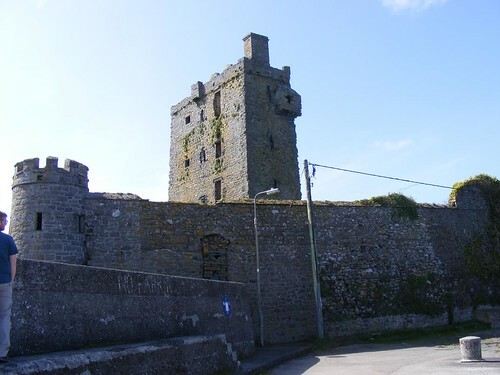 The town prospered for a time but west Clare was badly affected by the famine in the 1840s and the Vandeleur name became synonymous with some of the worst of the landlord evictions, with over 20,000 evicted in the Kilrush Union. More prosperous times again arrived with the coming of the West Clare Railway in the late Victorian period. 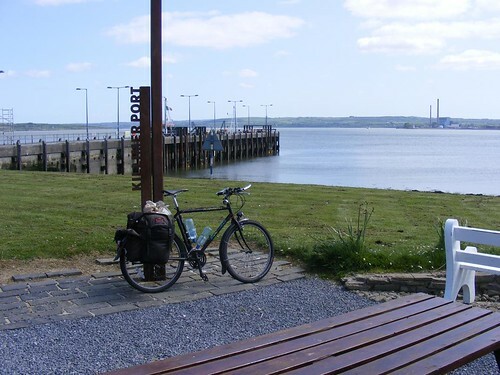 I found the modern Kilrush a very nice town to spend time in with a lot of beautiful architecture, many nice walking routes and a very impressive marina and very friendly locals. I found it an incredibly peaceful town and the town itself and the surrounding area deserves more exploration than I had time to give it. 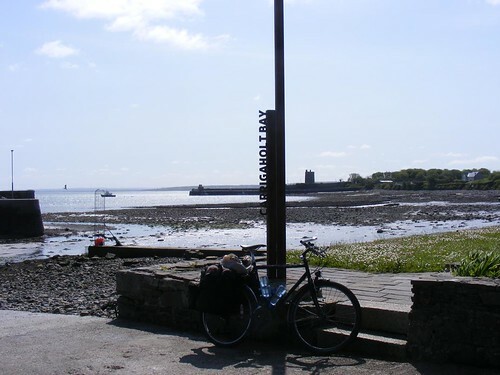 The following day dawned bright and sunny and an early morning walk along the Shannon and the marina was a very pleasant affair as there was barely the slightest hint of a breeze and the sunlight reflected of the smooth tranquill waters of the Shannon estuary. The Shannon is named after the Celtic goddess Sionna and at 224 miles long, it is the longest river in the British Isles. It has always been an important river in terms of navigation and it was also the chosen site for the hydroelectric dam at Ardnacrusha near Limerick which was one of the first projects started by the original Free State government in the 1920s. I really liked Carrigaholt (Carraig an Chabhaltaigh, meaning “Rock of the Fleet”) which is a small fishing village with a very nice castle at the harbour. 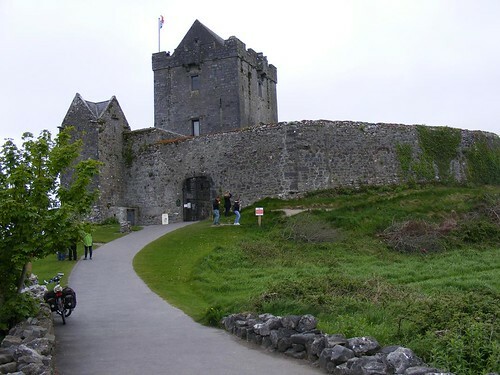 The castle was built in the late 1400s by the McMahons and remained in the McMahon family until 1588 following a siege. It bacame the home of the Viscount Clare who reared horses for the court of James II but passed into the hands of the Burton family following the Williamite victory and the Burtons lived there until the late 19th century. Today the castle is just a ruin in the care of the Office of Public Works. 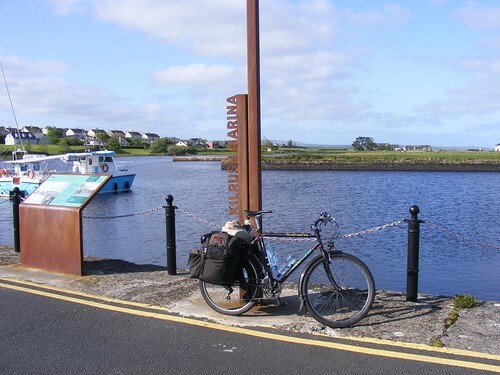 I made the return journey to Moyasta and Kilrush and on towards Killimer where I would take the ferry across the Shannon to Tarbert in County Kerry. The Shannon is just over two miles wide at this point. The road journey via Limerick would be around 85 miles so understandably the ferry service is frequent and very busy as it saves significant time and fuel costs. The crossing on board the “Shannon Breeze” takes about twenty minutes and on a calm day like today it was a very pleasant boat journey for a reasonable cost of €5. There is no extra charge for a bicycle. So after I disembarked the ferry I was now in the Co. Kerry town of Tarbert. 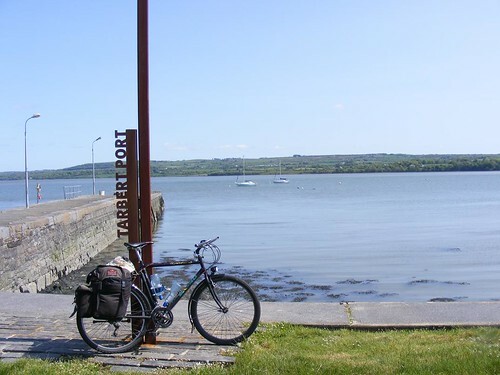 Leaving Tarbert, I stayed on the coast road towards Ballylongford and Carrigafoyle. At Carrigafoyle I detoured slightly to see the ruins of Carrigafoyle Castle. I’ve wandered around the remains of many old castles in Ireland and Scotland but I think this one is my favourite so far. Carraig an Phoill (“rock of the hole”) was built in the late 1400s by Conor Liath O’Connor-Kerry and was considered one of the strongest Irish fortresses and became known as the guardian of the Shannon. The tower covers five stories and is almost 90 feet tall. It was besieged in 1580 and fell to the Crown forces under the command of Sir Willian Pelham and western wall collapsed under heavy fire and the entire garrison were executed and the Earl of Desmond’s valuables were seized and sent to Queen Elizabeth I. The damage was never repaired. Today, it gives a fascinating look at how such forts were constructed as a lot of it is open for examination due to the damaged walls and it is fine example of stone arch building. 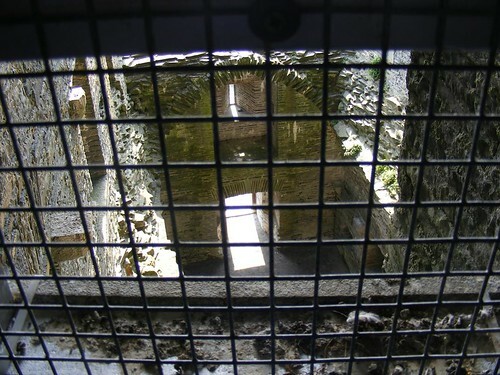 You can climb the spiral staircase to the top and get a commanding view of the entire area. 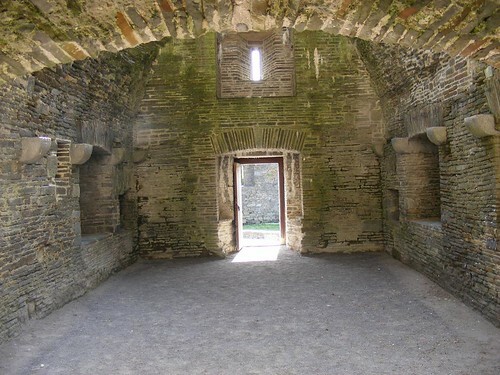 The lower floors have stone floors supported underneath by arches, the upper ones have joists and floorboards and as someone who is nervous with heights, the thought did cross my mind about how old were the floorboards and are they safe to walk on? 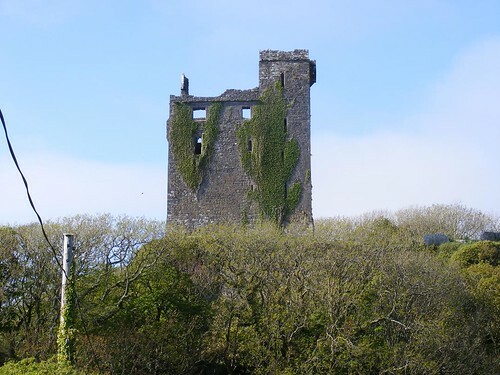 I definitely recommend a visit to Carrigafoyle Castle to anyone who should find themselves in the area. Quite near to the castle you can also see the ruins of Lislaughtin Abbey which was built in the 1470s for the Order of Friar Minor by John O’Connor and permission was granted by Pope Sixtus IV, The Abbey was named after Saint Lachtin who brought in Christianity to this area in the 7th Century. 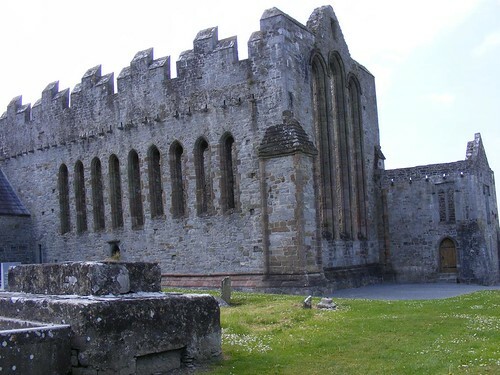 Following the siege of the castle in 1580, the Abbey was raided several times by English soldiers and fell into disuse. My next scenic diversion was to Beale Strand, a quiet and deserted beach. I was there at high tide but when the tide is low you can see the remains of the Limerick based sailing ship the “Thetis” which ran aground here during a storm in 1834 when on a return voyage from Quebec with a cargo of timber and the wreckage can still be seen. The survivers were later arrested for smuggling when a stash of illicit tobacco was found on board the wreck. 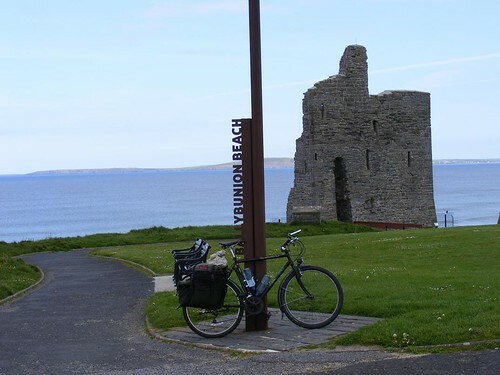 My final stop for the night was in the popular coastal resort of Ballybunion. 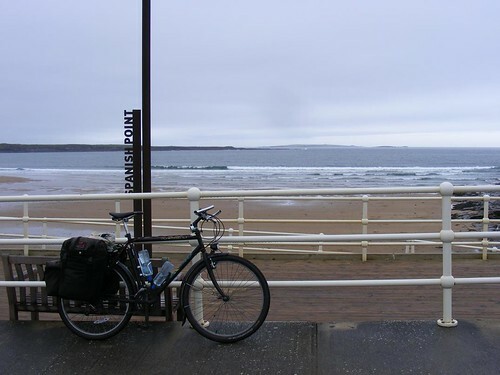 My mileage for the trip so far just crossed 190 miles as I rode down Ballybunion main street. Of the towns I stayed in it was the one which appealed to me least. It just a typical seaside town with amusement arcades, pubs and takeaways, a lot of which seemed to be closed. It had a slightly run-down feel which I didn’t experience anywhere else. There were positives though. 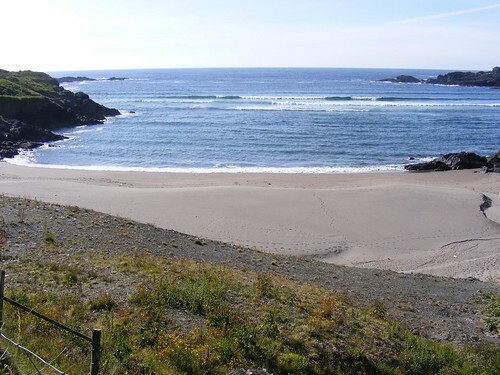 There are two beautiful beaches (the gentlemens beach and ladies beach! Men used to bath on a seperate side from the ladies in more innocent times) seperated by a large clifftop on which the ruins of Ballybunion castle stand. The town owes it’s name to the Bionnanagh family. The castle was built in the 13th century. The castle has been ravaged by nature over the centuries; the relentless pounding of the Atlantic Ocean has eroded the sea-facing walls leaving just the 40 foot high east wall remaining. The remaining wall suffered a further natural disaster following a ligthning strike in 1999 which damaged part of it. Remedial work by the Office of Public Works will hopefully have preserved what is left for future generations. 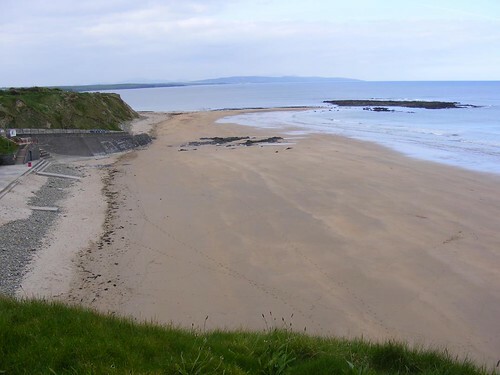 Even if I didn’t find the town very interesting, there is a lot to do in Ballybunion and I wish I had the time to explore the cliffs, sea stacks and the caves, the famous blowhole and there is another beach known as Nuns Beach with no easy access. 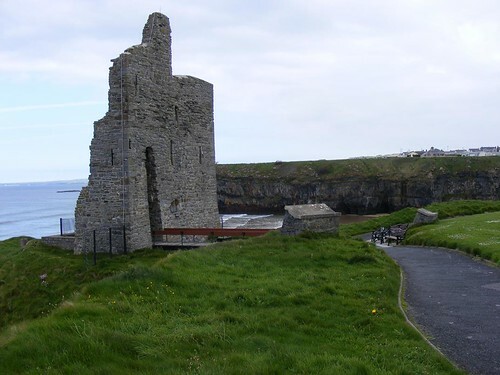 Ballybunion was also once linked to Listowel by a Lartigue type monorail and the world’s first ever statue of former US President Bill Clinton was unveiled to commerate his golfing visit to the town. The following morning was again bright and sunny as I left Ballybunion and made my way south on the coast road towards Tralee. 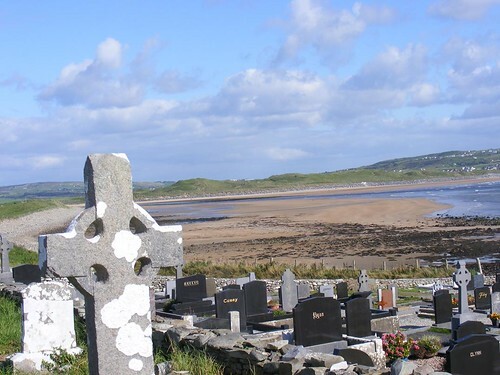 My first scenic detour of the day was to Kilmore beach and graveyard near Ballyduff. 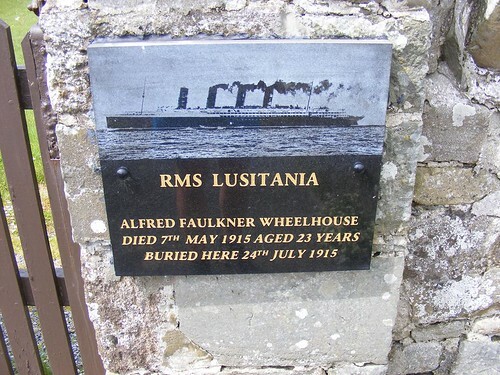 There you can see a plaque in memory of Alfred Faulkner Wheelhouse and mention of the RMS Lusitania. I wondered who he was but further research reveals he was born in Lancashire in 1891 and he was a junior engineer onboard the Lusitania when it was torpedoed of Kinsale Head in 1915 and his body eventually washed ashore at Kilmore where it was buried. 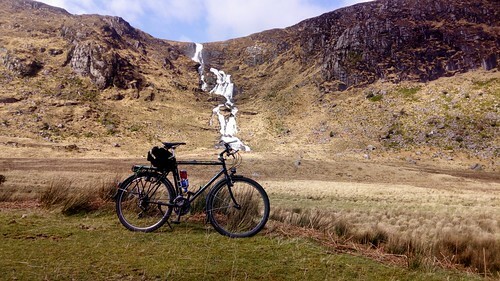 The ride from Ballyduff to Tralee was glorious in the May sunshine. I visited several other small un-named harbours and beaches as I made my way towards Kerry Head. 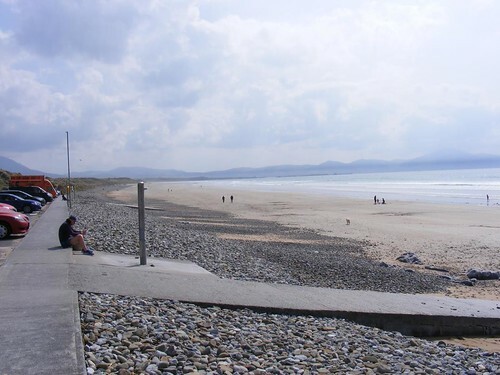 Banna Strand was probably the nicest of the beaches I saw on this trip with many miles of golden sand stretching in both directions. 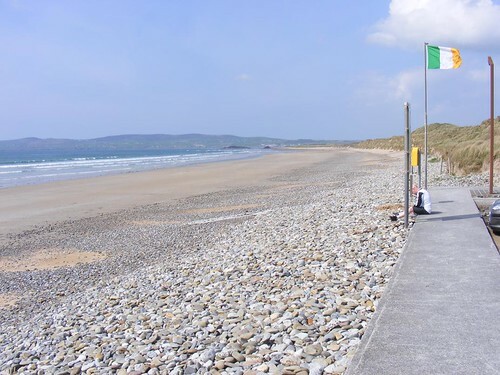 Banna Strand was where Sir Roger Casement returned to Ireland on board a German U-Boat after being in Germany to secure arms for the independence struggle. Casement was a distinguished British Diplomat with Republican sympathies. After leaving the U-Boat his dinghy overturned near Banna Strand where he was rescued and arrested and later hanged for treason in London. 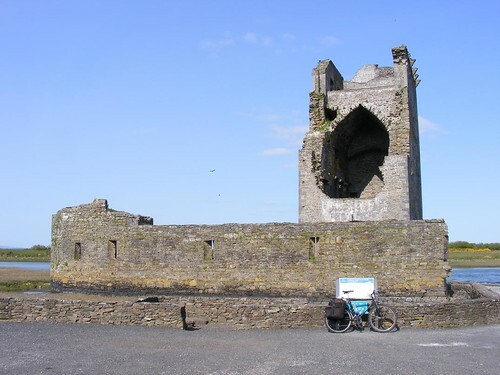 From Banna, it is a short ride to Ardfert where you can see the remains of the Cathedral built in the early 12th century and dedicated to St. Brendan. The building is a thing of real beauty and apparently borrows archetectural designs popular in the south of France in that period. It was destroyed during the 1641 Irish Rebellion but later re-roofed and united with the Limerick Diocese. The roof was again removed following the opening of a new Church of Ireland Church in 1871 and following the Disestablishment of the Church of Ireland Act in 1871 it passed into the hands of what is now the Office of Public Works who have carried out some repairs and restoration over the years. 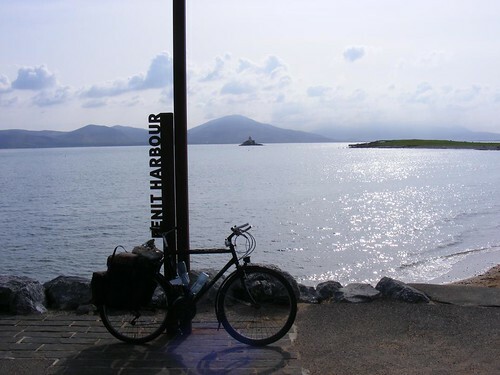 Continuing along the coast you reach the small village of Fenit (An Fhianait, meaning “The Wild Place”). It is a fishing port with a marina for pleasure craft and small harbour of a lot of history. It is also the most western commercial port in Ireland. St. Brendan the Navigator was born near here in 484 AD. 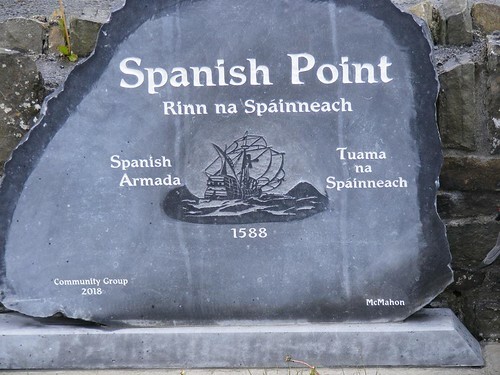 During the Spanish Armada, the Nuestra Señora del Socorro was surrendered here and the crew were marched the six miles to Tralee Castle and hanged. 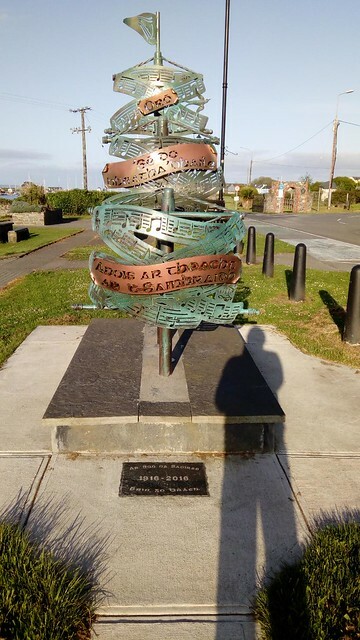 It was at Fenit harbour where Sir Roger Casement had hoped to land the cargo of German arms onboard the Aud but the ship never reached Fenit and was scuttled in Cork harbour by it’s German captain to prevent the arms falling into British hands. During the Civil War, 450 Free State Troops landed at Fenit on board the Lady Wicklow in an attempt to take Munster from the Republicans. History was to repeat itself in 1984 when the Provisional IRA attempted to land arms at Fenit but it was again thwarted by the authorities. You can see the remains of the railway line which operated between 1887 and 1978. 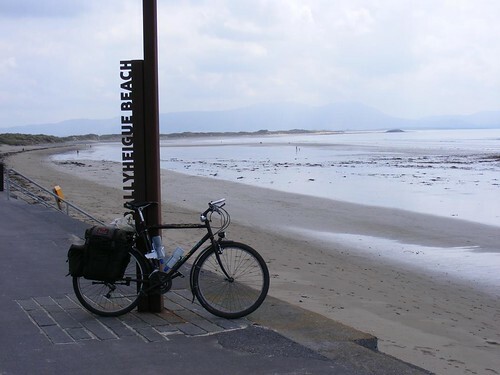 From Fenit it is only a short six mile ride along Tralee Bay into Tralee itself. It would be in Tralee where I would spend the night. My running total was now just short of 250 miles. 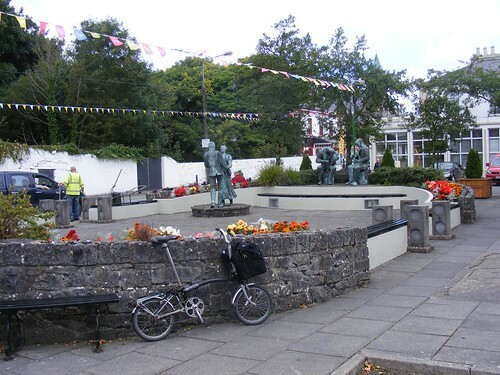 The town of Tralee (or Tráigh Lí) is the county town of Kerry and has a long history – being founded by the Normans in the 13th century on part of an ancient roadway which travels over the Slieve Mish mountains. The modern town layout was created in the 1820s and the town centre contains many fine buildings from that period. I didn’t particularily like Tralee last time I was here as it all seemed very mixed up and a traffic nightmare due to roadworks everywhere. Nine months later, it all made sense. Large areas of the town centre have been pedestrianised or traffic restricted and it makes a very pleasant town without the noise, fumes and congestion which would normally be present and it doesn’t seem to have affected business for the shops, etc in the area. I wish more town councils would have the foresight to do this and reclaim the streets from the motor car which is surely the most inefficient way possible of travelling around a town. 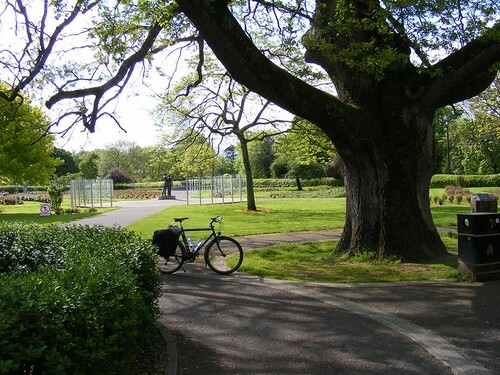 The other hugely impressive thing about Tralee is the beautiful park areas. 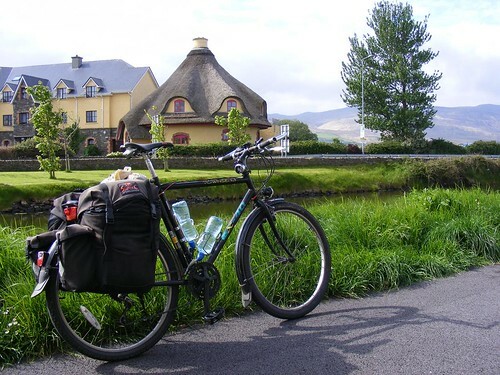 Getting to Tralee had finished off the bit I wanted to do to complete the south section of the Wild Atlantic but as the weather was good and I still had time I had decided to go to Dingle for one night. It would be a relatively short day in terms of distance but there was something I wanted to do before leaving the Tralee area. 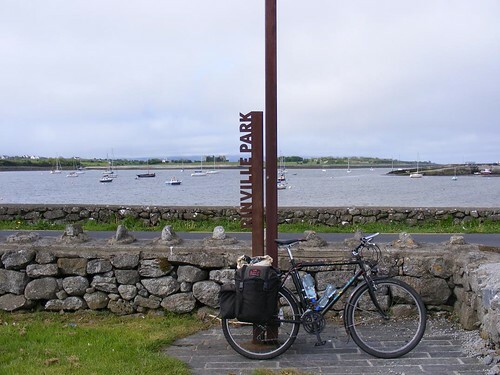 On the outskirts of Tralee there is a small town called Blennerville. 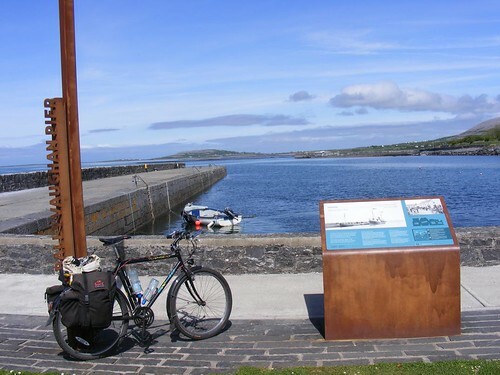 It was once a busy port before the building of the Tralee Ship Canal which could take steamships into the heart of Tralee. 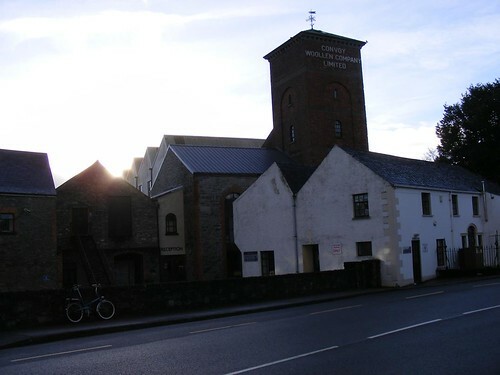 It is also the location of Blennerville mill which I recalled from my last visit and wished to visit if possible. 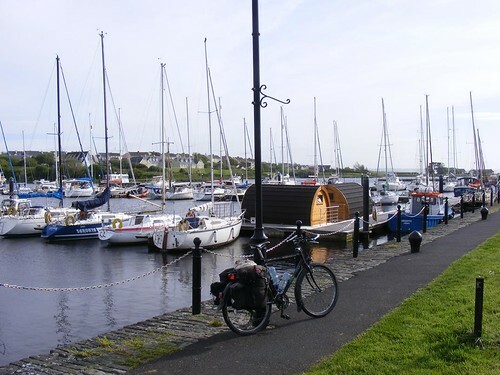 The ship canal is interesting in itself and was first proposed by the merchants of Tralee in the early 19th century as they were unhappy with the quay at Blennerville as it was too shallow for the larger ships and was prone to silting up. 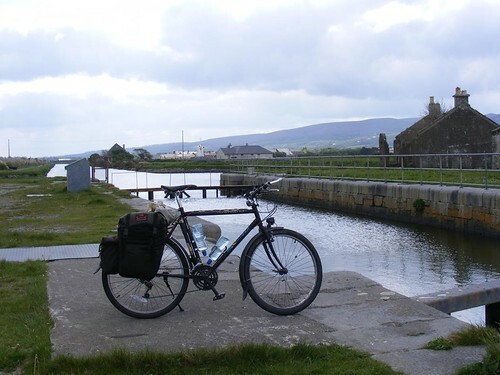 The building of a canal into Tralee was authorised by an act of parliament in 1829 and worked commenced in 1832 although it didn’t open to ships until 1846 as the construction was delayed many times due to a lack of funding. The canal was just two miles in length with several lock gates and also a swing bridge at Blennerville and could carry ships up to 300 tons. 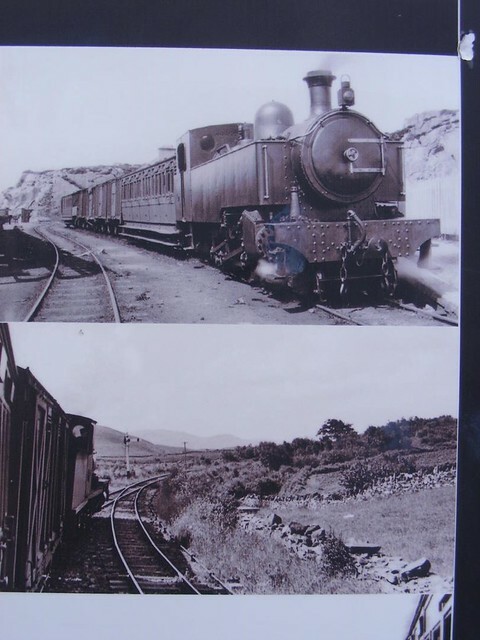 It was to have a short working life though as it was also prone to silting up and the improvements to the deep water port at Fenit and subsequent opening of the rail link between Fenit and Tralee brought about it’s decline and it fell into disuse and was officially closed in 1951. 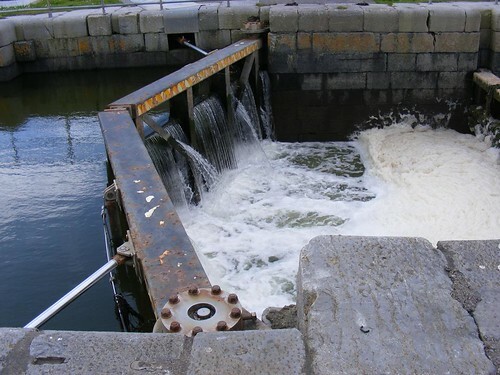 In 1999, an investment of IR£650,000 by the Office of Public Works dredged the canal and restored the lock gates and re-opened it as a tourist attraction. 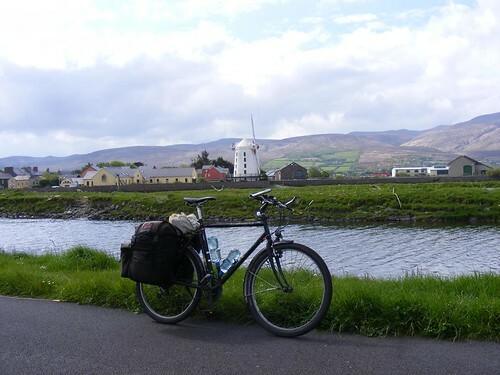 I rode the tow path on my way to Blenneville and it is a very pleasant if very short route and gives excellent views of Dingle Bay and the Blennerville windmill on the other side. I then arrived at the windmill. The mill is of a type known as a tower mill. At just over seventy feet in height it is the tallest of it’s kind in Europe and was built in 1800 by Sir Rowland Blennerhassett who also gave his name to the village. 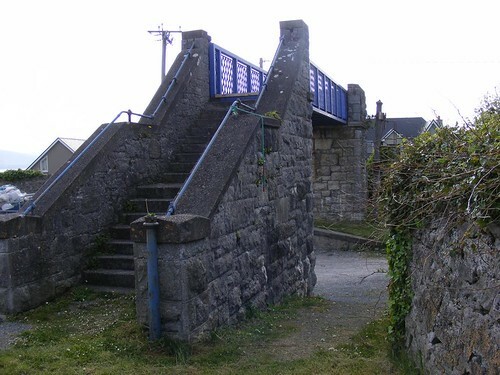 It’s purpose was to grind corn for export to Britain but with the silting up of the river channel at Blennerville and the creation of the new ship canal which took the new larger steamships into Tralee itself the mill fell into disuse in the 1880s. 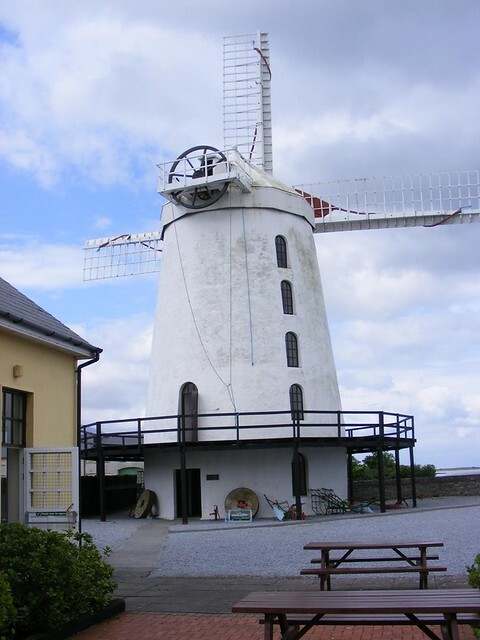 It was purchased by the state and restored in the 1980s and is the only commercially operated wind driven corn mill in Ireland as it does take in corn for rough grinding as cattle feed at harvest time. The mill and the museum was thankfully open when I arrived although it wasn’t in operation as the wind was from the wrong direction. I found the tour fascinating and one of the highlights of the trip. With this type of mill the top can be rotated around to face the wind but this is a manual operation by pulling a chain which loops a wheel. It is geared down to make it easier to turn but I learned that it takes 90 minutes to rotate it through 180 degrees so they tend not to bother. By looking through old records and history books the staff have learned that back in the day, they knew the wind came from the sea when the tide was coming in so that was when they worked so they do the same now. There were once many such mills in Ireland (an estimated 400) although most are in ruins now. An easy way to tell the difference between an old windmill or a castle/military tower should you spot a ruined tower somewhere is that the windows are all on one side and in complete alignment on a windmill tower and this was actually an architectural weakness as the side with windows tends to collapse over time, especially if the roof has come off and water washes away the mortar. 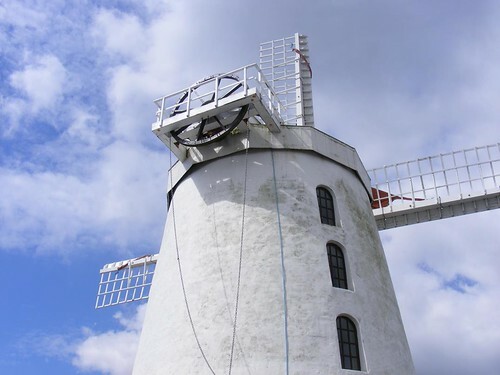 This mill actually differs slightly in some respects to others found in Ireland as Sir Roland Blennerhassett travelled widely and brought back ideas from other parts of Europe. 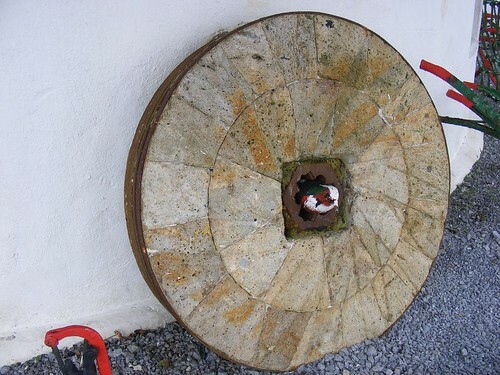 Every millstone I have ever seen is made in one piece, usually from granite whereas the ones used in this mill are faced with seperate tiles so it was quick and easy to replace a tiny part should it get damaged. The stone used was also imported from France as it provided a higher quality flour. The original millstones can be seen outside. Millstones are heavy things and when a windmill loses it roof and the rain gets in, they end up falling through the floor. This had happened at Blenneville too, in the muddy silt beneath the mill, they had sunk into the ground to a depth of 25 feet and had to be be recovered when the mill was being restored. 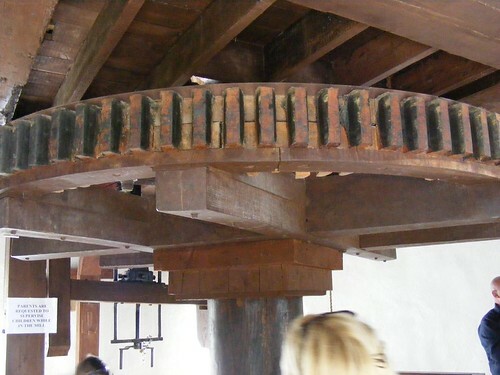 Inside the mill you can see the relatively simple machinery which drove the millstones. The driving mechanism is really just a crown wheel and pinnion similar to the differential in a car only on a grand scale. The main shaft running through the mill from top to bottom is around eighty feet in lenght and made by hand from a single a tree as they couldn’t find anywhere with a lathe large enough to make it by machine. 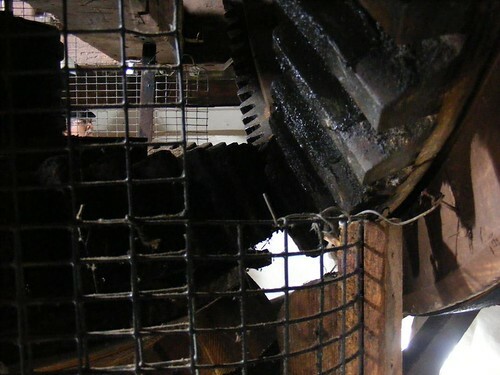 The crown wheel teeth are made from wood and the pinion from steel – the reason being that it prevents sparks which could be a major fire risk inside a flour mill. In the old days, machinery was lubricated with goose fat or lard which of course attracted rats and it was a legal requirement to keep a certain number of cats in an effort to control them. Hygene was a problem with flour making in those days as a result. 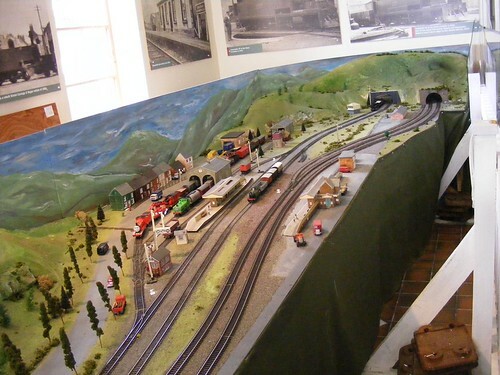 The museum complex also has other attractions including a lot of model railways – modelled on the Kerry narrow guage network I believe, some old roadsters and motoscooters including a little Honda C50 which was once a common sight in rural Ireland and given Blennerville’s nautical past – a lot of maritime displays including models of the coffin ship “The Jeannie Johnston” which was based here and amongst other things the anchor rescued from the Aud which was used in Sir Roger Casement’s failed attempt to land German weapons in Ireland. 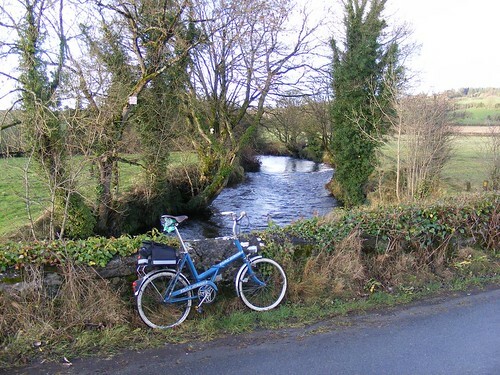 From there I made a leisurely ride to Dingle, the most relaxing of the tour really as I had only around 30 miles to cover today. 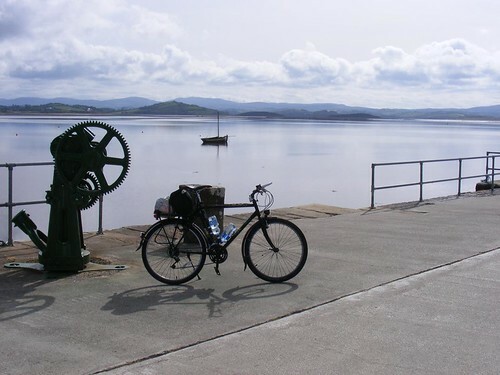 It is a tough 30 miles though with some severe climbs which necessitated the use of my 28 tooth inner chainwheel for miles on end and the wind had changed direction now too. I’m sure the windmill was now working well when I wasn’t around to see it but such is life! 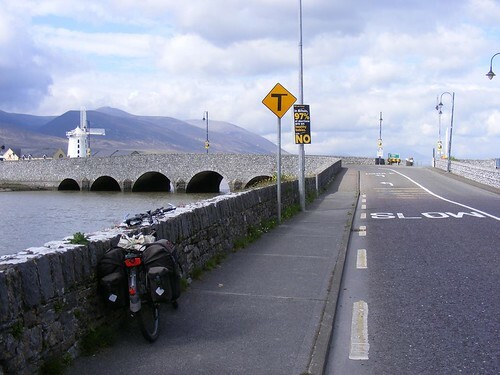 There are many roadworks being carried out on the N86 which links Dingle and Tralee and the improvements seem to involve widening the road and removing dangerous bends but also a proper cycle path with good tarmac surface which runs alongside it. 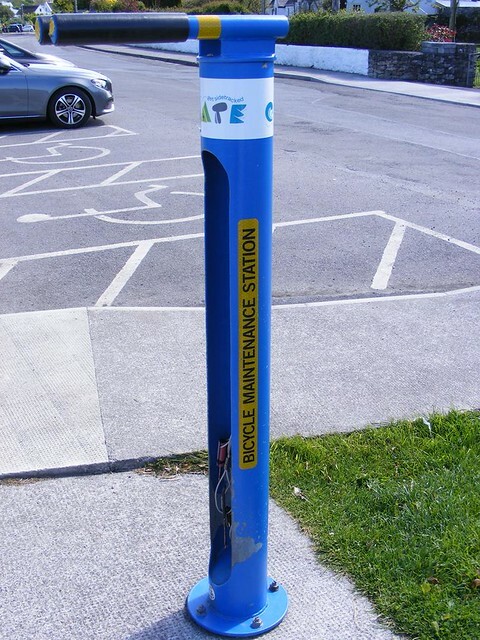 It makes for a much more pleasant cycle journey without feelings of being in the way of cars and yet again I applaud Kerry County Council for forward thinking. The only real stops I made enroute was in Annascaul (which was the birthplace of the famed Tom Creann, the Antartic explorer who accompanied Ernest Shackleton and Captain Scott on several exploration trips) and also at the small village of Lios Póil to to look at the remains the railway viaduct there. 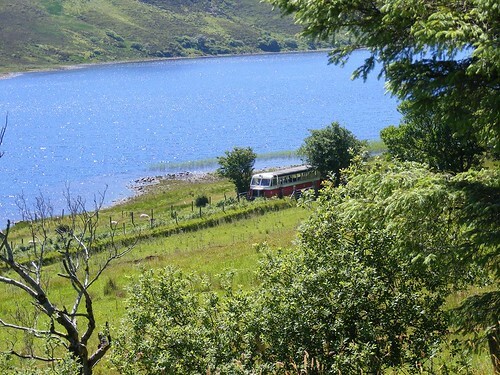 It is a very picturesque route along the N86. The alternative would have been over the top of Connor Pass which is Ireland’s highest mountain pass but I declined that option today. I still have bad memories of my aborted attempt (due to being literally blown of my bike) on the Viscount last September. 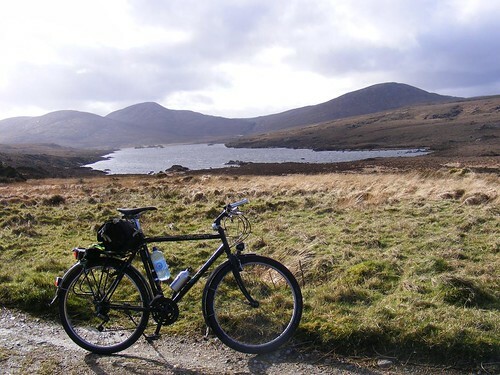 I think if I am back in the area again, I will do it but will spend two days in either Tralee or Dingle so that I can leave my luggage at the hostel. 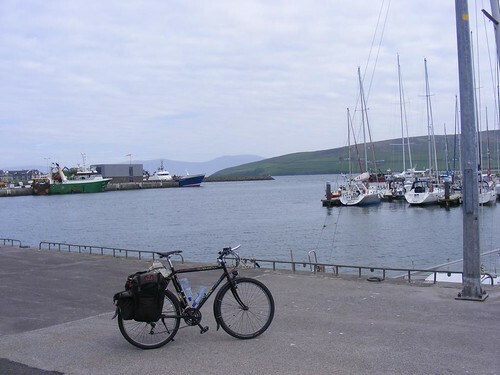 I considered extending my ride to Brandon Creek but I had covered almost 300 miles in 6 days with a loaded bike in often difficult terrain and I just wanted to relax and was happy to sit in the sunshine at seafront in Dingle and watch the world pass by for a time before checking in to the Grapevine Hostel, having a wash and change of clothes and going in search of some food. I really like Dingle as town to stay in. I wrote about it’s history after my last trip. I enjoyed all the live traditional music sessions this time. In the morning, I had to re-trace my steps back to Tralee to get a train back to Dublin. It may be only 30 miles but don’t underestimate how difficult and time consuming this ride can be. I was pleased to beat the Google Maps suggested time on a bicycle but it was far from speedy! I arrived in Tralee with plenty of time to spare but actually found it difficult to find the station and had to ask for directions! I had time to change back into civilian clothes in the station toilet before getting on the train. It was nice to sit looking out of a train window and watch the world pass by. It was Royal Wedding day of course and the female passengers were all crowded together watching it on someone’s tablet and commenting on the dresses etc. Changed times in Co. Kerry when they are watching a Royal Wedding! Free Wifi means there is now no escape from the outside world – a good thing and bad thing! I had to change trains in Mallow and arrived in Dublin perfectly on time. I had a short journey journey from the station to the city centre but unfortunately just missed the bus I had hoped to catch and had an hour or so to hang around Busarus waiting for another. It was awkward as I’d have liked to have gone and got some proper food but didn’t really fancy leaving my bike and it’s luggage unattended in a busy city centre area. It was after 11 o’ clock when I was finally back in Letterkenny with just the short 1.2 mile journey journey to complete to my home. I was tired but happy. This was one of my most enojoyable tours so far and I was hugely impressed with the bike. 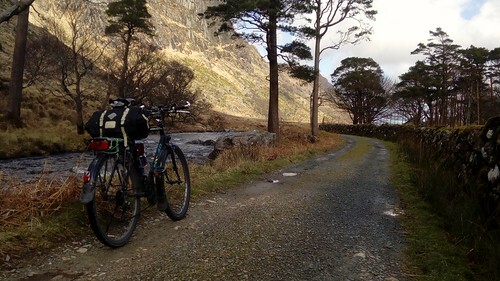 I had reservations and was tempted to use my Visocunt as I have done for all my other longer tours but I think an old MTB works brilliantly as touring bike. 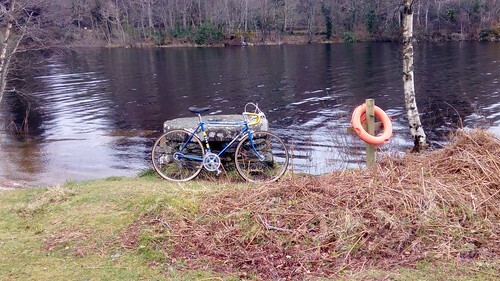 The frame is stiffer and handles heavy panniers better and the lower gearing, although I happily rode the Viscount without it, was appreciated at times. Two inch wide semi slick tyres means I could ride it virtually anywhere. 700c wheeled bikes do feel more responsive but for a ride like this at low average speeds it’s practically irrelevant. The cantilever brakes are confidence inspiring on long descents with heavy loads in a way that calliper brakes aren’t. The only fly in the ointment was the saddle, I find the Charge Spoon comfortable enough but after sitting on it for hours, day in, day out, I yearned for the comfort of a Brooks. This is an easy fix however. On a bike the internet tells me is bike shaped object, I had covered 340 miles in 6 days and enjoyed every minute of it! Walking home from work one frosty winter’s evening, in the twilight, I spotted a vandalised bike hanging forlonely by a cheap cable lock from one of the bike racks outside the library. I didn’t pay much attention beyond registering a certain sadness that someone would do such a thing to someone else’s property but sadly such acts are commonplace. A week later it was still there so I took a proper look. 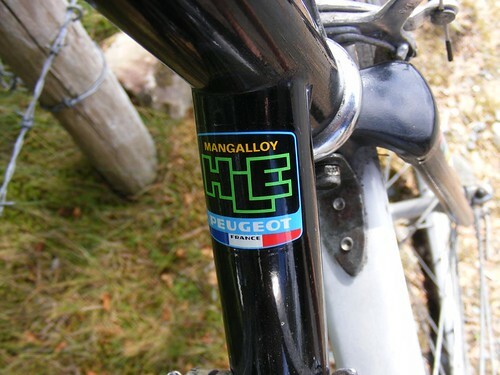 To my surprise it was not one of the usual cheap supermarket bikes but it was a 1990s step-through framed Raleigh Pioneer Jaguar with Cro-Mo tubing. The wheels were beyond repair but everything else looked savable. It seemed a shame to see a decent quality bicycle left like this but it wasn’t mine, I didn’t need it and to remove it would still be theft even though it was clear the original owner had no intentions of taking it for repair. A few months passed and the bike still remained. Someone had broken the left had gear shifter by now too. I decided the frame was too good to leave lying there until it was vandalised further or taken away for scrap by the council. I wasn’t sure what to do as I had never claimed an unwanted bike in this way before. I decided to do it legally so I emailed both An Garda Siochana and the local council, neither of which could be bothered to reply to my emails (why am I not surprised by this?) so finally after a few more weeks passed, I went into the library and asked the librarian if she knew anything about it and explained I would like to take it. My offer was greatfully recieved as they had been waiting for months on the council to come an take it away for them. So I set to work to remove it. I armed myself with bolt cutters and a hacksaw but as it turned out, I didn’t even require tools to break the lock. I guess the moral of the story is if you are worreid about having your bicycle stolen, buy a quality lock but there again, any lock is only a guarantee against an honest man! If they want it, they’ll get it somehow. I inspected what I had acquired when I got it home. The wheels were scrap but I knew that anyway. They weren’t just bent but someone had used a great deal of violence to not just bend but to actually break the rim. Both tyres were almost new however and still inflated so both tyres and tubes seemed fit for further service which was a nice unexpected bonus. The bike was sadly fitted with twist-grip shifters which I personally hate and the left one for the front derailleur was broken but the right one seemed to work fine. This was a minor issue really as I had a spare trigger type friction front derailleur in my bits box so that would work as a cheap replacement for the broken one. The bike had been fitted with plastic mudguards which unfortunately had also been smashed beyond repair by the vandals. I would need to replace them with something as a bike without mudguards isn’t very practical (in my opinion) in this country. 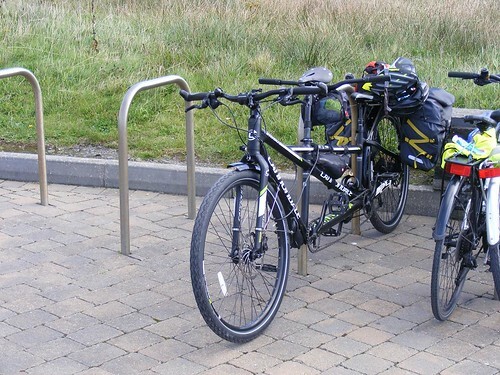 The other nice surprise was that the bike was fitted with a very good quality rear carrier rack, a very practical addition to any bike for utility use. It may not be a high end bike but this was still a bike of decent quality in it’s day and clearly the original owner had had it well kitted out. 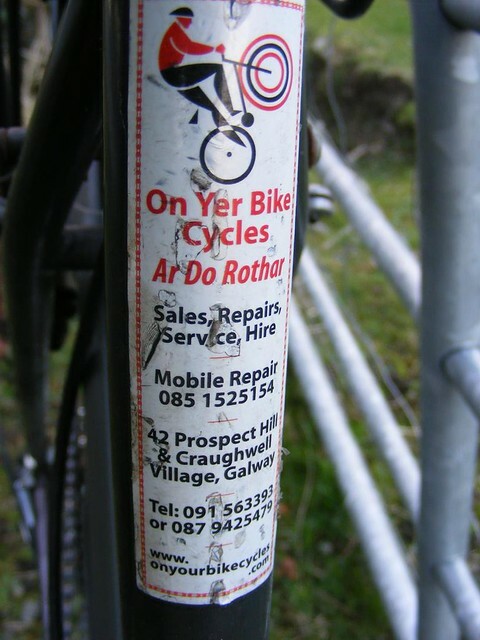 The dealer sticker on the seat tube suggests that the bicycle originated in Galway. When I first glanced over this bike in the dark I thought it had a triple chainset but it is only a double, what confused me in poor lighting was the black plastic bash-guard which in poor lighting under sodium street lights looked like a third ring! Perhaps it’s time I visited the opticians! Still it could have been much worse as it was a 40/48 double (rather than the dreaded 42/52 racing gearing often found on older bikes) which when combined with the 14-28 block gives a perfectly decent range of gearing for most purposes. This gearing is good enough for touring really. I decided on a quick and cheap overhaul – “The best laid schemes of mice and men….” The bottom bracket was very stiff and gritty but it was cup and cone type so I hoped some fresh grease and new bearings would restore normal service. Thankfully it turned out to be fine once I cleaned it up and repalced the very rusty caged bearings with loose 1/4 inch ball bearings – 11 on each side. I prefer to use loose ball bearings for these as I find it runs smoother and lasts longer. The bottom bracket told a story of how much this bike had been neglected though – I have rarely seen one in such dire need of an overhaul and bear in mind this was a bike that was presumably in regular use rather than something which had languished in a shed for thirty years. I had a spare 700c steel wheelset which I had intended to use as I wasn’t planning on using them for anything else in the forseeable future. Problem number one – the front axle was bent when I went to overhaul the bearings – solution – rob the axle from the damaged original wheel which was the correct dimensions. So far so good. Problem number two – there were some broken and damaged spokes in the rear wheel. 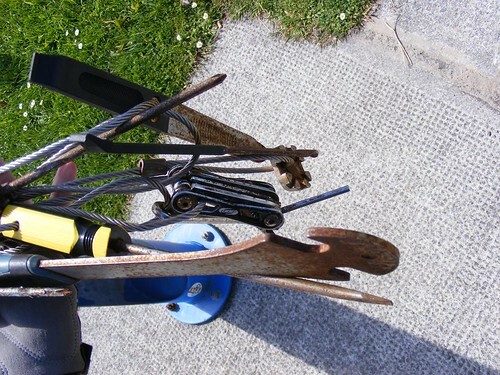 Cheap solution – rob the remaining undamaged spokes from the original wheel which were conveniently the same length. I had the wheel trued up perfectly but every time I ventured for a few miles test ride, I heard the dreaded ping which informed me another spoke had gone. As I would probably end up selling this bike, I couldn’t or wouldn’t sell it to anyone like that. The rear wheel ideally needed rebuilt with new spokes but it probably made more financial sense to buy a cheap replacement rear wheel which is what I did. The replacement is alloy too so lighter and better braking in the rain. When I did that, I decided to repalce the steel front wheel with a spare alloy wheel I had lying around. When I was cleaning the crud of the chain and freewheel block, I noted that they were very worn, so much so I could see daylight between the chain and sprockets. I thought there would be a chance that as they had worn together they might just still work fine for another while but the chain was skipping on some sprockets so I repalced them too. This was starting to get expensive but if it’s worth doing, it’s worth doing right. I have never been one to worry too much about cosmetics but I do like things to work properly from a mechanical point of view. My first attempt revealed very imprecise shifting, even with a new chain and freewheel but closer inspection of the rear mech revealed several things. The mounting for the cable stop had movement which it definitey shouldn’t have. It was an easy fix though as I just removed the mech and supported the rivets from underneath and hammered them tight again with a small ball pein hammer. There was also a lot of unwanted free movement at at the bolt which mounts the derailleur to the hanger. There seemed to be play in the nylon bush which was allowing it to move. I’m not sure if this part can be bought seperately but I took up the slack with a 10mm washer carefully filed to suit. These “modifications” were enough to restore a crisp gear change. 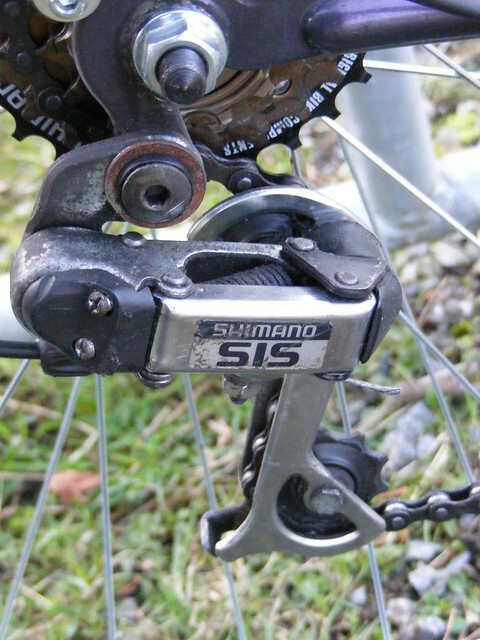 I’ve always found basic Shimano works very well if everything is as it should be. A set of cheap plastic mudguards were added too to the growing price tally. They’re not bad really but with hidsight, something better would have been longer and given better protection but they are sturdy and well made and they should last well enough and are solidly mounted and rattle free although to achieve this I did fit an extra mount with a small P-clip to the rear rack. So with new wheels, new chain, new block, new cables, new mudguards and new brake blocks for the Shimano Cantilever brakes , how does it work. The answer is very well. 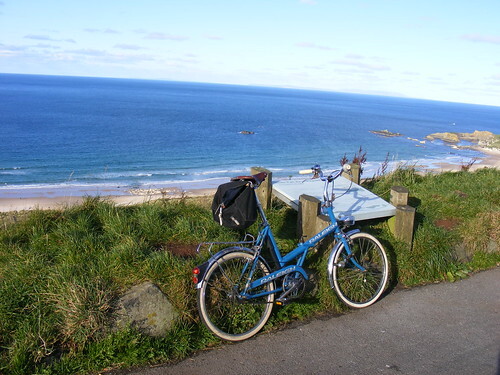 The bike is smooth and responsive and I’ve covered probably about two hundred miles on it so far and to be honest it was with some sadness that I have now passed it on to friend who wanted to buy it. 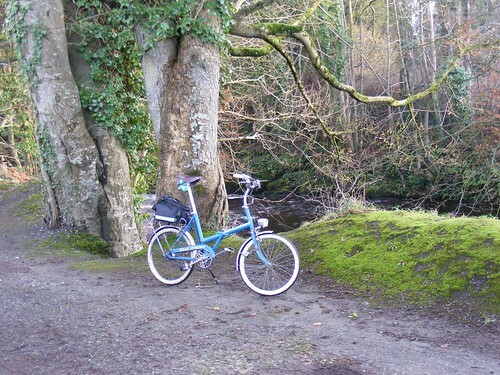 I had got used to rambling, leisurely ten or twenty mile rides on it after work now that the there is enough daylight. It is a very relaxing bike to ride. 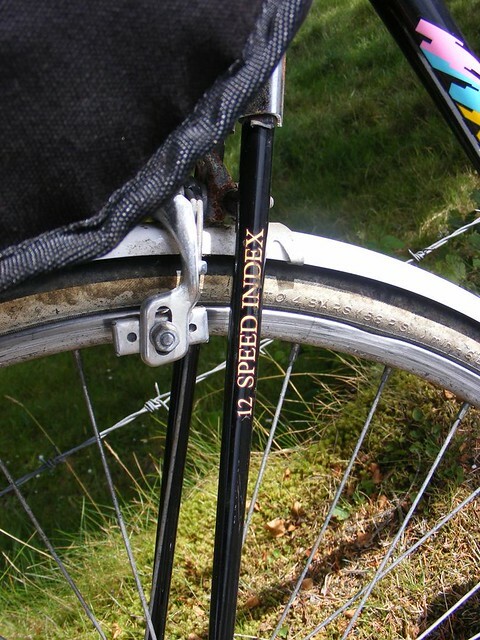 There is just about enough seatpost extension for me to pedal efficiently and despite it’s sit up and beg nature it is possible to maintain decent speed and it is really responsive. The cantilever brakes perform very well, maybe my skills at adjusting canti brakes are getting better but this is the best canti setup I’ve ridden so far. My only real niggle is the horrible handlebars. At twenty-five inches wide, I find them just too wide to be comfortable and they are also straight. I suppose bar ends would fix this but I think if I were to keep it for myself, I’d swap the bars for something else. I found on my mountain bike that cutting the bars down made and fitting bar ends made it very comfortable but these have a rise so cutting them down isn’t really an option. This bike cost me about €80 when I add up all the bits I bought for it. For very little more I could have bought a brand new bike from Argos or similar but it wouldn’t ride like this. It wouldn’t come with rack and mudguards or puncture resistant tyres (rescued from the old wheels) either. 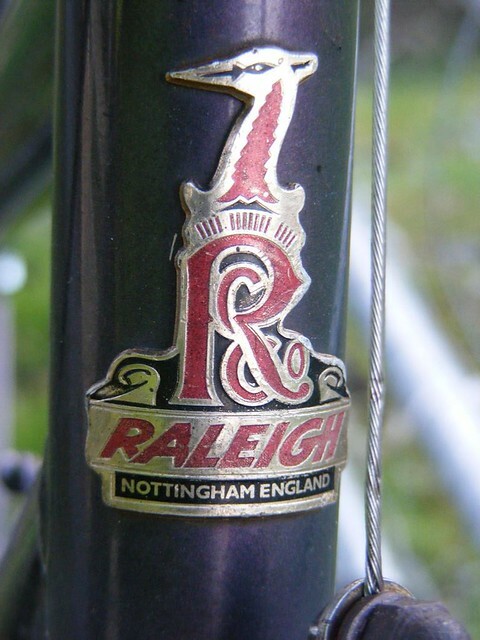 This is a real Raleigh – Nottingham-built from quality steel tubing with decdes of expertise behind it’s design. I admit I prefer the look of their older lugged frames but that is just a cosmetic thing, this rides just as well in my opinion and after a walk around Halfords, none of today’s bikes have such neat welding and I know many say Raleigh’s quality started to tail off after WWII (it did in reality) but after twenty or more years use and after at least one winter left lying in the steet facing the elements, the paintwork is still sound and rustfree. 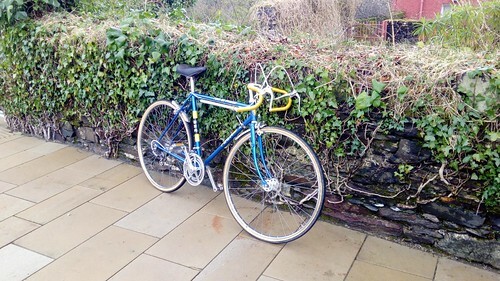 I think it was worth spending the time and money to return a fine, if basic old bike from one of the world’s most famous cycle manufacturers back to the road where it belongs and I hope it will give it’s new owner many years of enjoyment. 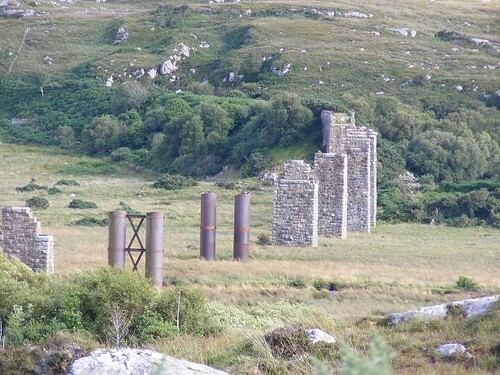 A few years ago due to my involvement in the Errigal Arts Festival at the time, I had joined a group for a guided walk along part of the remains of the Londonederry and Lough Swilly railway line which once ran between Letterkenny and Burtonport in the extreme west of the county. Parts of it have been converted to paths for recreational use and I thought at the time, that although it is mostly aimed at hikers, it is perfectly doable on a mountain bike. 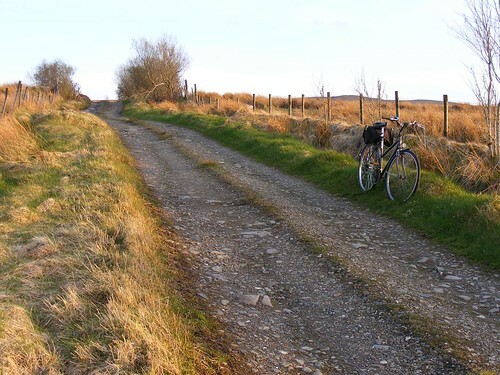 The parts which have been well surfaced with gravel could be ridden on anything which doesn’t have high-pressure skinny racing tyres but other parts would call for a bike with proper off-road capability although it’s not a technical trail as it’s more or less flat, it is muddy in places and wide tyres with grips are called for. 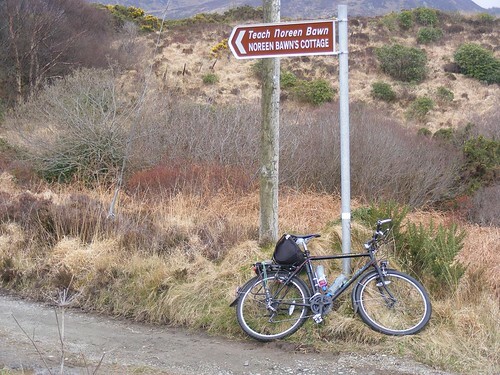 The section I was interested in, partly because I had previous experience of it on foot and also because it is only about twenty-five miles away from where I live so accessible for a day ride is the part between Creeslough and Falcarragh. 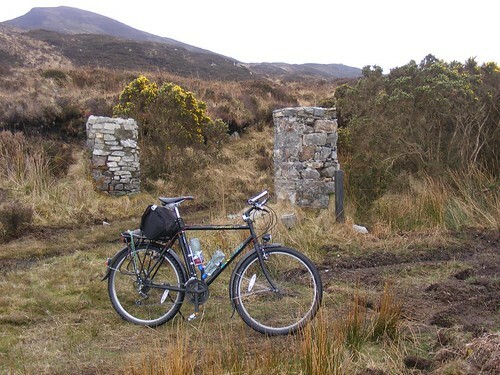 The trails only start just outside Creeslough anyway. It is possible to see the remains of much of the infrastructure from the railway prior to Creeslough but it is very over-grown and the infamous Owencarrow Viaduct, scene of a fatal rail crash in the 1920s when a gale derailed a train from the top of it is a now a partially dismantled ruin. 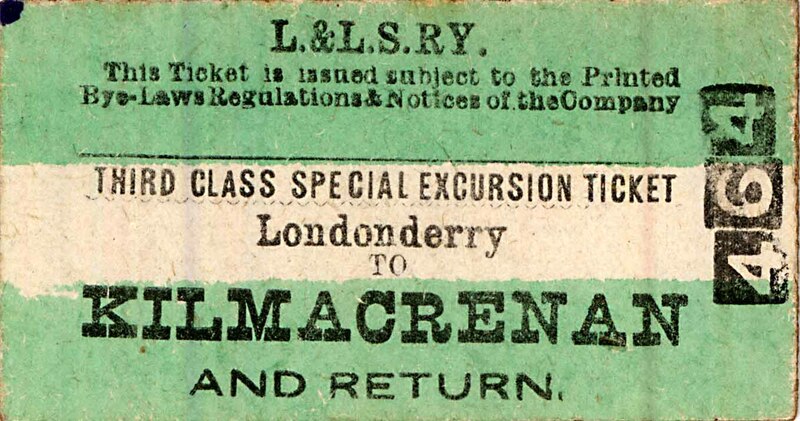 Work commenced on the line between Letterkenny and Burtonport in 1901 and it opened in 1903 as a joint venture between the British Government and L&LS Railway Company but it was never a commercial success and struggled from the start to make a profit. 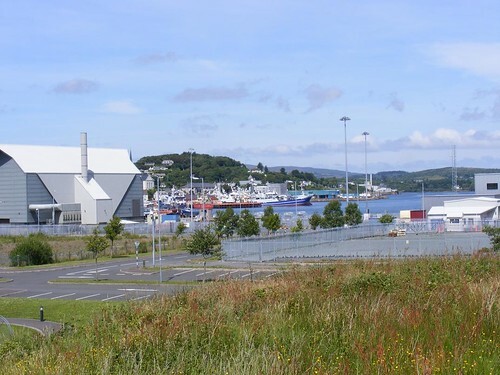 It planning possibly wasn’t what it could have been as it was built mainly to transport fish from the west of Donegal to Letterkenny and Derry where it could be then easily transported elsewhere once it joined the mainline connection to the busy ports for exports to the UK mainland. It seems the problem was that the passenger side of it never really reached it’s potential, mostly, I suspect because although it touched on numerous remote towns such as Kilmecrennan, Cresslough, Falcarragh, Gorthaork, etc, the stations were often miles away from the towns themselves so it wasn’t as useful to the local communities as it should have been. Clearly the decision was made to take the easier, cheaper route without actually considering how useful it would be. Officially it closed in 1942 although trains did continue to run at reduced frequency until 1947. That was all over seventy years ago now and we can look today at the remaining wonderful feats of civil engineering in all the beautiful stone arched bridges that existed along the route and wonderful if tragic ruins of the Owencarrow Viaduct. Cine film footage of the railway journey itself, made in 1937 by the late Father Doherty has survived and a little of it can be seen on the RTE archives. I will take the liberty of posting a link to it. 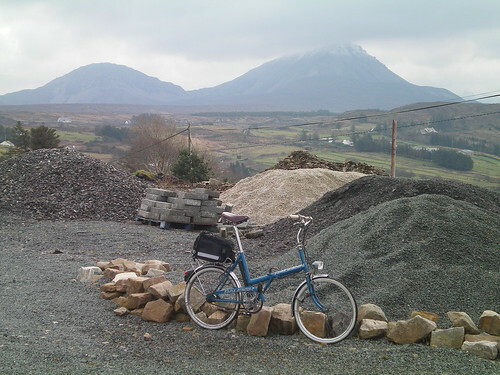 The potential for converting parts of the once extensive railway network which criss-crossed the country can be seen with the success of the Mayo Greenway in Westport/Achill. I hope to see something similar carried out in Donegal. 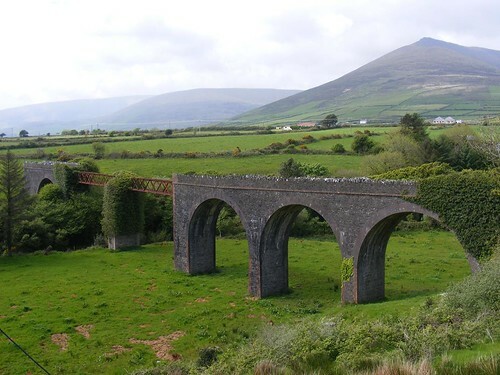 My personal favourite would be old Ballybofey to Ballyshannon line through Bearnas Mór but this one comes a close second as it offers great views of the Derryveagh Mountains. Railway lines make great cycle paths as the Victorians built them on the level and removed obstacles wherever possible. You can see many examples of this on the Cresslough to Falcarragh section of this railway line but I’ll come to that later. The ride to Creeslough was enjoyable but uneventful. 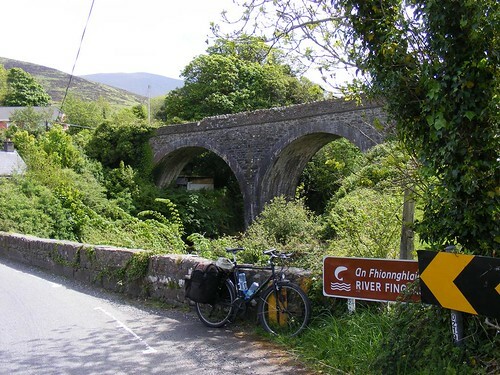 I took mostly the minor roads towards Churchill, passing Lough Gartan and towards Glenveagh before turning off across the Owencarrow valley and passing the viaduct and over the stone bridge where the railway crossed underneath the road before briefly joining the N56 a few miles east of Creeslough. I normally hate main roads but the N56 isn’t particularly heavily trafficked this far west. 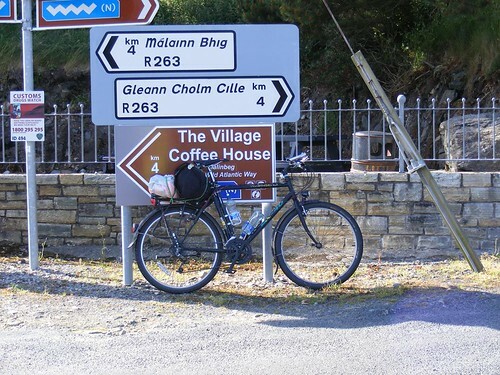 The starting point I was aiming for is a few miles on the other side of the village, taking a road to the left just at the old graveyard and passing Muckish Sand and Gravel. First you pass the sign for Noreen Bawn’s Cottage. I did go up the lane but didn’t see any old cottages and eventually arrived at a locked gate. Noreen Bawn, immortalised in the song by Bridie Gallagher (a native of Creeslough and an international singing superstar in her era), was a woman who moved to America and returned sometime later very wealthy but suffering from TB picked up on the voyage home from which she would die. 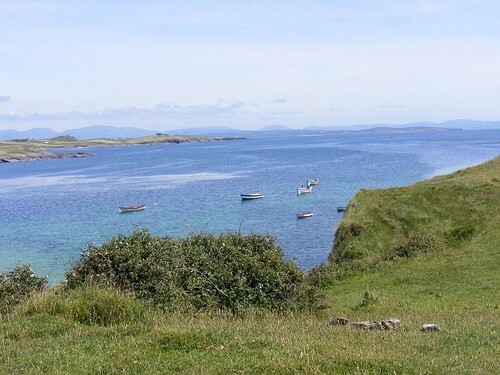 “What is gold and what is silver when your health and strength is gone, when you speak of emigration won’t you think of Noreen Bawn.” Her homeplace was definitely shy of disclosing it’s location. 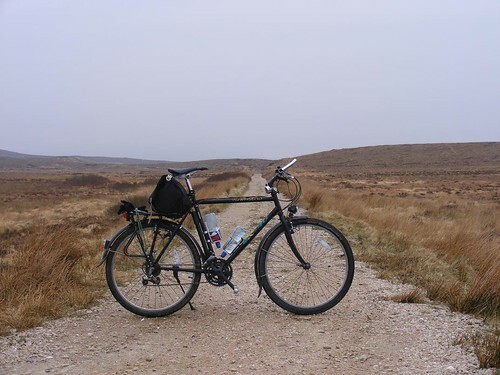 Once you leave the road the first few hundred yards are climbing across a soft, muddy field to the top of the old railway embankment so I appreciated my two-inch wide tyres although it left me wondering why I had bothered to clean my rims and brakes before leaving…. You almost immediately see relics of the L&LS company in the form of two round stone pillars where a gate must have hung at some sort of crossing once upon a time. I’ve been told that this these round pillars are L&LS trademark design and now that I know that I’ve spotted them in other places too. I was now on top of the raised embankment, built to raise the ground and keep the track level and even after all these years you can see the gentle curve and banking/camber used to allow the train to turn a corner at speed and remain on the tracks – known as “superelevation.” I am definitely not an expert on railway construction but when you study things like this you can see and appreciate what great engineers early railway builders actually were. The first mile or so of the path has been cleared but hasn’t been re-surfaced yet so it is rocky, sometimes muddy and progress isn’t much faster than walking to honest, although I am naturally cautious, I ride almost entirely on roads and even though I’m riding a mountain bike, it has been heavily modified to be used on tarmac. It’s obvious at a glance that the building of the railway line was no easy feat. The embankments are easily raised by what I would estimate fifty feet or more in places to bring the rails up to the level of their surroundings and as you progress you come across several deep cuts made through the mountains. I imagine they must have had a huge team of men working on this to complete it in two years as they did not have tools and implements available now to make it much easier to do this sort of thing. You cross a minor road and from there the path is well surfaced with gravel so my speed increases. 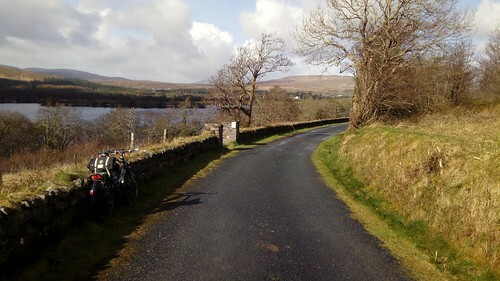 After you pass through one of the cuts, Lough Agher comes into view – a very picturesque secret lake, hidden for many years to all but the local sheep farmers, those old enough to have travelled on the Burtonport train or the determined hiker but now easily accessible again, albeit not to motorists (please keep it like that!). 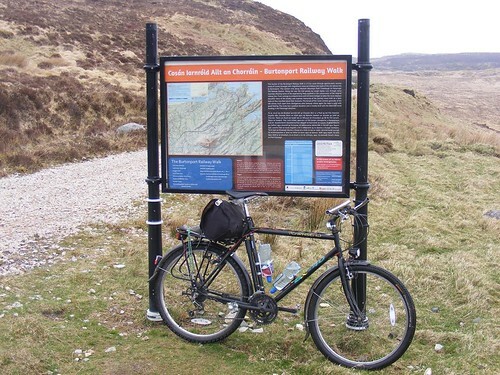 I didn’t go the whole way to Falcarragh (distance about six miles). I had seen the lake which I wanted to see again and the other thing that makes this place spectacular – the close up views of Muckisk Mountain, including the miners path (A very high quality grade of sand was mined on the table-topped Muckish mountain for many years and transported to Ards Pier where it was exported for the manufacture of fine quality glass used in optical instruments.) was deeply shrouded in an ominous dark mist and I could feel occasional spits of rain. I know from previous experience on a hiking trip with a friend last summer that this not somewhere you really want to be if the weather turns nasty. There is also the ruins of an old hunting lodge which is of interest but I didn’t go there today. 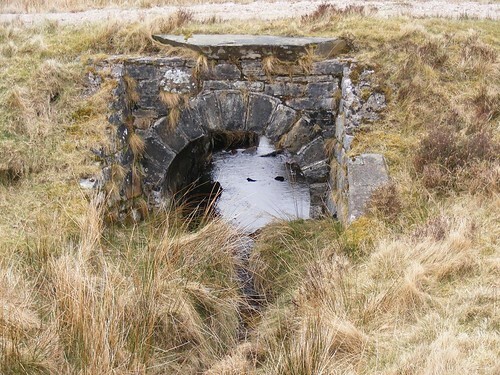 There are many streams which run off the mountain and the railway engineers of yore had built small arched bridges into the embankment to accommodate them. I decided sitting on the edge of one of them was a nice place to sit and eat my lunch which was very much needed by now. 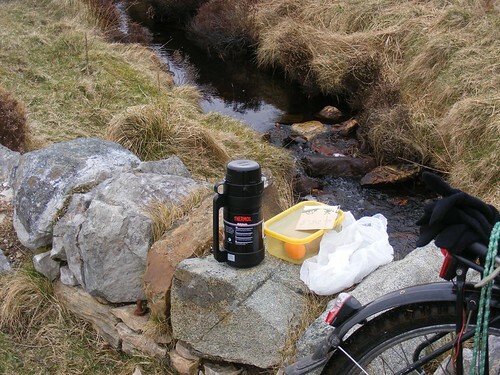 Cafe stops can be a pleasant part of cycle touring but when going to remote places, it is best to bring your own fuel supply! I decided to see what else I could find in the area to do. 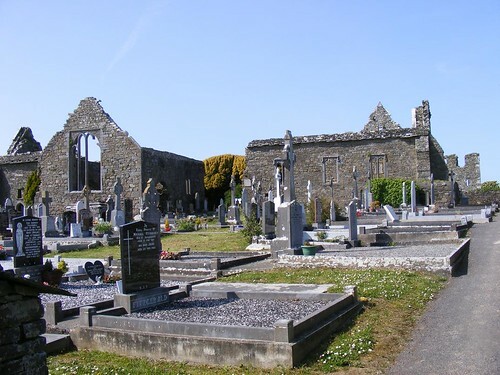 Ards Friary has always been a popular destination with tourists but I had never been before although I’d passed it many times as there are a selection of possible routes turning right from the N56 between Creeslough and Dunfanaghy. I decided now would be a good time for a quick visit. It’s further from the main road than I expected – probably about five miles, mostly hilly. The original Ards Friary (Ards House) was built in the early eighteenth century by the Wray family who had originated in Yorkshire. 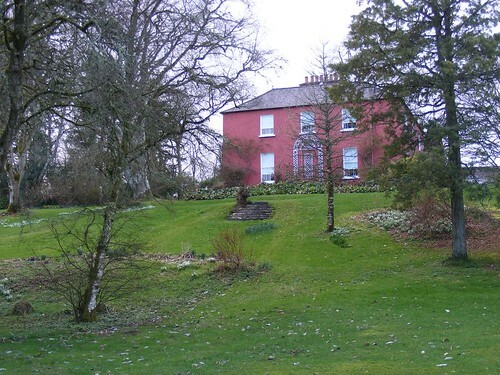 The house was sold to the Stewart family in 1780. 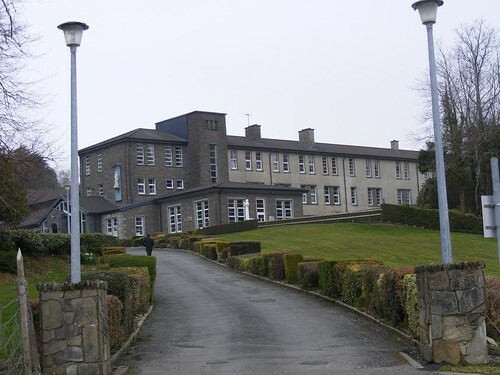 It was taken over by the Capuchin Franciscan Order in 1903 and re-named Ard Mhuire. It had become too small for the number of students; who came from as far away as the USA, Zambia and New Zealand and plans to extend it in the 1950s were abandoned and the new Friary was officially opened in 1966. The grounds would definitely be a very pleasant place to spend some time and many dog-walkers were in evidence. The road through the Friary also passes along the west side of Sheephaven Bay offering some very nice views and on the road out I noted what must have been the pier built for the sand export trade, although now sealed off by the council and described as an unsafe structure in the warning signs. It was now time to go home, I returned mostly on the same road I had come on, with some minor diversions through the grounds of the Glebe Gallery which I have written about in the past and around the Lough Garten area, still one of my favourite lakes although the skies weren’t that clear today to gain the best views. 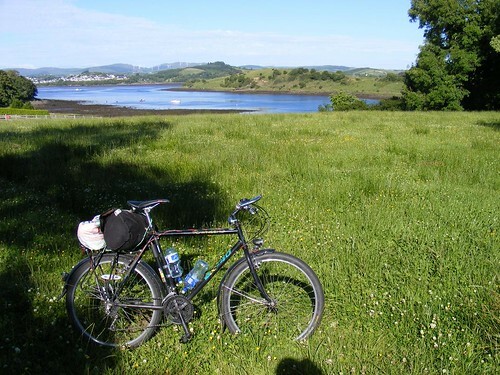 Over seventy miles covered, taking in lakes, mountains and sea. 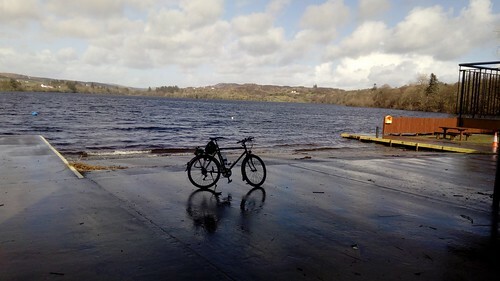 I realise how fortunate I am to live somewhere which such natural beauty easily accessible by bike and accessible by mostly traffic free roads, very different to Kerry or Connemara. 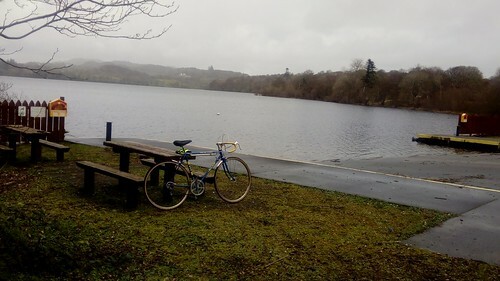 I’m still pleased with my old Townsend too, the novelty hasn’t worn off after a few hundred miles now and an early steel framed mountain bike is very usable and practical for anyone who isn’t racing and I simply could not have done today’s ride on a lightweight racing bike. A vintage roadster might just about work but it would have been murder on today’s route with no low gears. I suspect this is why most keen cyclists end up with a collection of bikes as no one bike can do everything but this one definitely works well enough for most purposes and I do not feel fitting the semi-slick tyres have made it any harder or slower on a normal road but have given the option of a bit of light off-roading. As for the Creeslough railway path, to be honest, it is more enjoyable as a walk. 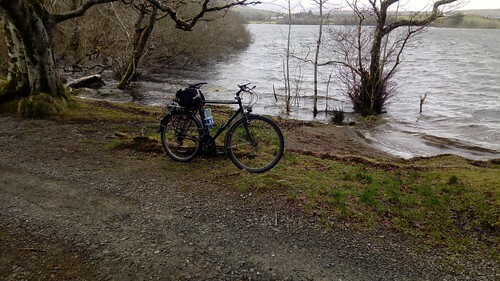 The current surface is not conducive to easy riding and it is not currently long enough for a decent length ride but maybe this will change in the future if more funding is found (and I hope it is). Mayo has shown what an asset these types of paths can be to a county if done well.